Not every centrepice has to be tall, in fact more and more of our couples are opting for low centrepieces. 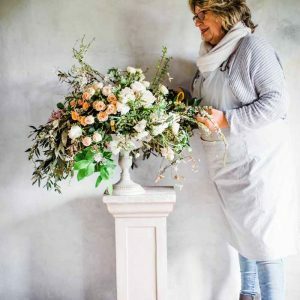 Low doesn’t mean any less WOW, footed bowls can look stunning on tables and I often design them with flowers cascading over the brim for a really full look. 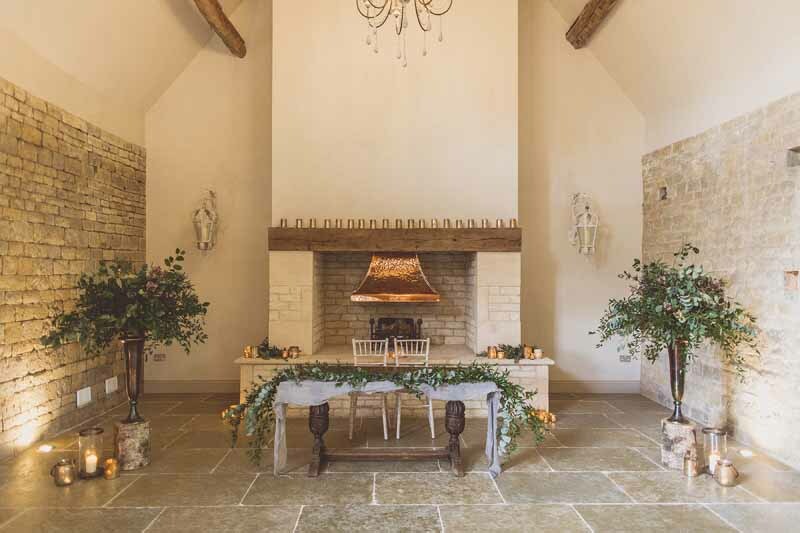 At Hampton Manor I recently showed some spring designs in footed bowls. 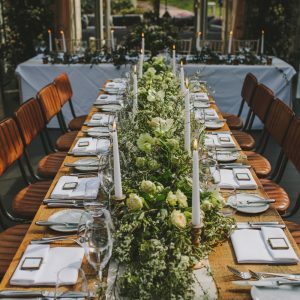 I displayed the same designs on both the bare wooden tables and clothed tables, deciding whether or not you have linen on your tables can really transform the look of the room so this is a great way to see how the same centrepiece can look different simply based on the linen and chairs. 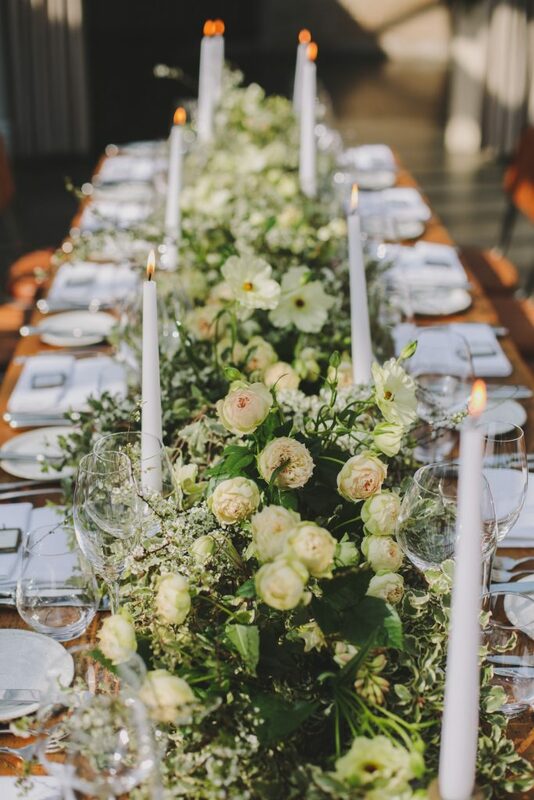 For the more traditional, classic look I placed 3 low centrepieces down the length of the table. 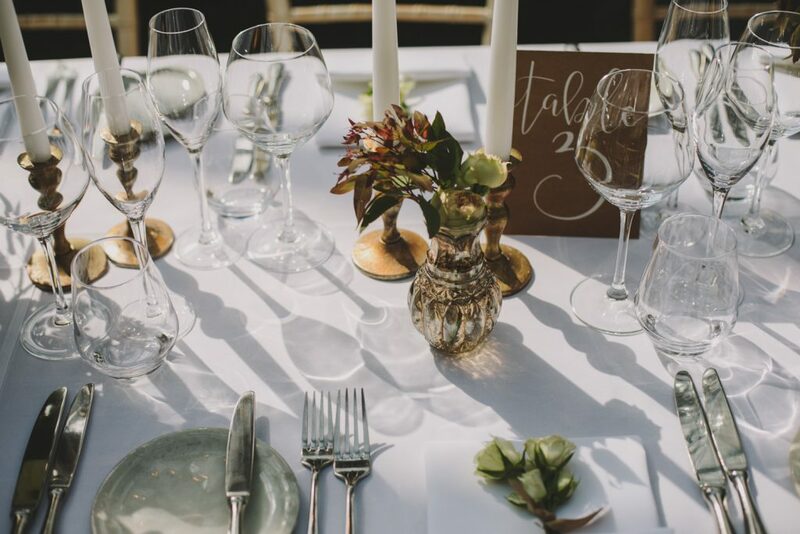 Bronze candlesticks, vases and tealight holders filled in the spaces between the footed bowls for an elegant look. 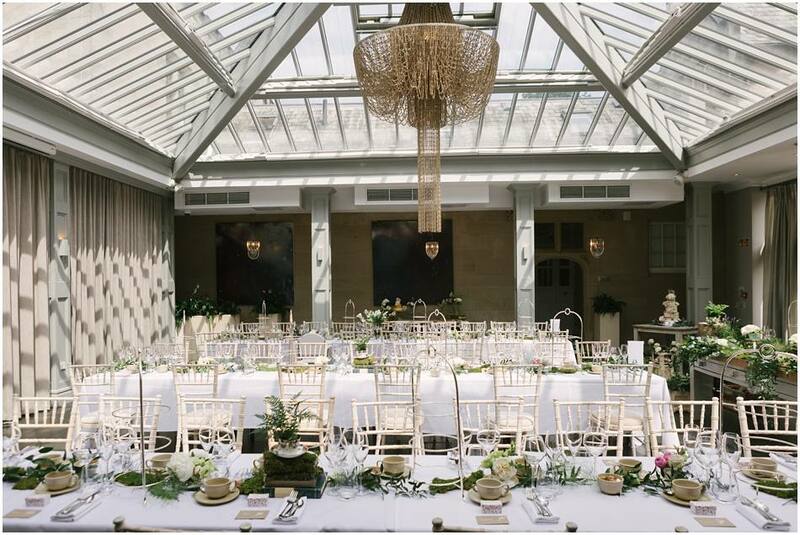 Hampton Manor had clothed the tables and used their Chiavari chairs for a more classic look. 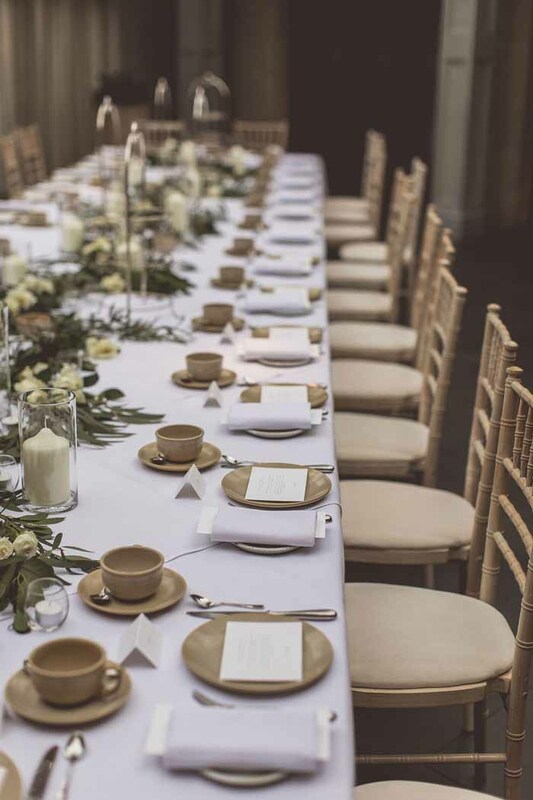 Here I have used the same design footed bowls, candlesticks and bronze vases but this time they are displayed on Hampton Manor’s new wooden tables and leather chairs. You can see how the bare tables really transform the look for a more rustic/industrial vibe. 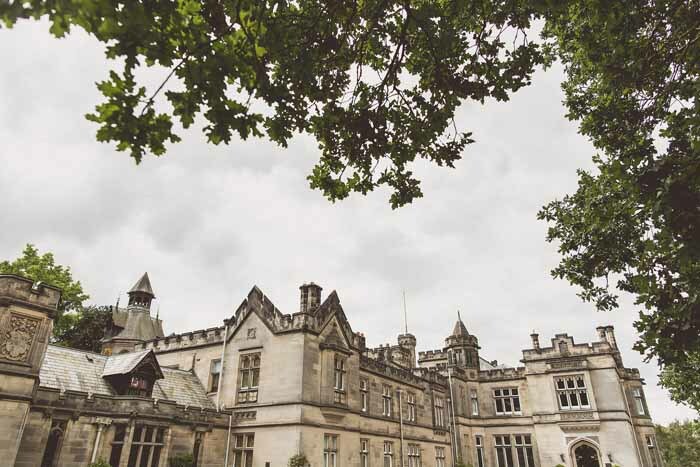 Both options are available at Hampton Manor. 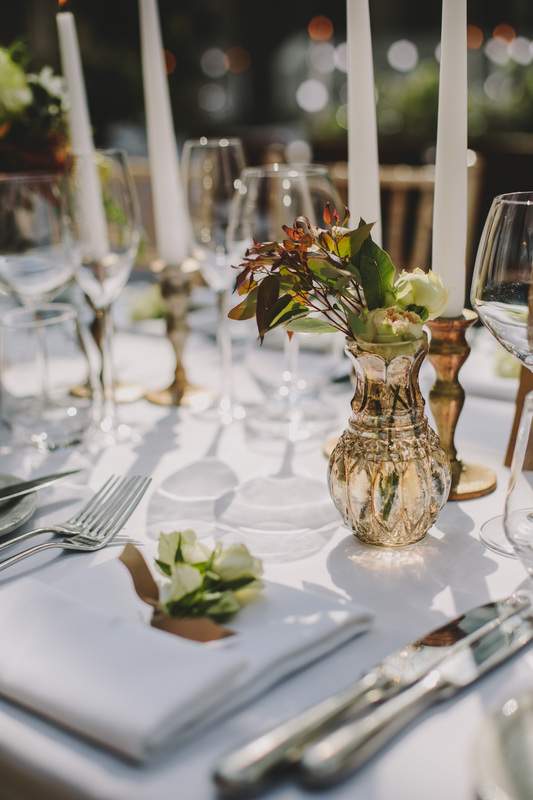 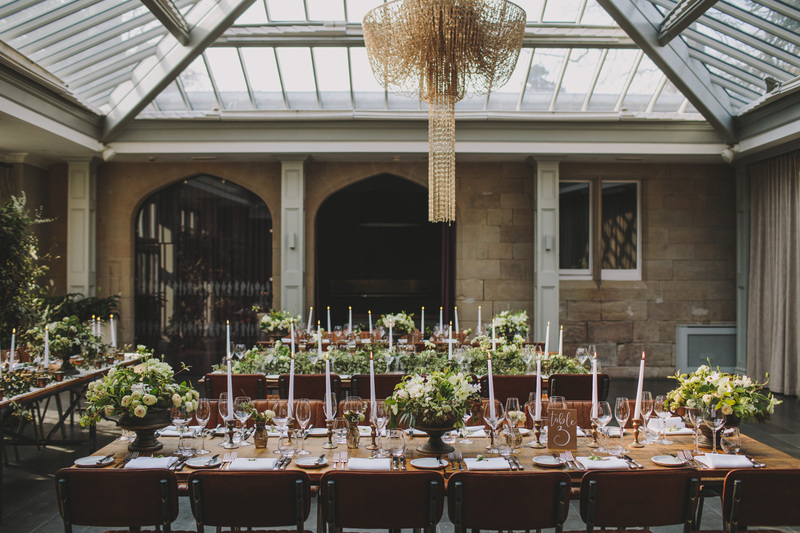 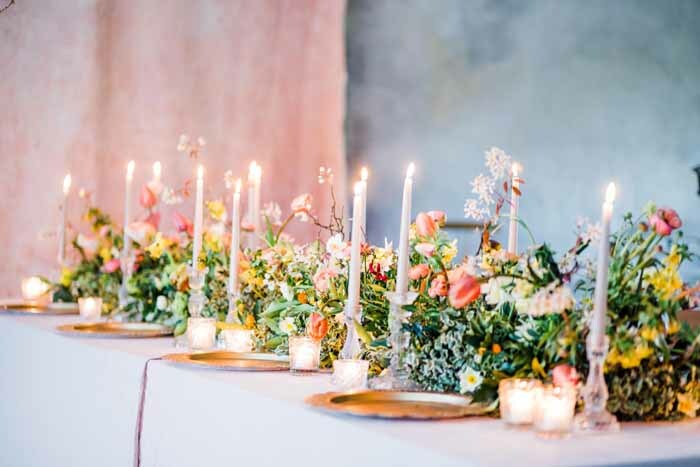 To co-ordinate the room the top table had one low footed bowl in the centre with loose foliage laid along the length of the table as well as bronze candlesticks and tealights. 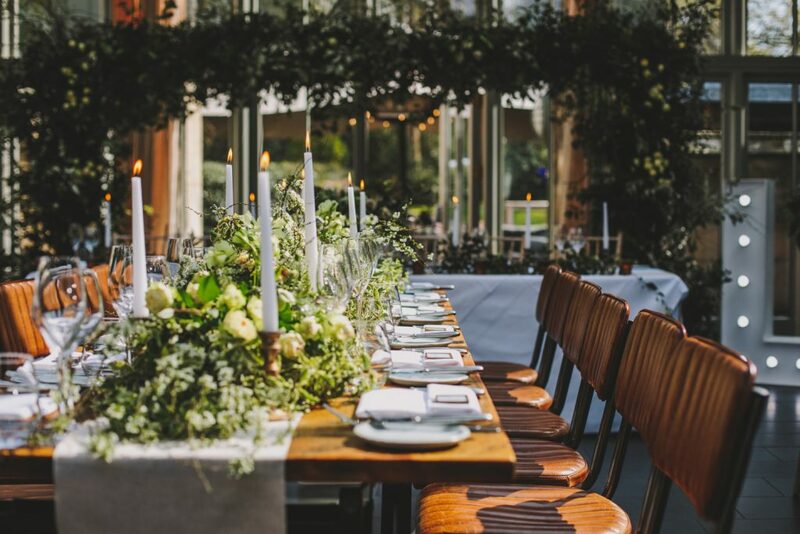 If you have chosen long guest tables you just can’t beat the classic look of a garland flowing the entire length of the table. 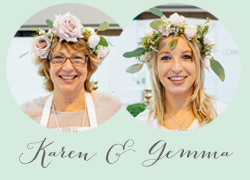 I created these garlands for Hampton Manor’s recent wedding fair on their new wooden tables, which I just love. For this design I opted for no floral foam, using a mix of foliage, roses, ranunculus and spring blooms down the length of the table. 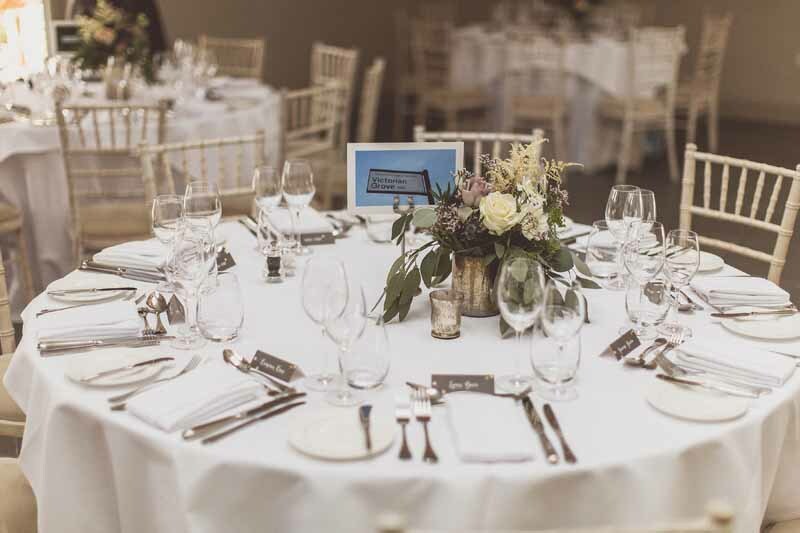 Candlesticks were entwined into the design and to finish off the wooden tables I added a natural cotton table runner and brass name place settings. 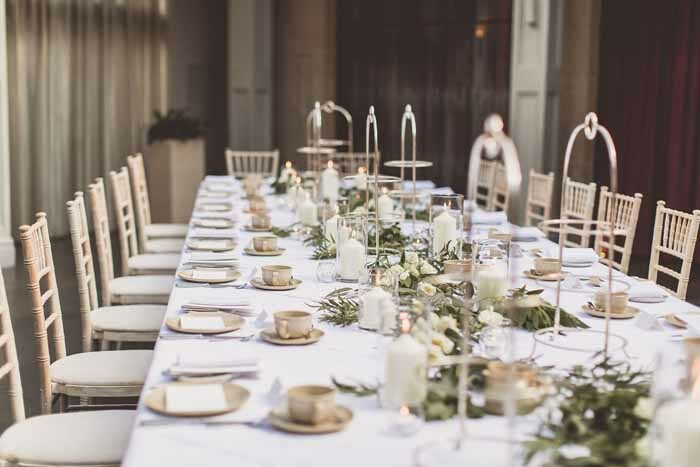 If you love this idea but have chosen round tables we could still incorporate this into your table design. 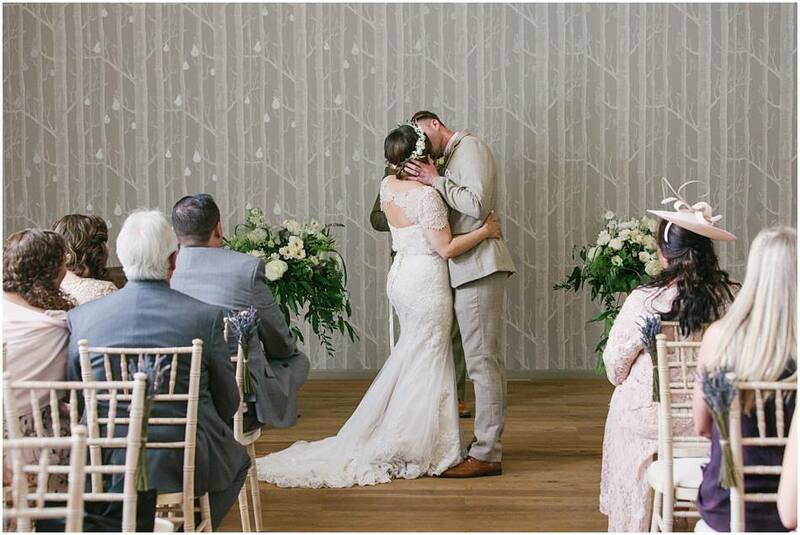 My new favourite backdrop! 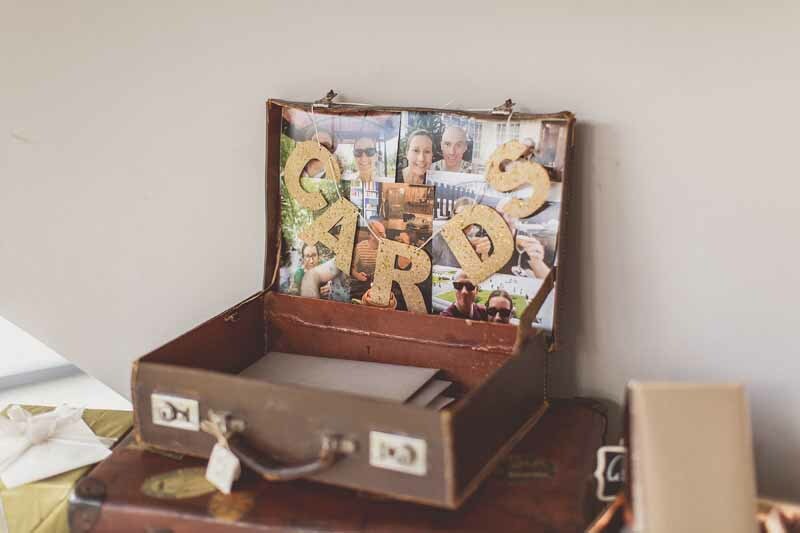 I have recently invested in a new frame which lets me create these epic backdrops for wedding venues. 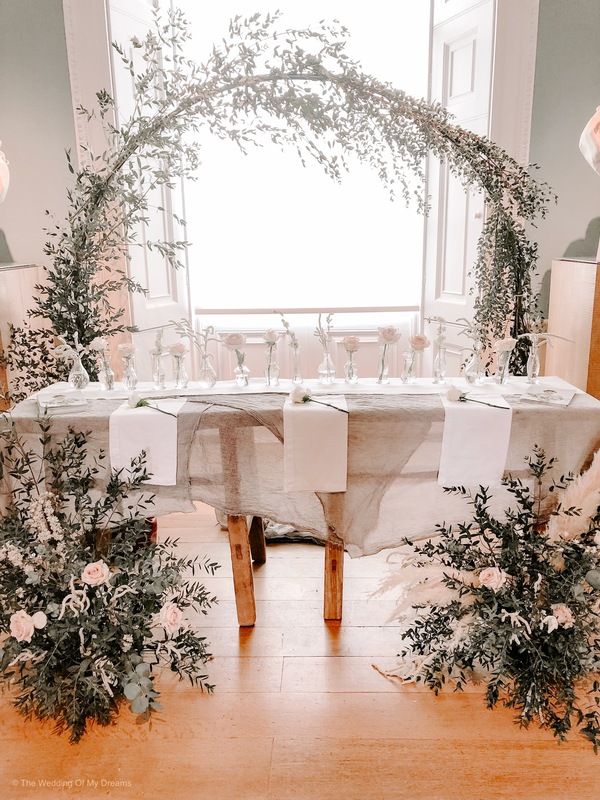 It’s first outing was at Hampton Manor wedding fair where I used it as a backdrop to the top table, I used mainly foliage for this design with touches of roses and blossom. 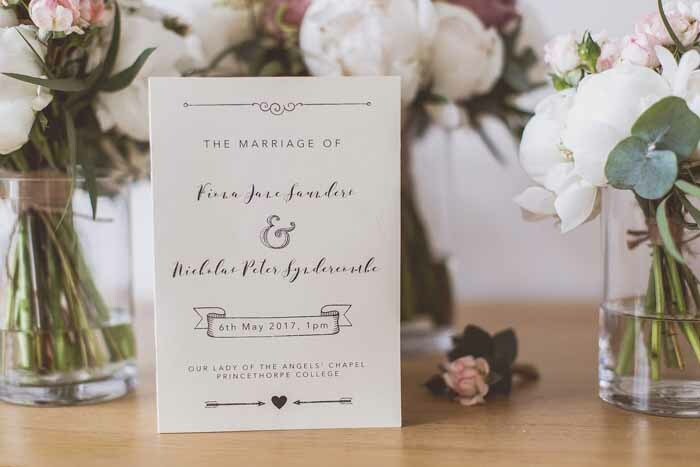 This design was completely foam free and therefore much kinder to thee environment. 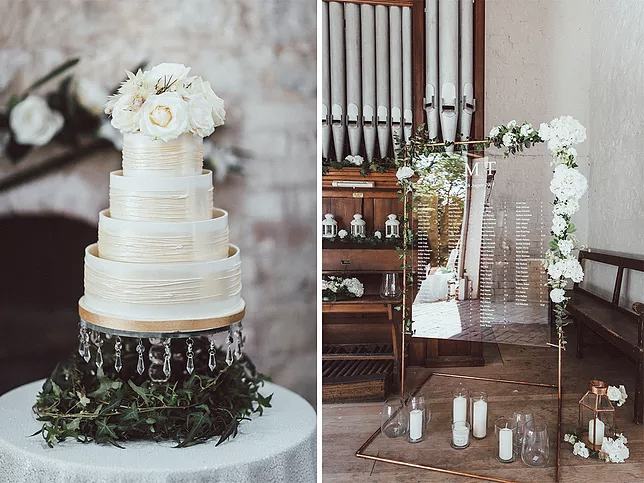 This idea could also be used as a ceremony backdrop or could be set at the entrance to your wedding venue or behind you wedding cake. 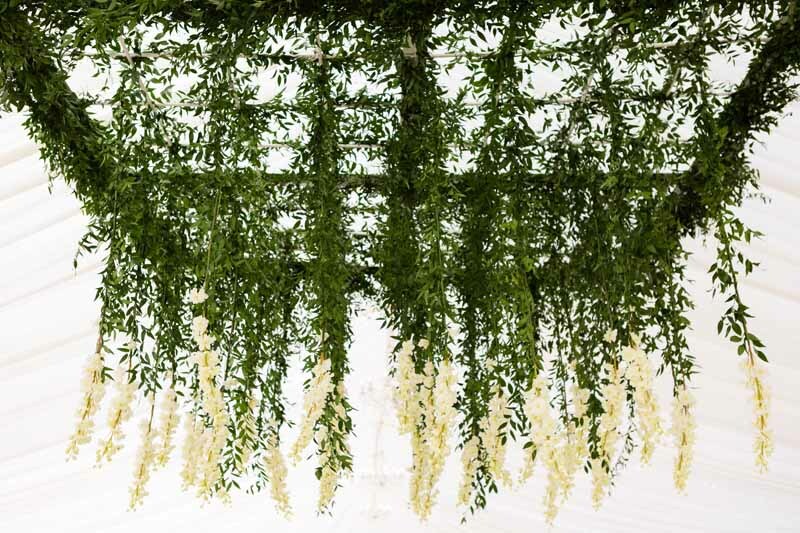 The frame is pretty flexible too so can be made to the size you require, it’s maximum height is 10′ and starts at 6′ and the maximum width is 12′. 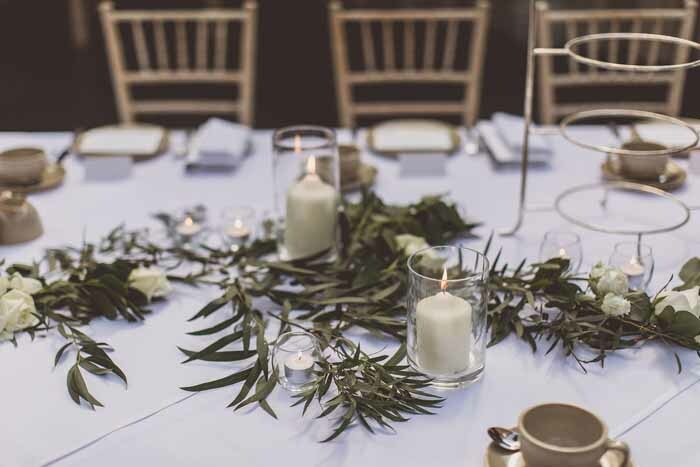 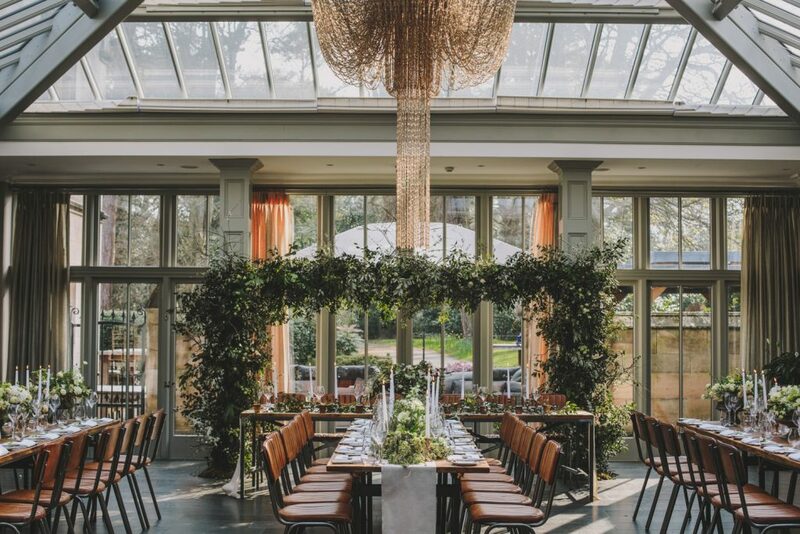 Garlands extending along a guest or top table are a firm favourite at weddings and provide a relaxed environment for any wedding celebration. 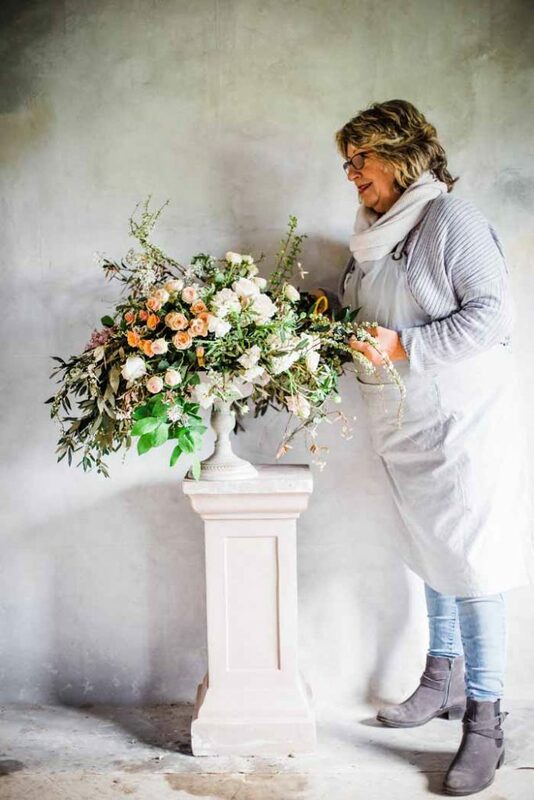 Picking up tips on making our designs foam free and more eco-friendly has been top of my list this year and so I was delighted to join other talented florists to spend a couple of days creating and learning with Sabine Darrall. 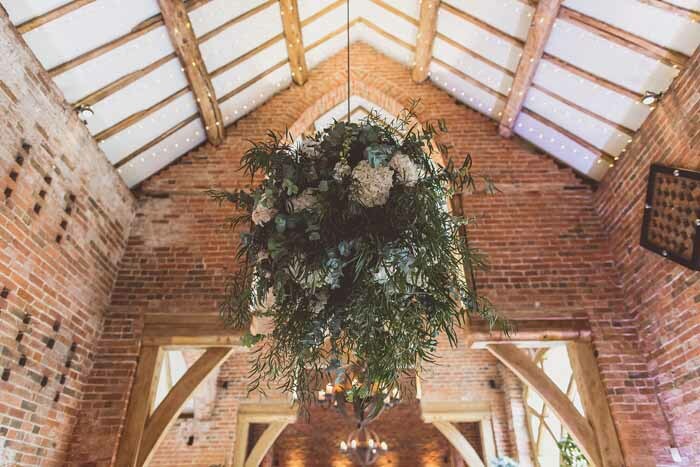 At many of our barn venues or in marquees we have the opportunity to create stunning hanging decorations for our wedding couples. 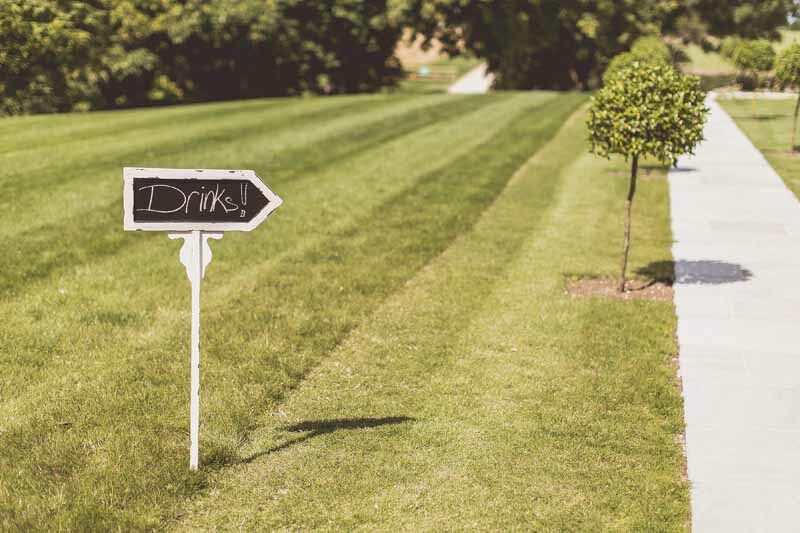 Again we now aim to make these foam free and more eco-friendly. The freshest of gathered foliages is always a good place to start and using flowers that will last through the wedding day. 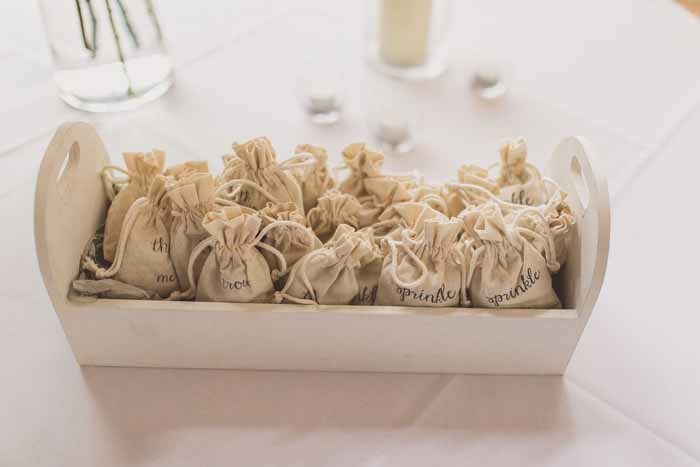 We usually hang these arrangements on the day of the wedding. 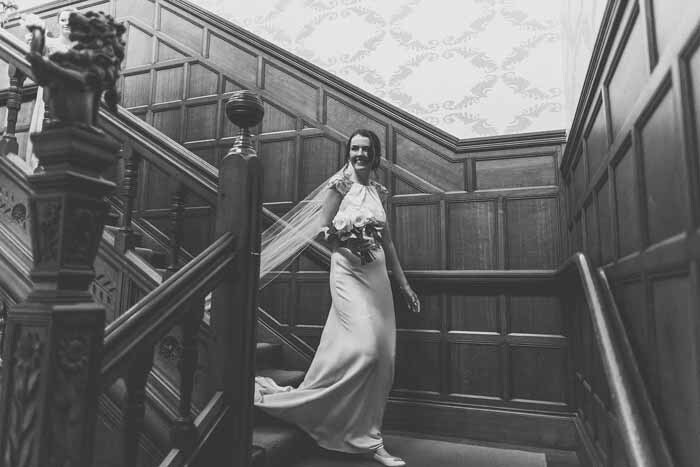 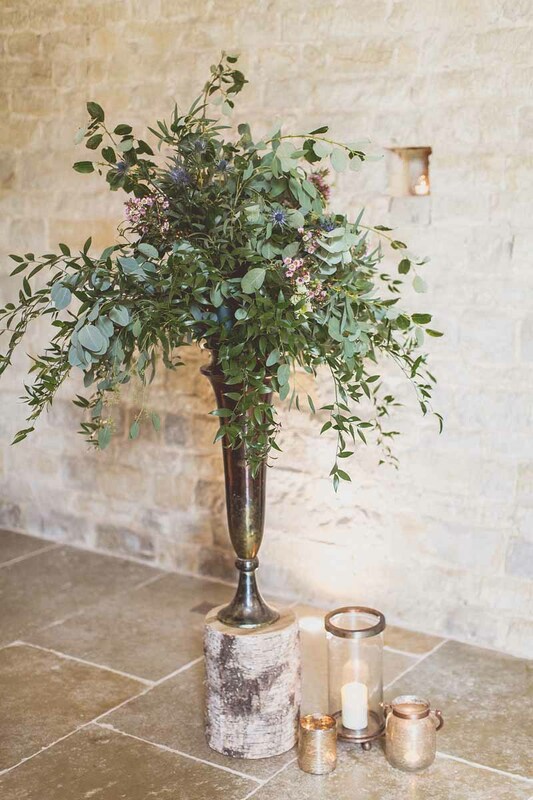 Most of our wedding work includes a statement urn or two, either for the church or ceremony, close to a top table or as a feature by a staircase. 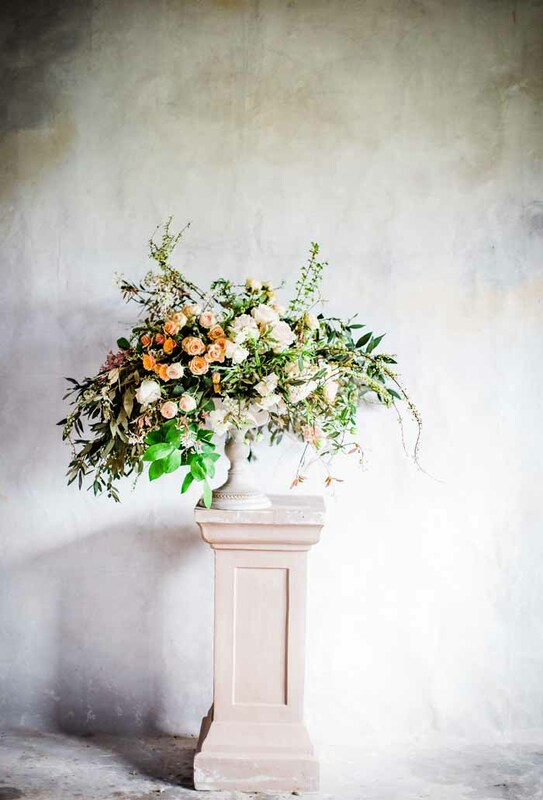 This style of arrangement is often the first look at your wedding and is a beautiful piece to be photographed by or enjoyed by guests. 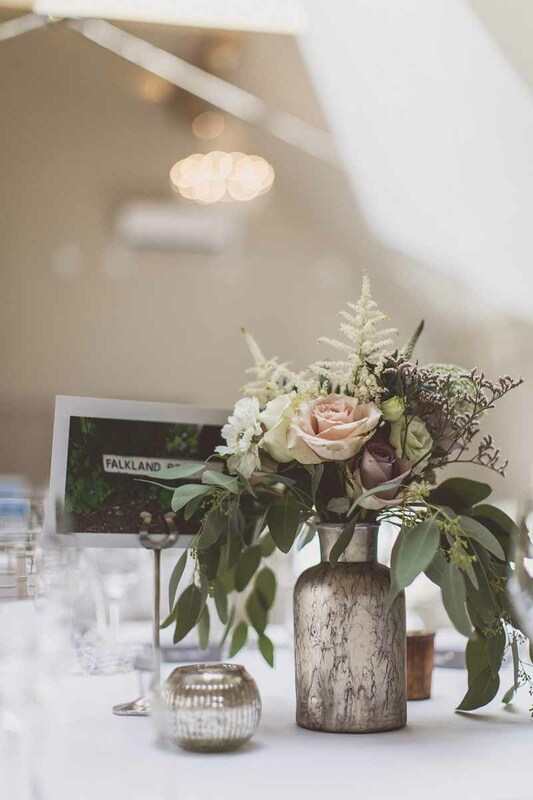 I loved creating this free form urn design using no floral foam and keeping our weddings more eco-friendly. 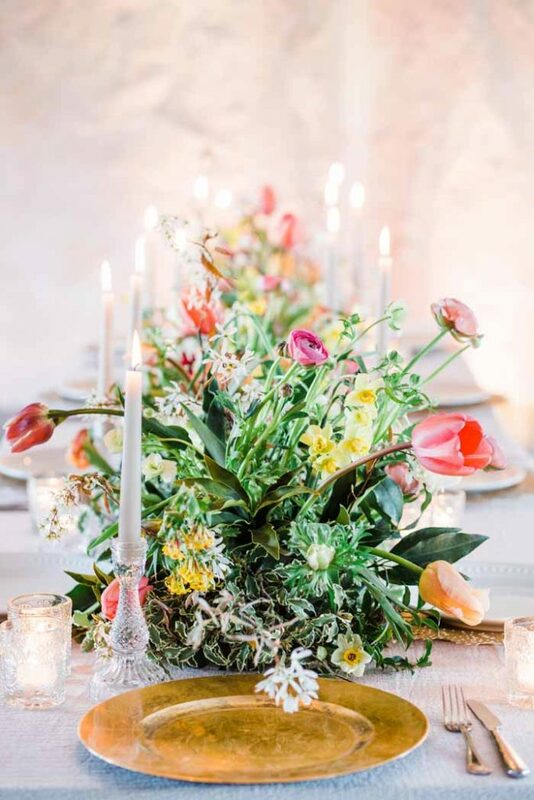 This natural mix was expertly captured for me by the talented Sabine Darrall whose courses I would highly recommend. 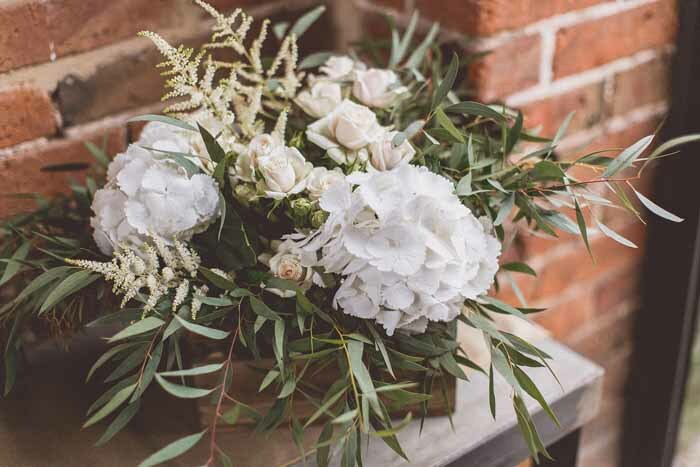 Working with a whole host of beautiful blooms enabled me to create the most natural free form bouquet for this spring bouquet I just loved the butterfly ranunculus and spirea. 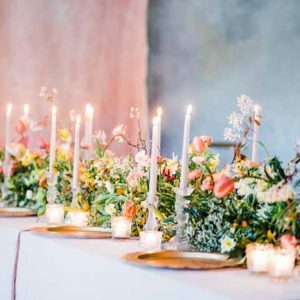 A wedding fair is an opportunity to meet newly engaged couples, existing clients and to show our skills at decorating a venue. 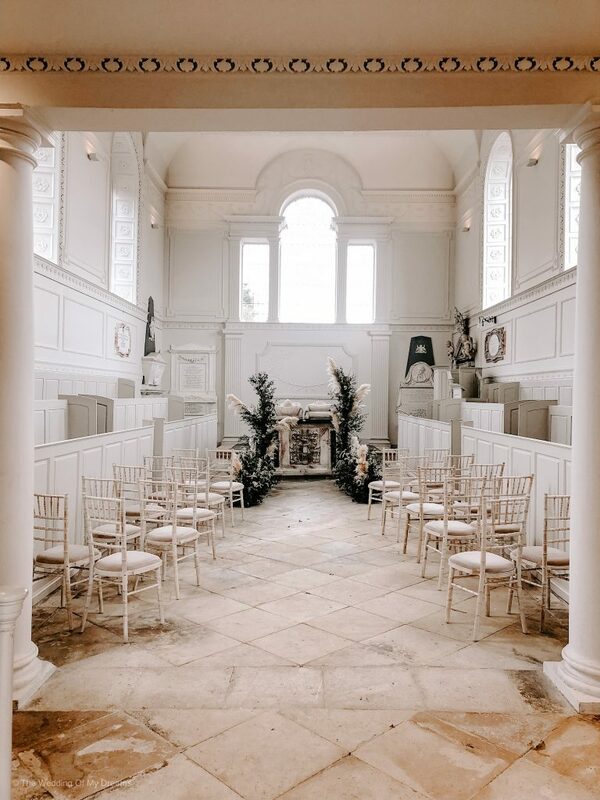 We loved the opportunity to decorate the Palladian style chapel at Compton Verney as well as decorating in the Adam Hall and Art Gallery. 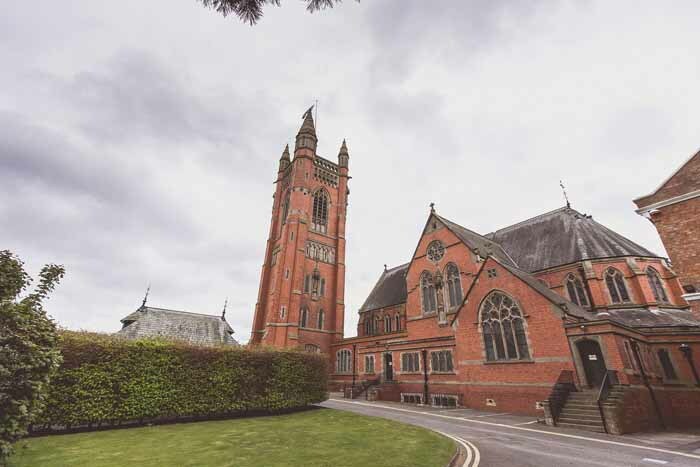 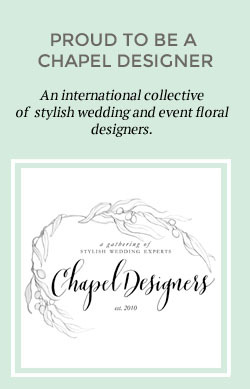 The Chapel was restored lovingly and is now a most beautiful space for a ceremony. 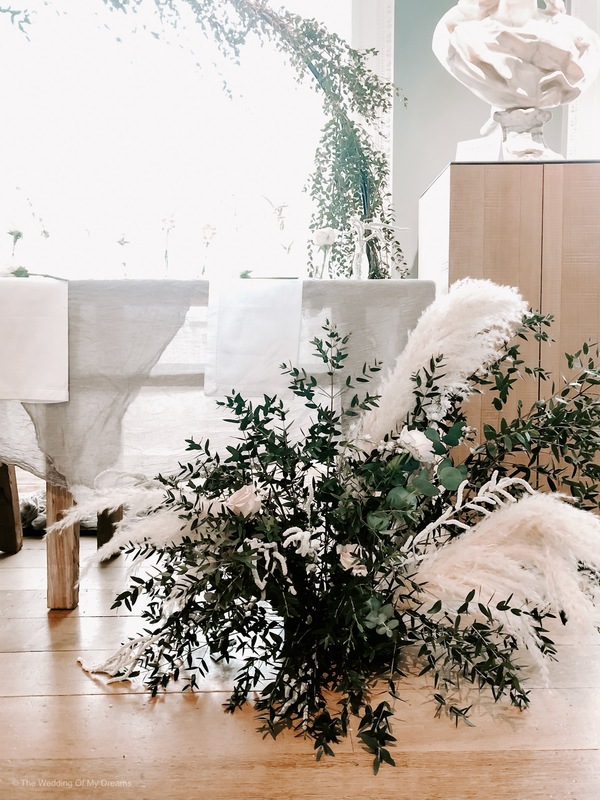 We designed a deconstructed arch to frame the ceremony with a naturally inspired mix of foliage, pampas grass, quicksand roses and delicate nigella. 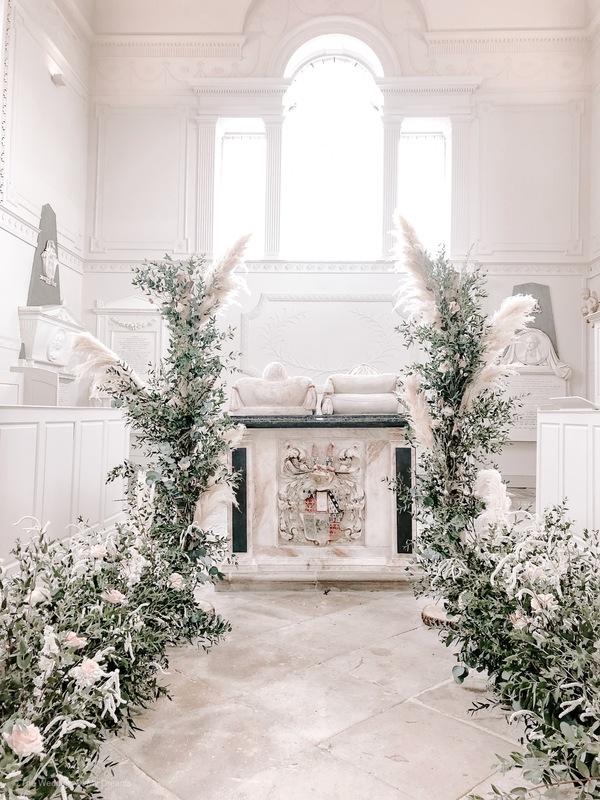 The aisle decoration flowed along the aisle with a relaxed walkway of foliage, amaranthus, quicksand roses and pampas grass. 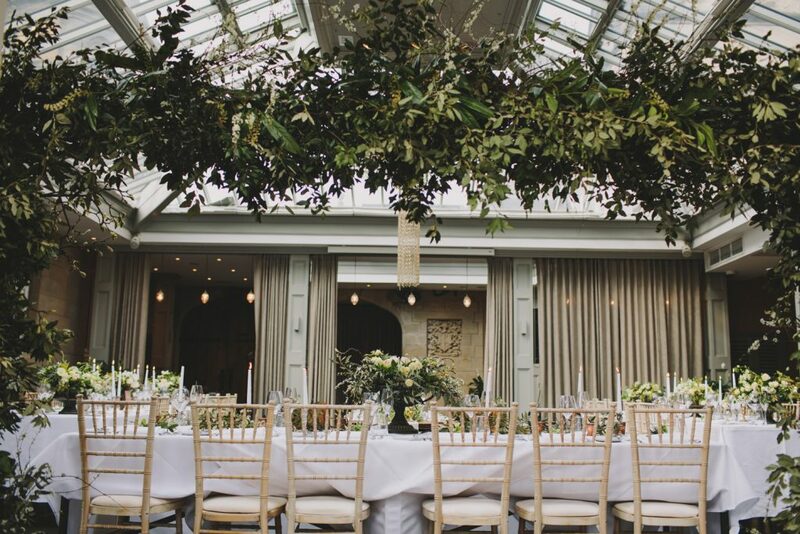 The elegant Adam Hall with its tall ceiling benefits from tall centrepieces. 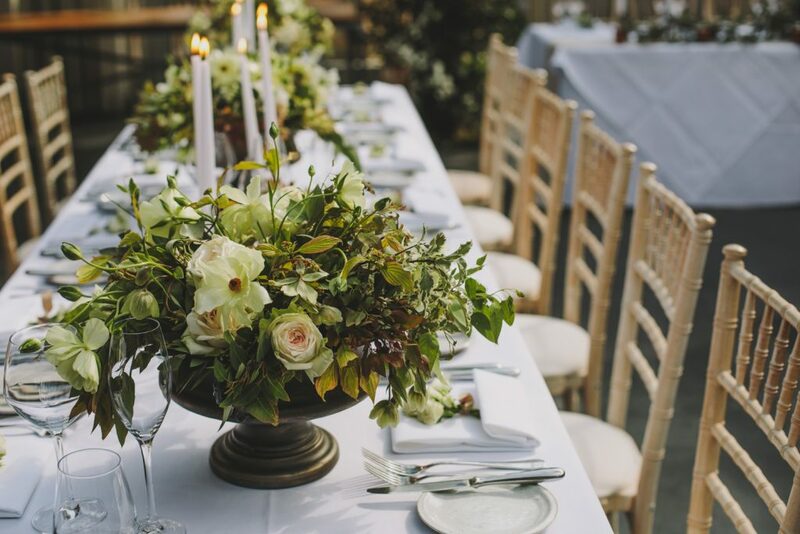 For a classic, elegant look we designed the arrangements with masses of green foliage and wedding favourites scented garden roses, spray roses, ammi and lisianthus. 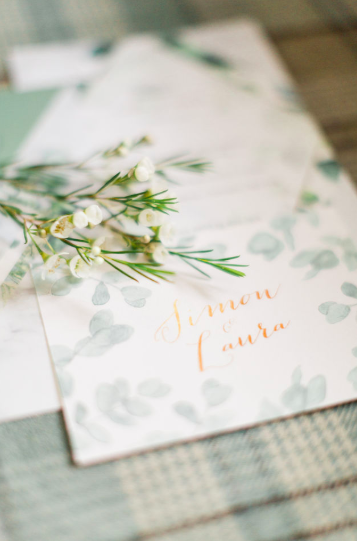 For a spring look we added alliums and blossom. 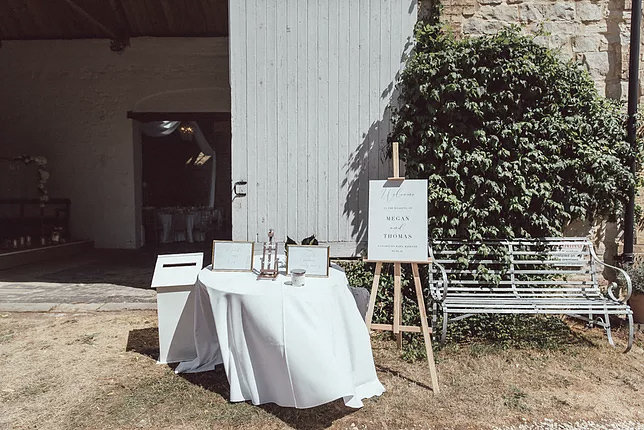 The white floral stand is the perfect height to allow guests to see each other across the table and is also available in gold, and copper to work with your wedding colours. 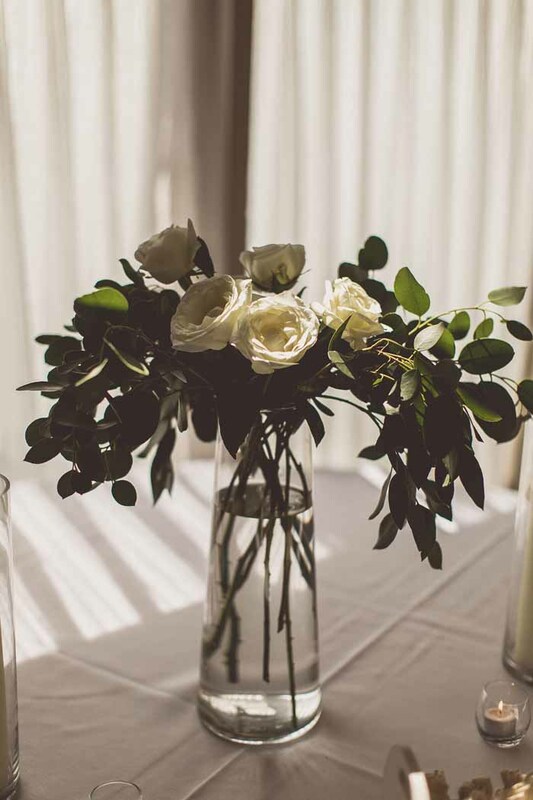 Small white vases with single stems add interest at table height. 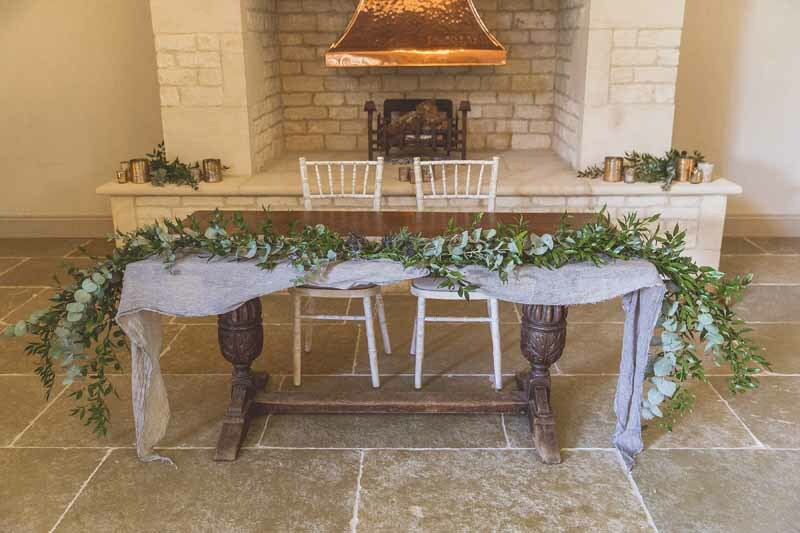 The moongate was decorated with a delicate eucalyptus foliage for a light display keeping the look fresh and inviting. 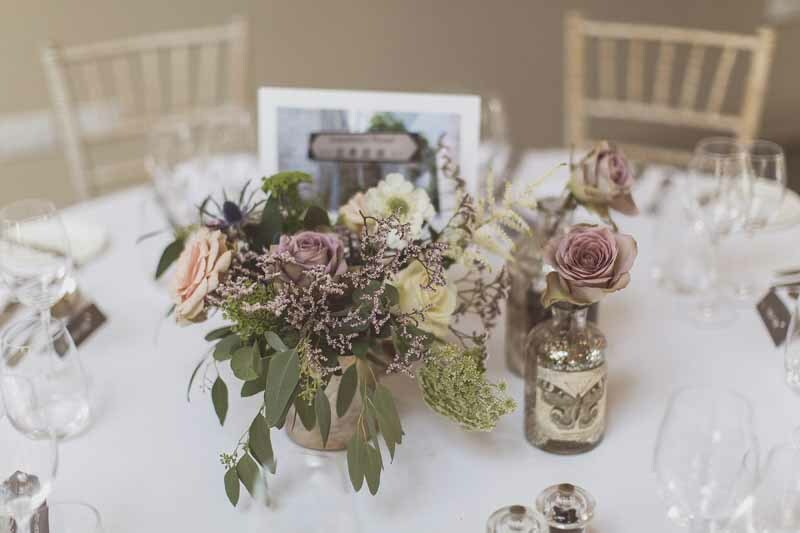 Buds vases placed along the table with roses, amaranthus and dried delphiniums continued the look. 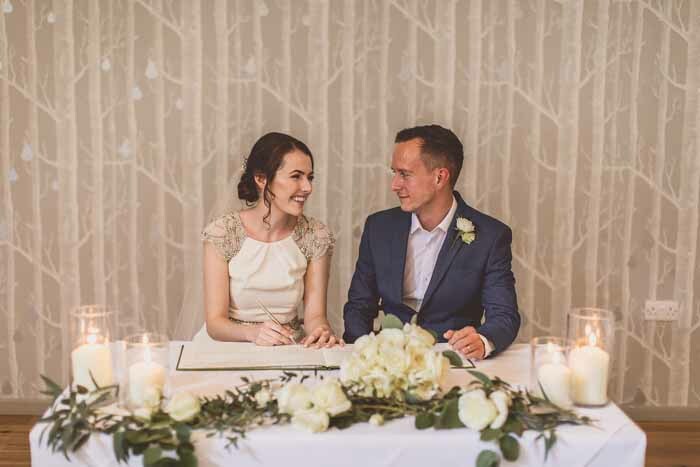 The moongate back drop is perfect for a ceremony or behind a top table, sweetheart table or to frame the cake table. 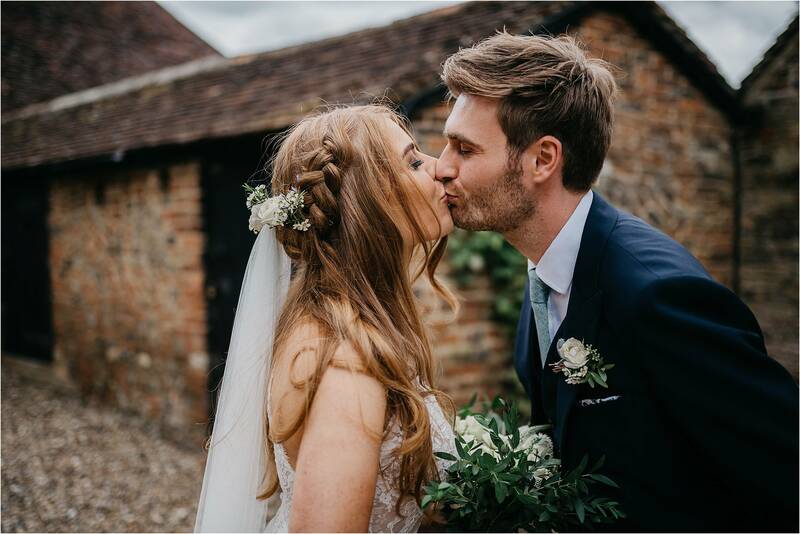 One of the joys of the start of the year is that we have chance to cherish the photos of our weddings from the busy wedding season. 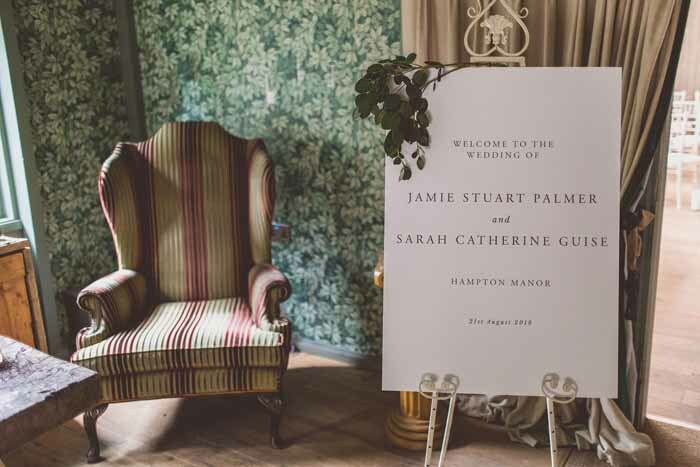 Just take a look at the beautiful, elegant wedding of Sarah and James at Hampton Manor. 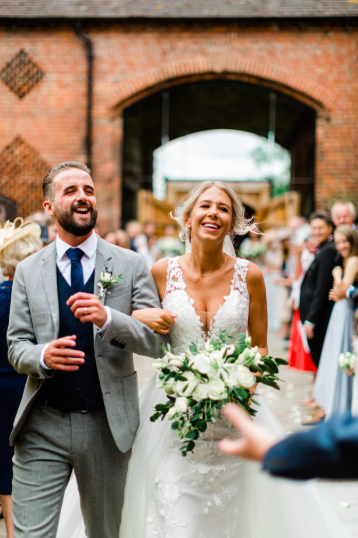 This couple are what weddings are all about having the day you wish and plan for and enjoying every single moment, they are the most lovely pair inside and out. 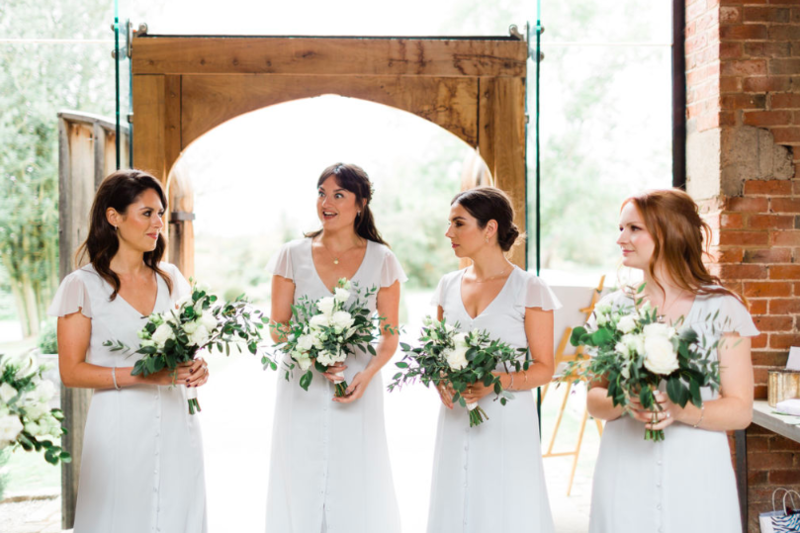 Sarah had her heart set on an all white and green look with elegant bouquets for her and her maids. 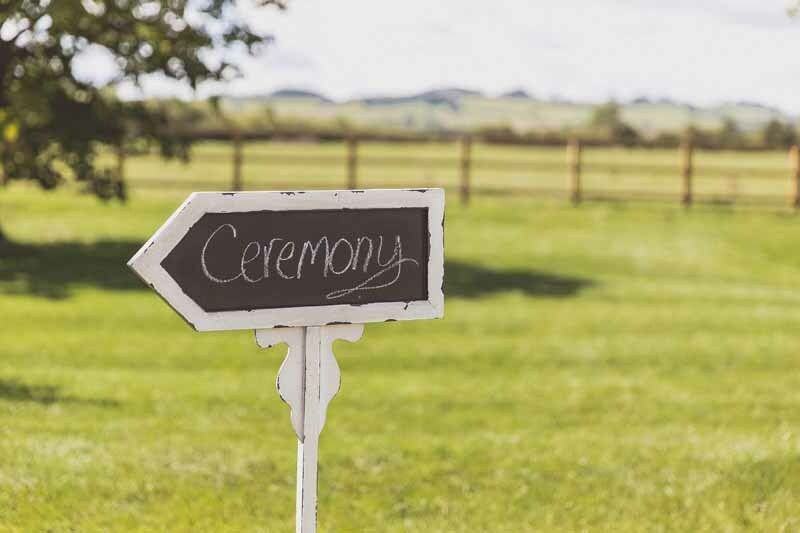 The white signage and soft green foliage provided an elegant welcome to the ceremony. 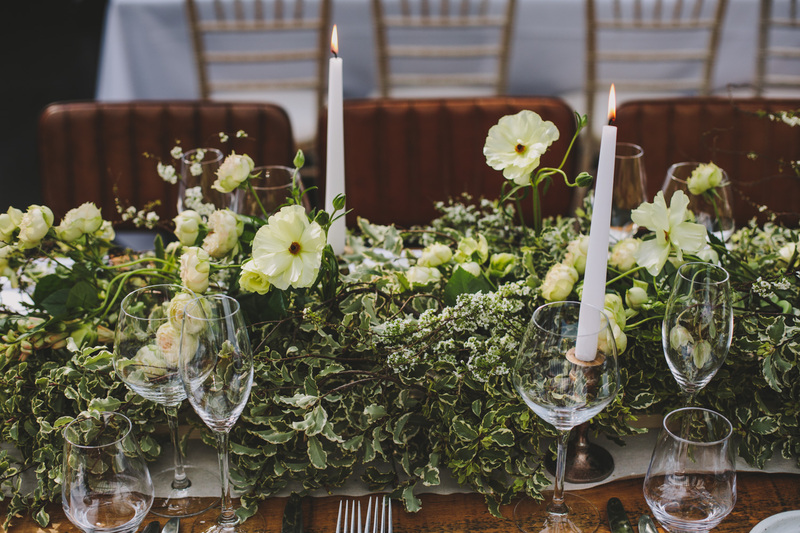 Simple and understated is often best for an elegant look. 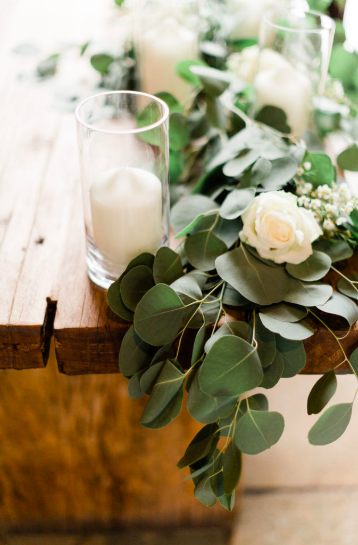 Candles, confetti and an elegant vase with roses and eucalyptus was awaiting the confetti moment. 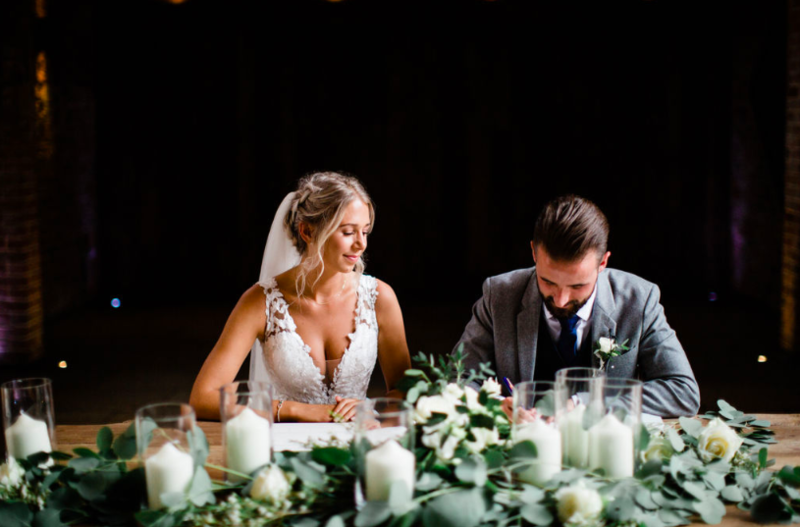 The simple garland and candles to the ceremony table framed the couple as they signed the register after they had tied the knot. 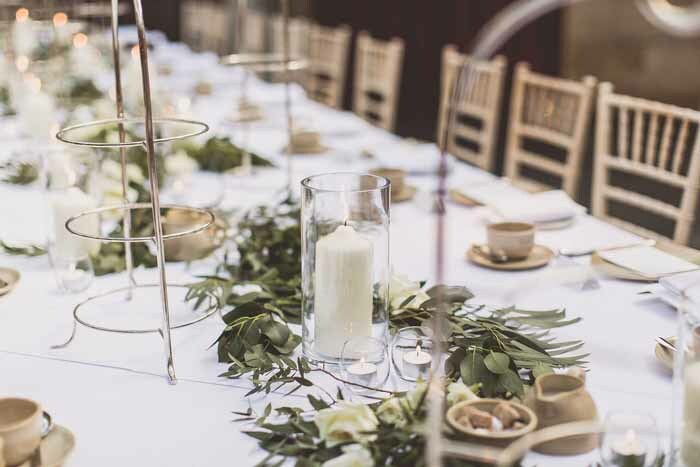 One elegant long table was chosen for this intimate wedding celebration with cake stands, foliage and scented white blooms with candles to add to the romance. 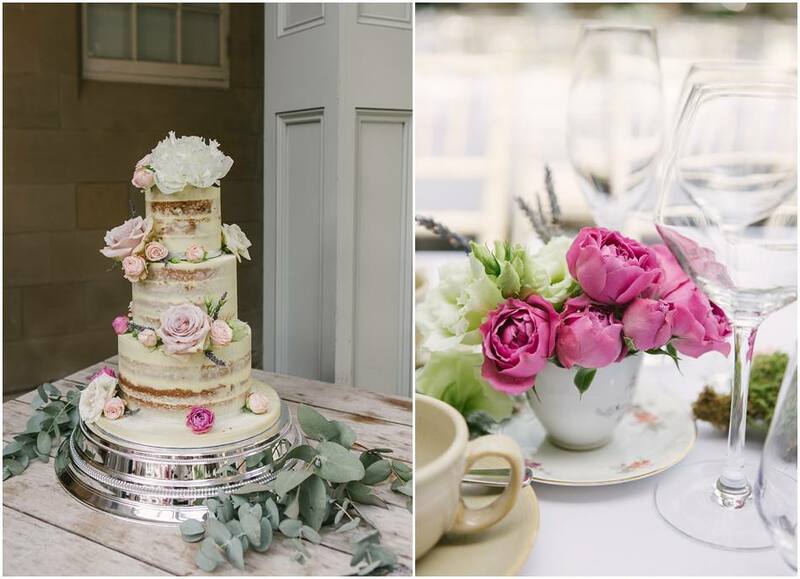 The look continued on the wedding cake table with loose laid flowers and foliage and a decoration of roses and foliage to the cake. 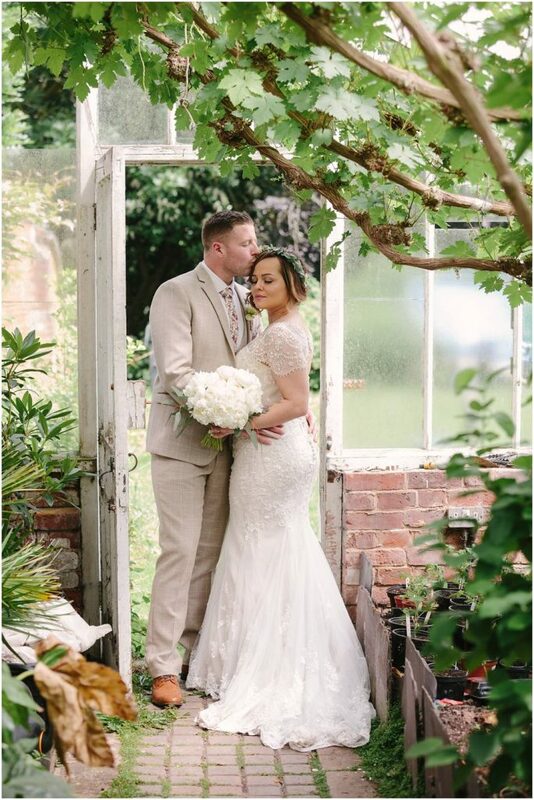 The sun shone all day long for this happy couple and the setting at Hampton Manor held so many places for their beautiful photos. 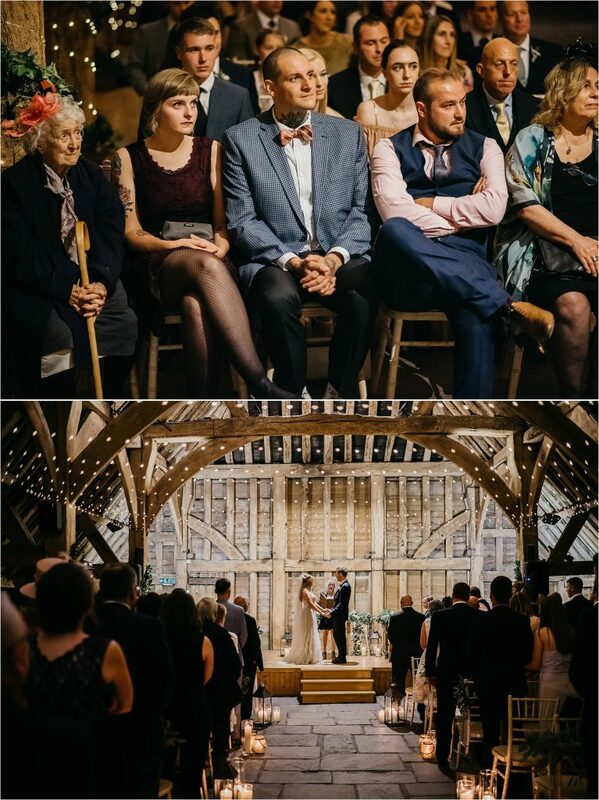 Sarah was the most thoughtful bride and sent this lovely message the morning after her wedding. 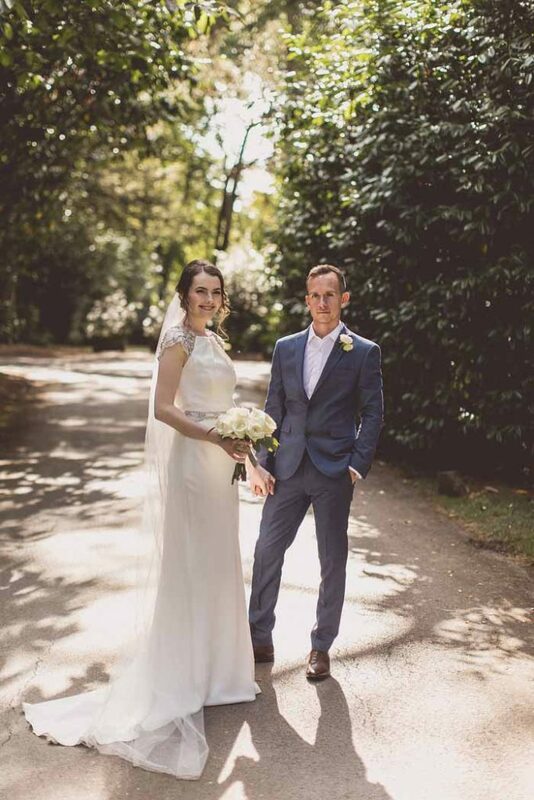 I can not put into words or thank you enough for your work yesterday. 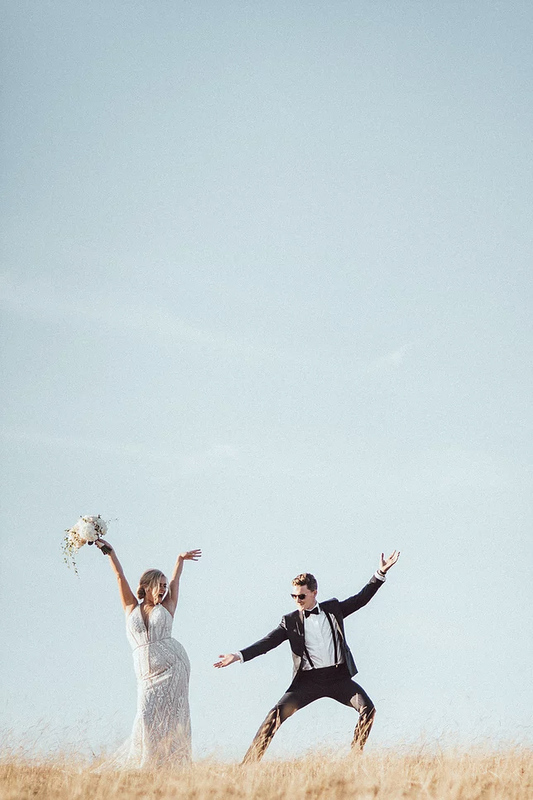 You are so incredibly talented. 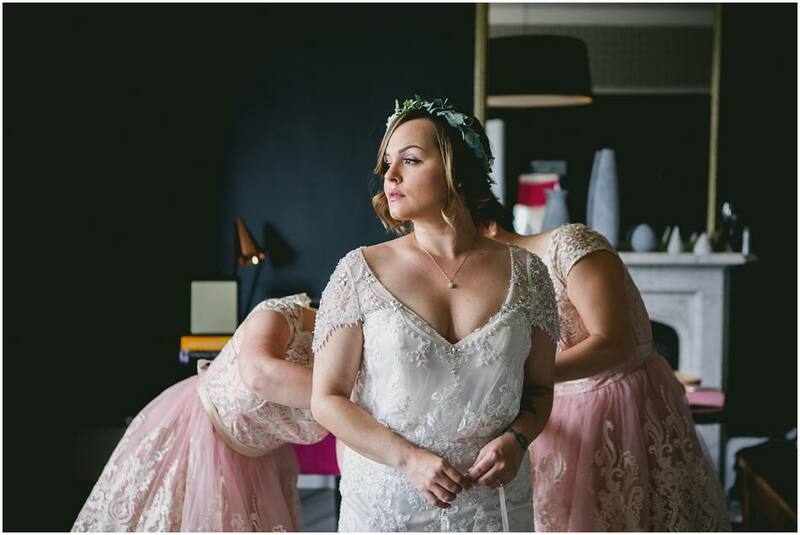 From our first meeting I came away with complete and utter confidence in your work. 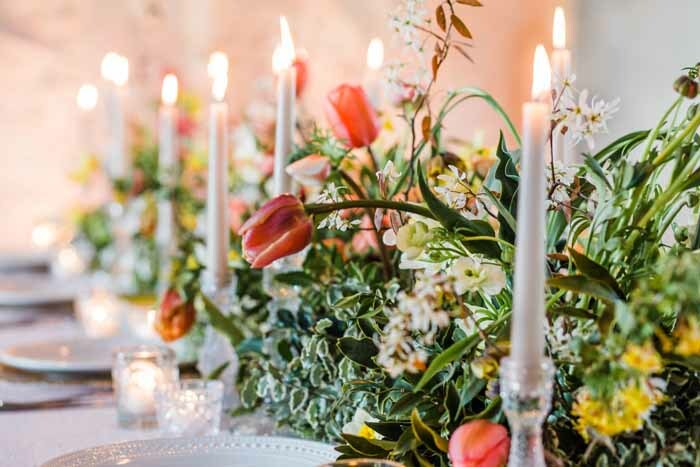 I even said to family and friends that it was like you could read my mind as you just understood my vision from the offset. 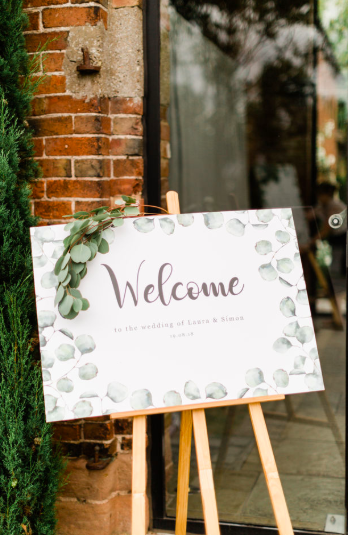 From my bouquet, to the candles, ceremony room, Elizabeth’s court and even the foliage on the welcome signs every single detail was EXACTLY how I envisioned. 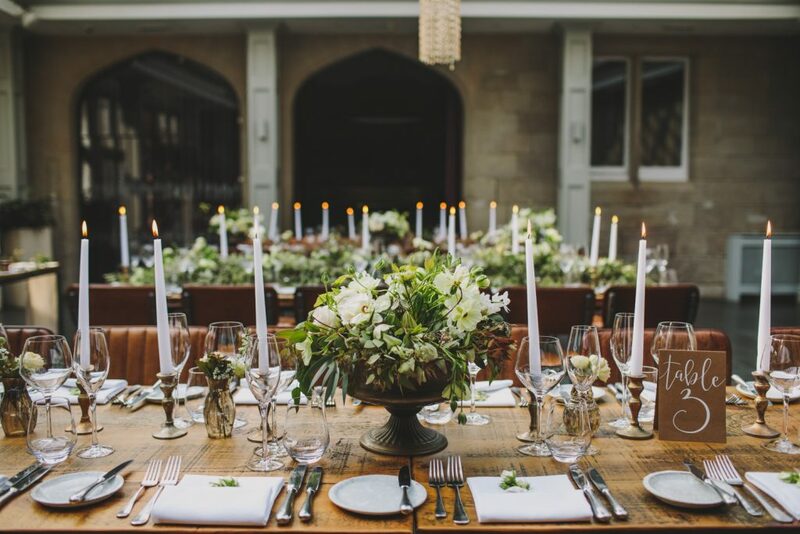 I was looking at the table at 11pm candles were still burning, creating the most wonderful evening ambiance inside and outside Elizabeth’s court. 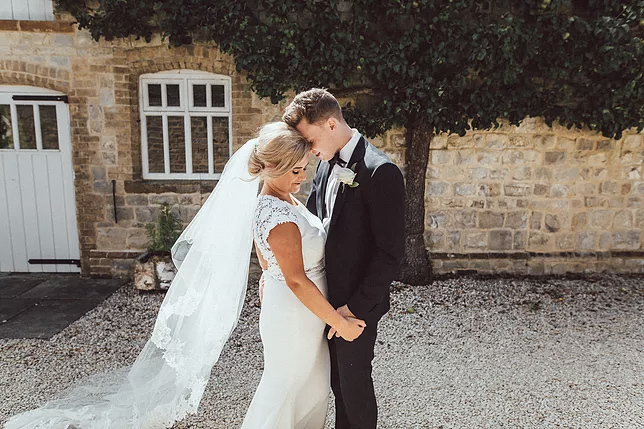 I can’t thank you enough for everything you have done for us and I am so so happy to have had the opportunity to work with you and have you part of our wedding journey. 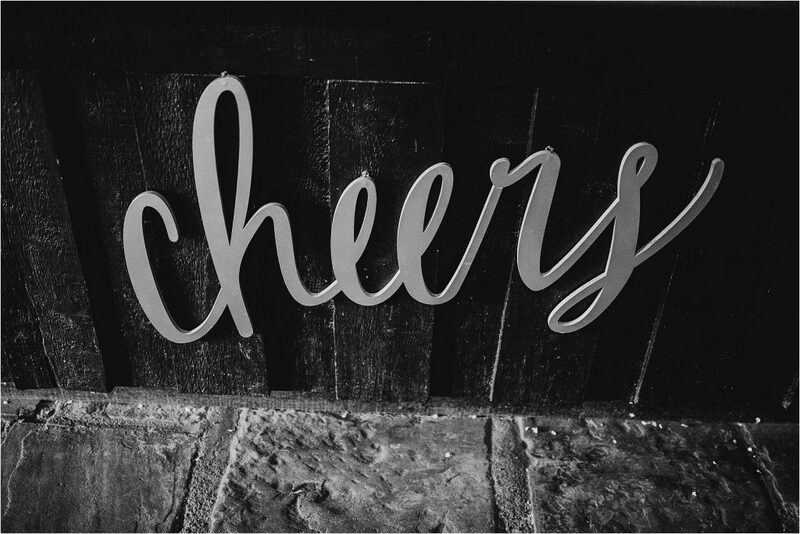 You are inspirational! 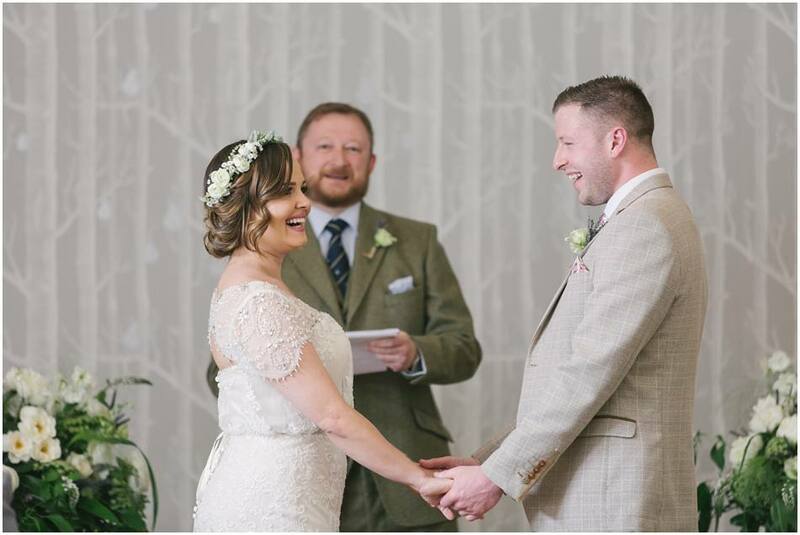 Fiona and Nick chose to hold the wedding ceremony at Princethorpe College followed by a reception at Shustoke Farm Barns. 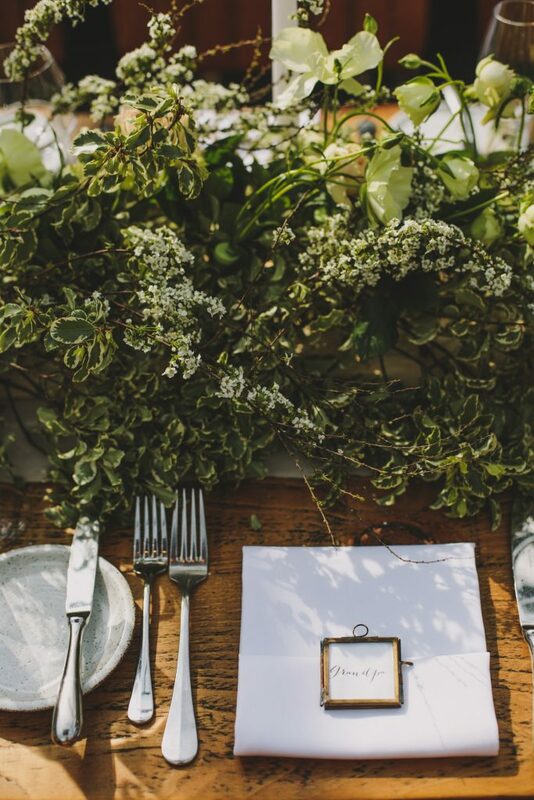 Natural twine was used on the cute button holes to add a rustic twist with spray roses, tiny succulents and a snippet of eucalyptus. 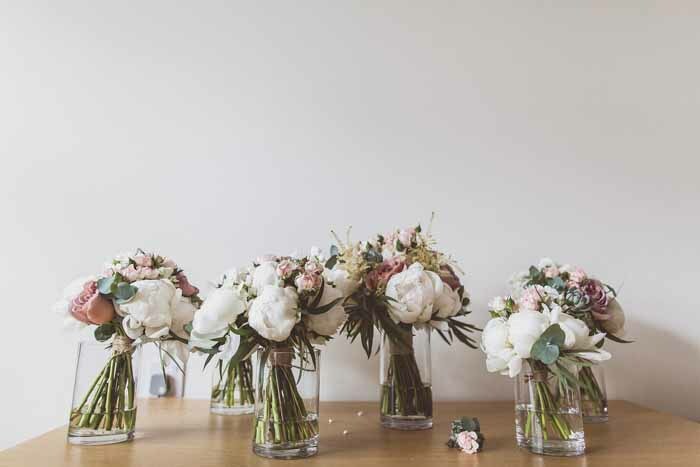 Peony season is always a treat for the senses and these bouquets full of scented peonies, roses with added textures looked great for a dusky pink and white colour scheme. 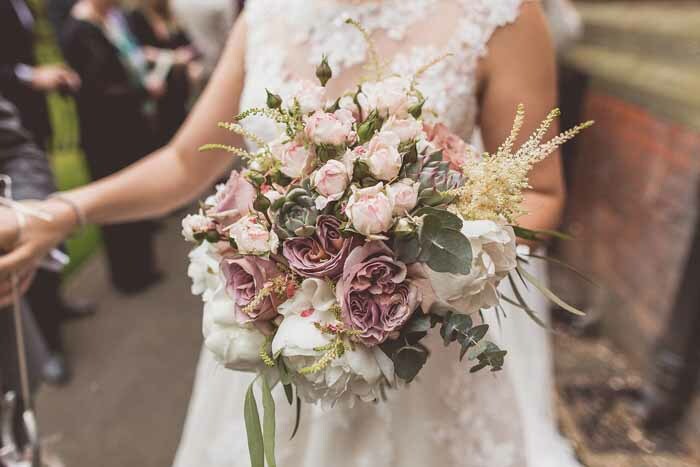 The bouquets had the addition of feathery astilbe, succulents and spray roses to create a beautiful mixed summer bouquet. 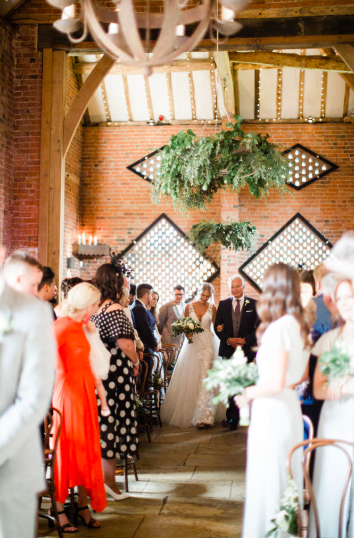 The chapel at Princethorpe was a grand setting for the wedding ceremony and suited lush, natural flowers on wooden stands to frame the couple. 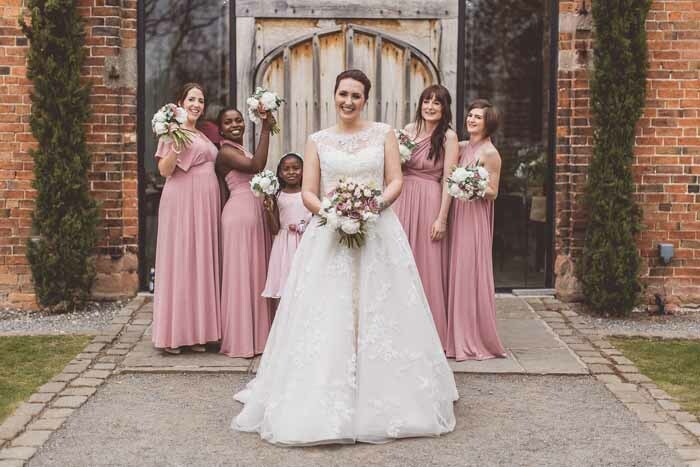 The entrance at Shustoke is great for a bridal party shot with the mix of rustic bouquets and posies for the bride and her girls. 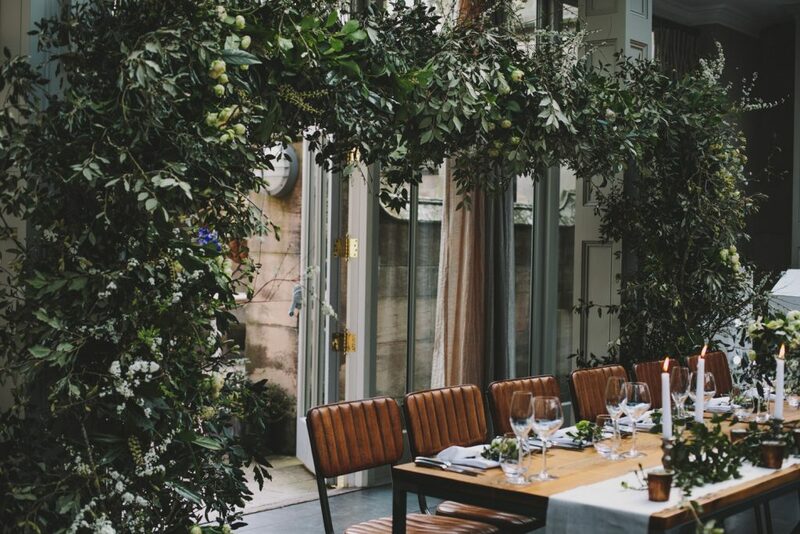 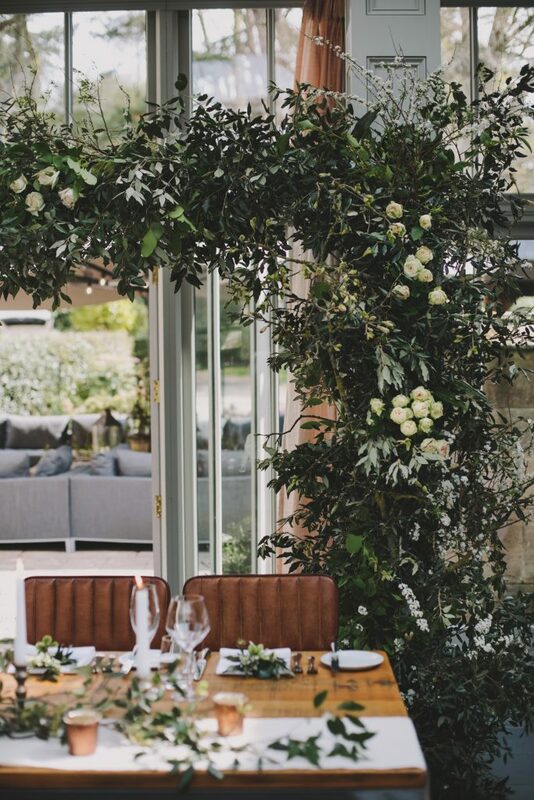 We always suggest a hanging installation at Shustoke and this flower globe was a stunner, masses of eucalyptus and blousy hydrangea give a perfect welcome for guests that can be enjoyed all day. 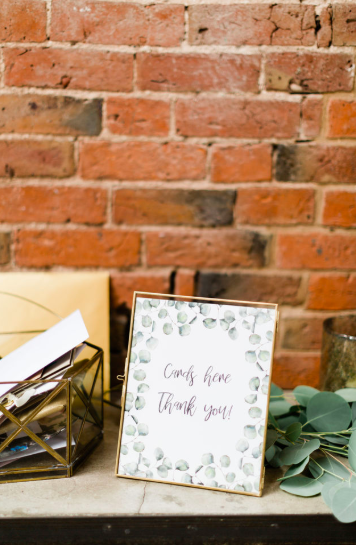 Welcoming guests a rustic crate with relaxed flowers and foliage continued the look. 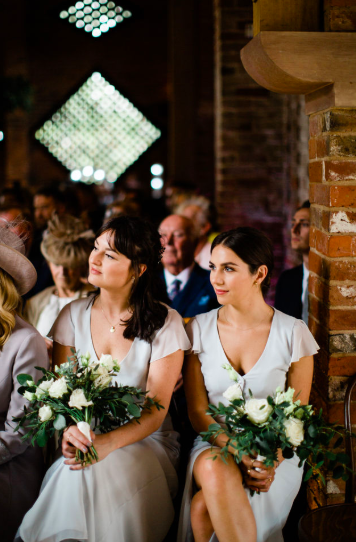 It is always key to keep your look going throughout the day and this was a lovely welcome after the church service. 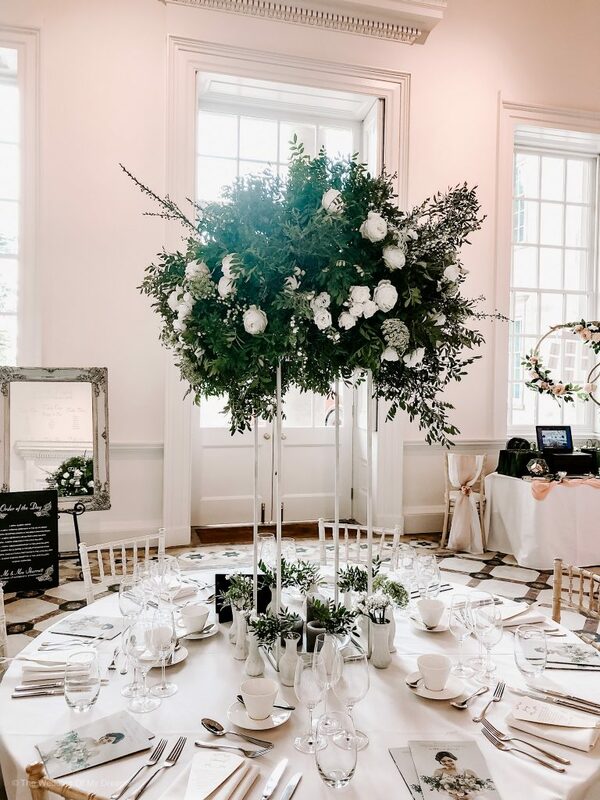 The oval top table continued this look with a beautiful mix of flowers and foliage the full length of the table. This gorgeous wooden door at Hampton Manor is in the main dining room of Elizabeth’s Court. 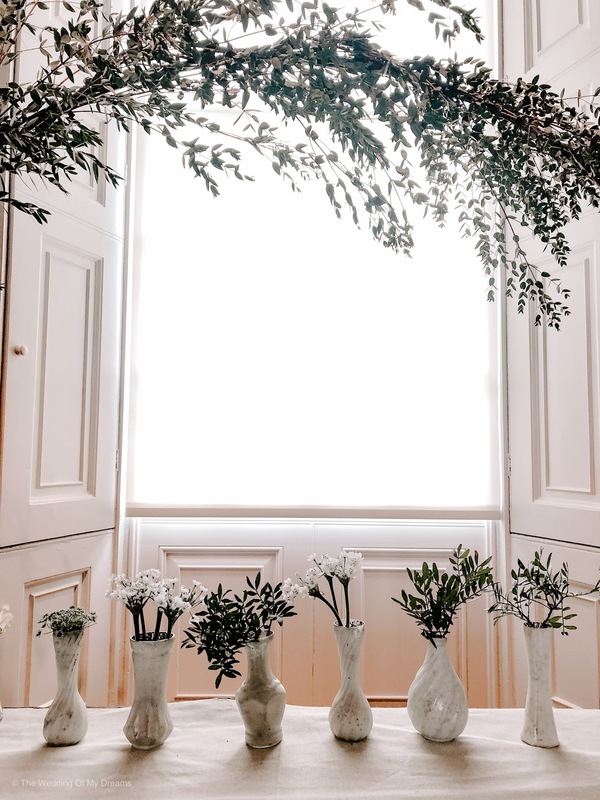 I’ve been eyeing it up for ages wanting to create something gorgeous and floral around it to make even more of a statement than it already is. 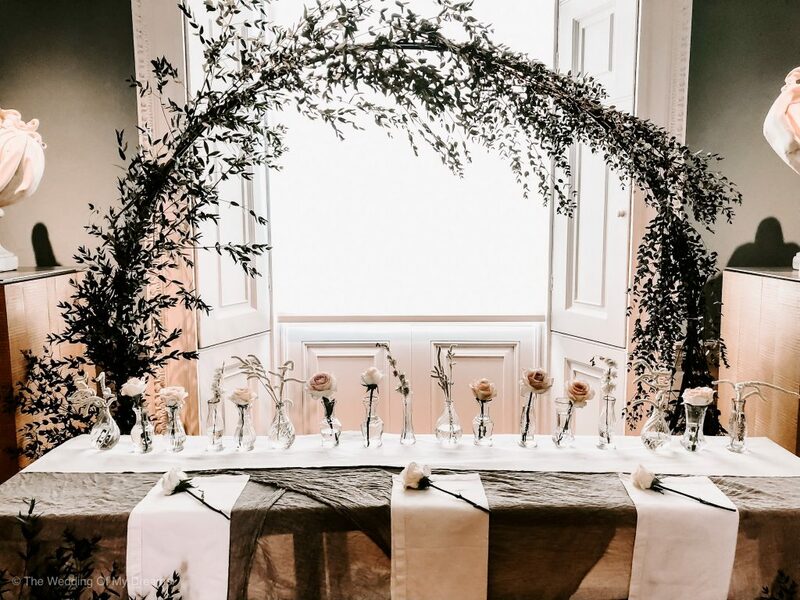 At the most recent wedding fair, I created this asymmetric arch style floral display – which isn’t an arch at all! 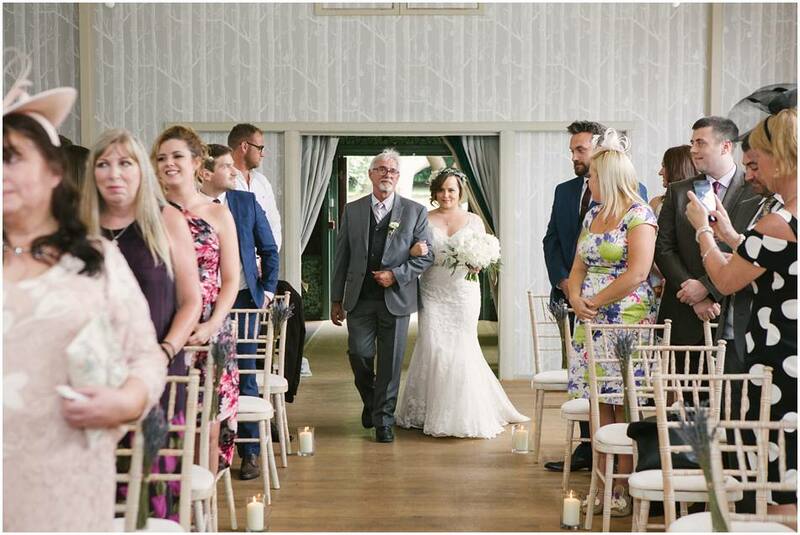 We loved out final creation and guests just loved it. 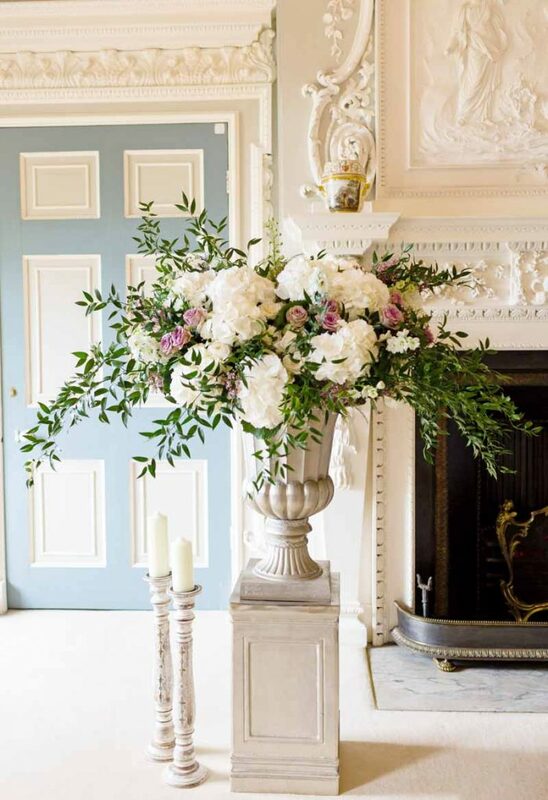 Many Hampton Manor couples use this door as a photo backdrop so florals would certainly enhance this setting. 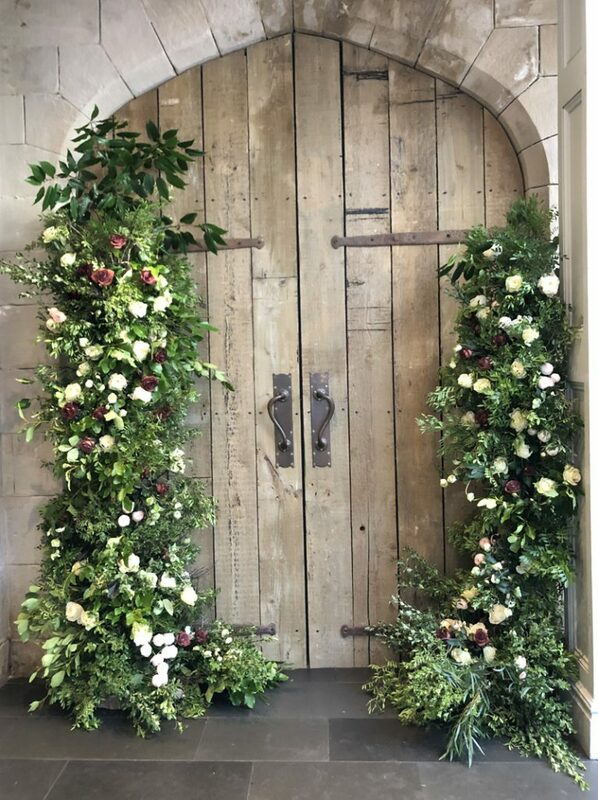 The 2 floral posts could be used anywhere, often we create something similar at an entrance to a church or between large pillars and arches within venues. 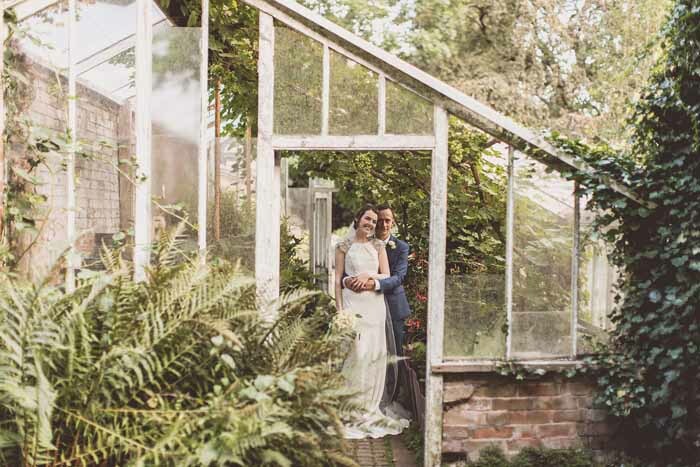 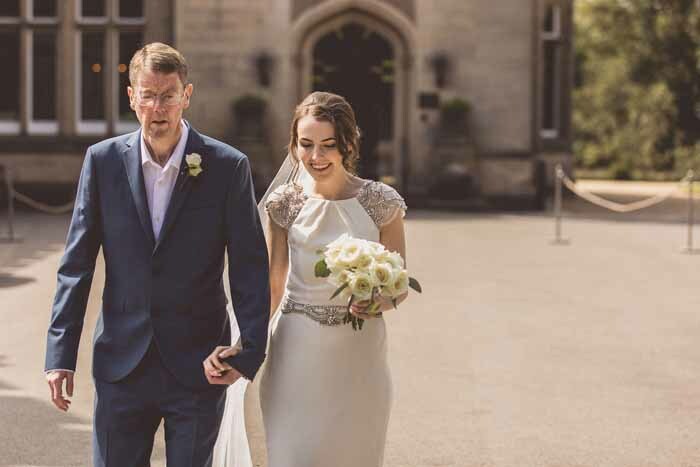 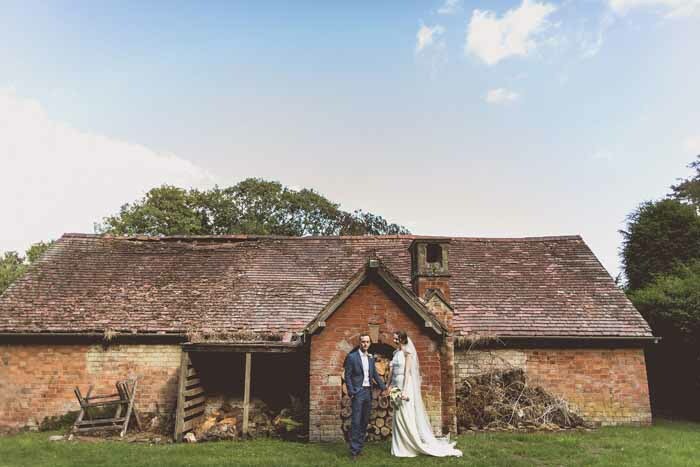 Laura and Simon chose Shustoke Farm Barns for the timeless, elegant wedding earlier this year. 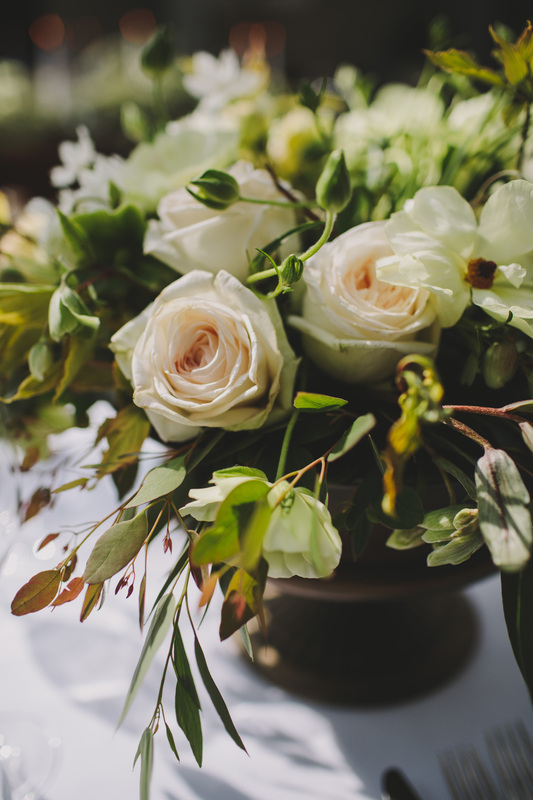 White and green is forever elegant and always stunning for bridal party bouquets. 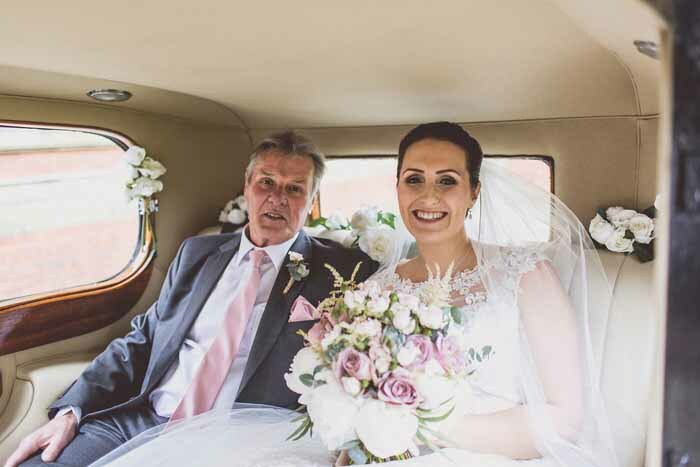 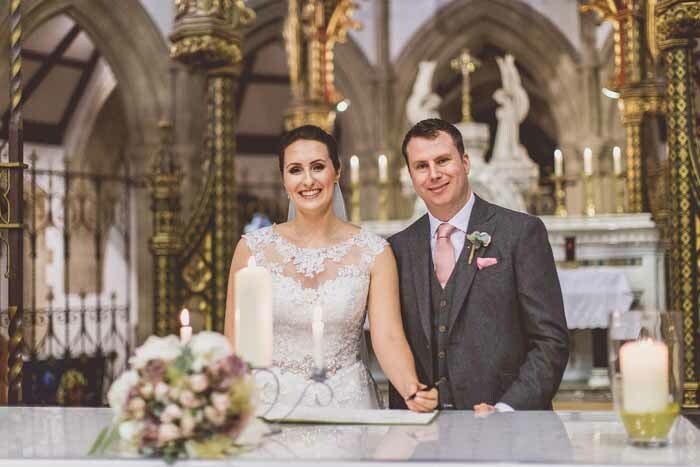 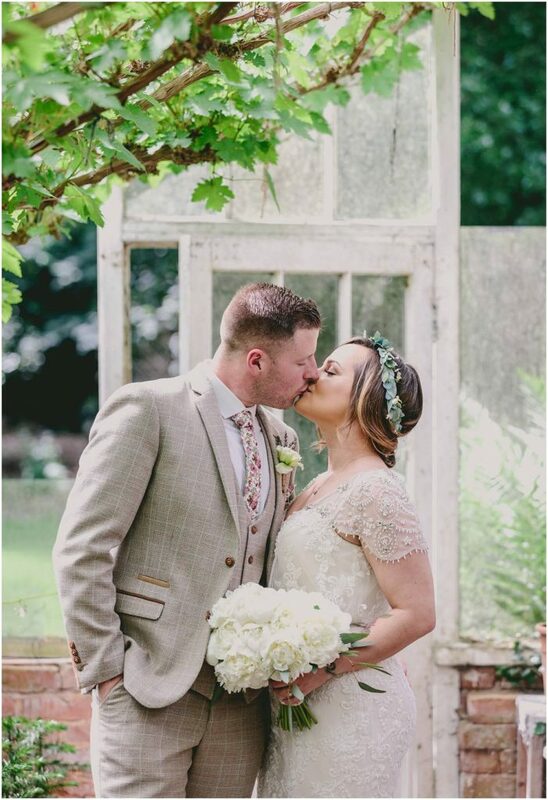 The hand-tied bridal bouquet with a natural mix of roses, foliage and a mix of textured flowers including veronica with the stems bound in ivory ribbon created an elegant look to suit Laura’s dress. 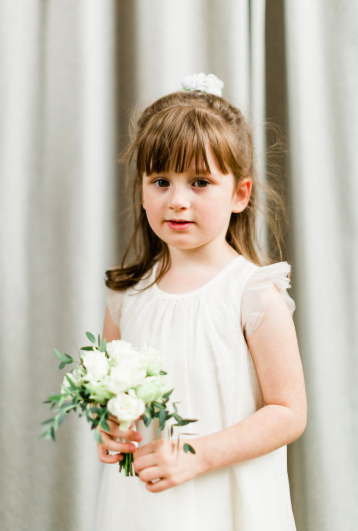 The young flower girl carried a whimsical posy of spray roses and the bridesmaids an elegant mix of green foliage and roses. 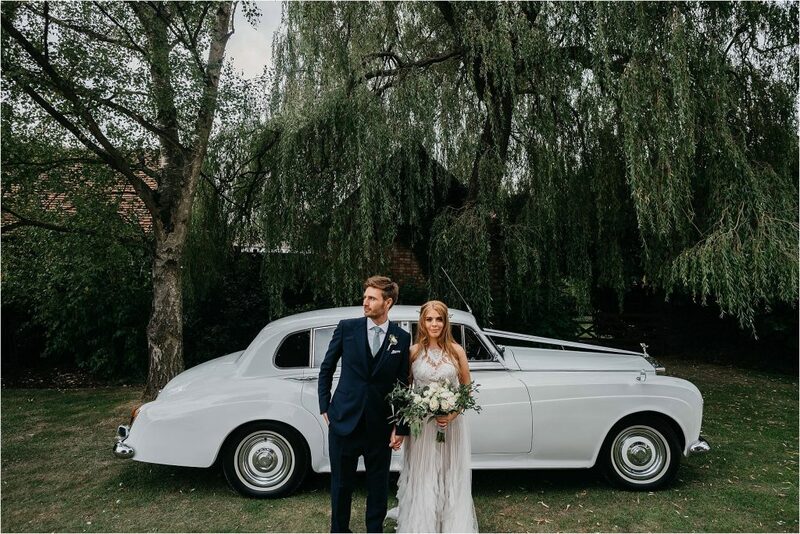 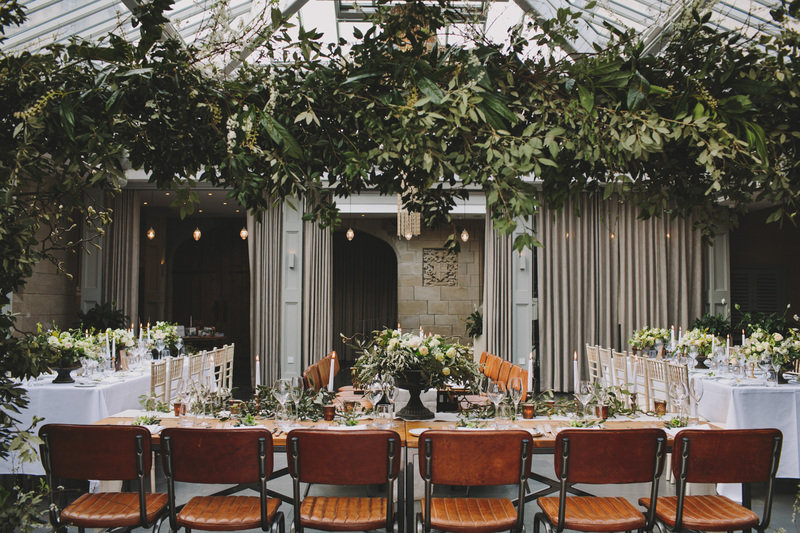 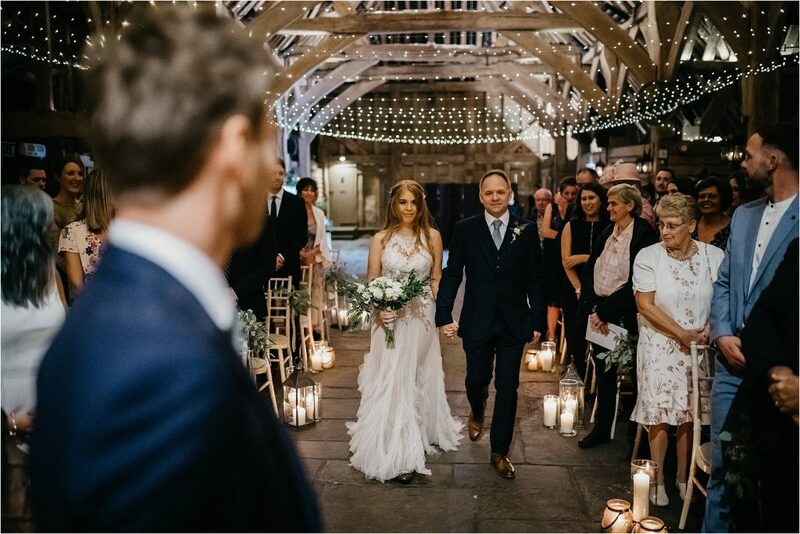 For the wedding ceremony Laura and Simon knew they wanted a natural look with a garland of foliage and flowers from their day, elegant cylinder vases with candles and definitely some over-sized hanging rings to bring the barn to life. 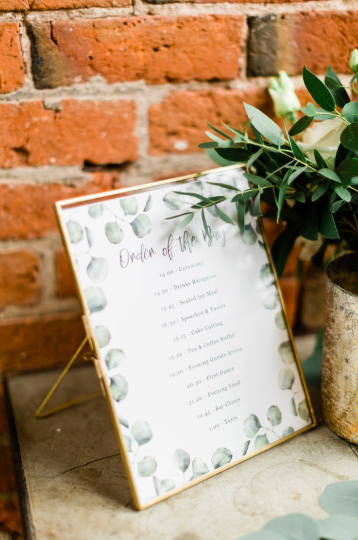 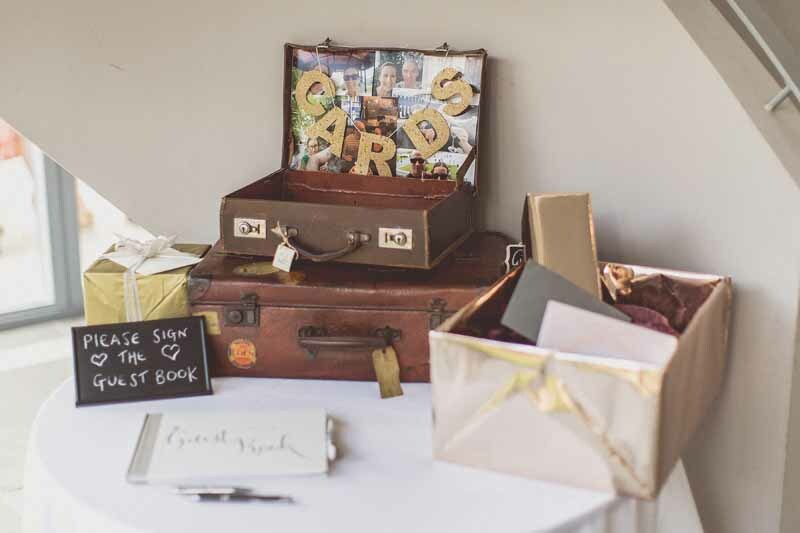 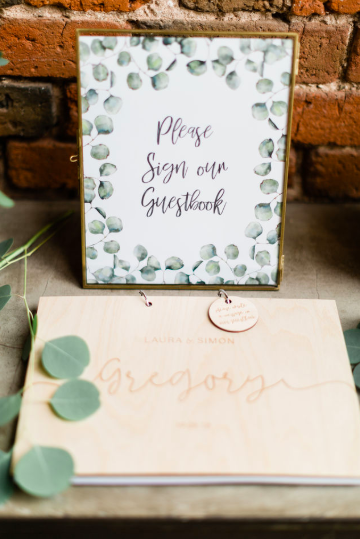 The eucalyptus theme continued into the beautiful signs and stationery Laura had designed. 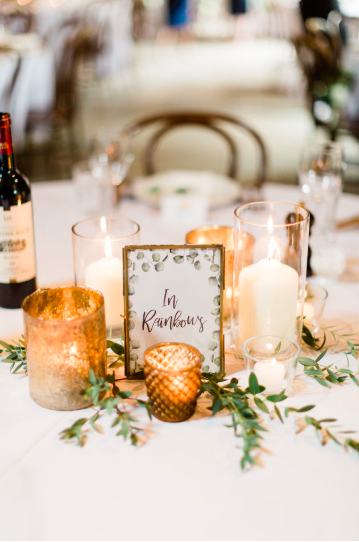 The overall look for the day was an elegant bronze, gold and green scheme with lots of detail and candlelight. 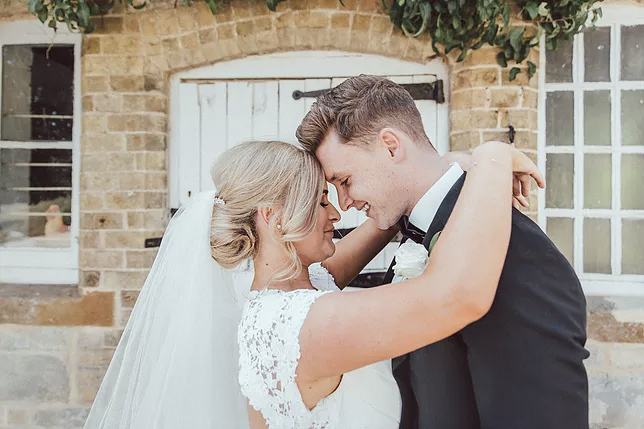 We love working with our couples in the styling of the day and offering them the wedding look they love. 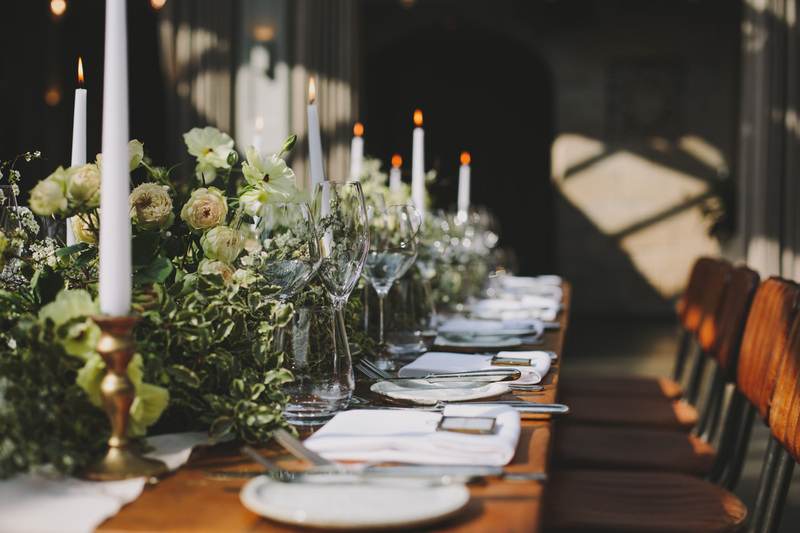 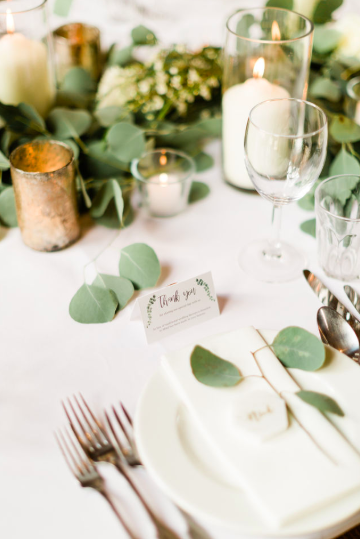 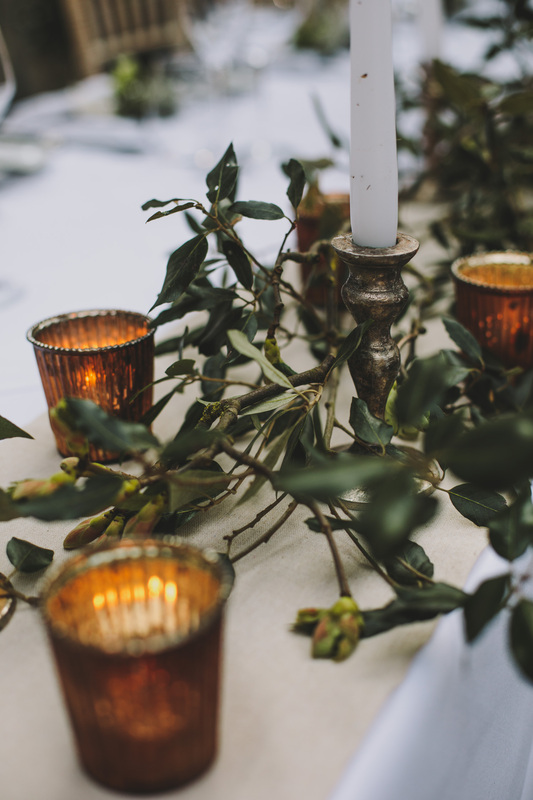 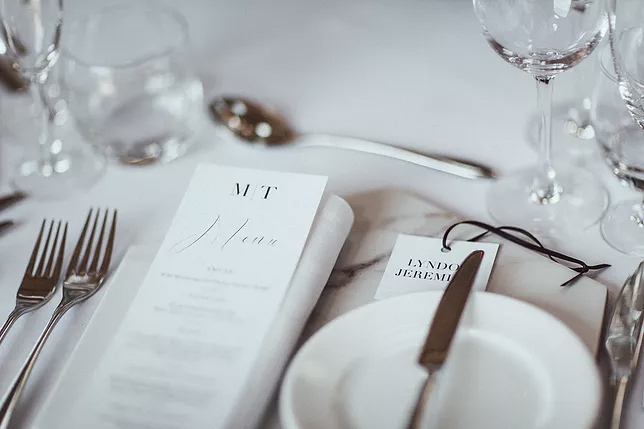 A sprig of scented eucalyptus added to the place setting is an elegant and thoughtful touch for each guest. 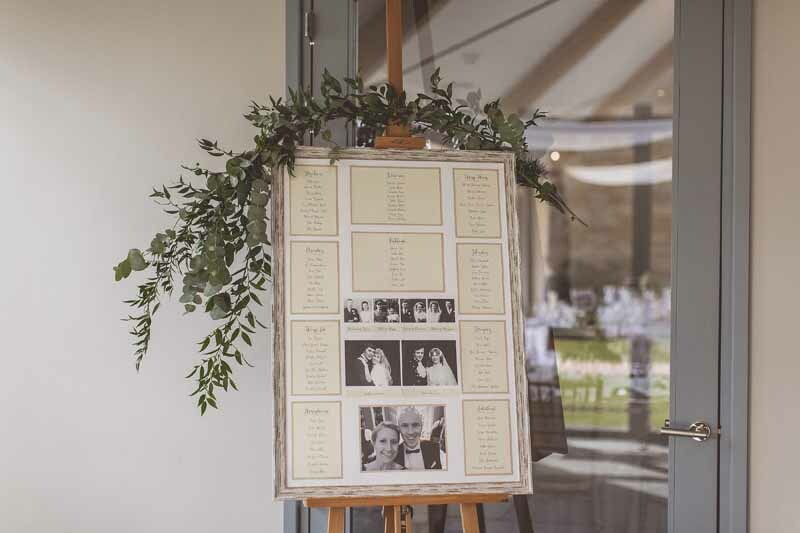 Laura chose brass frames from our collection of props to which we added her table names. 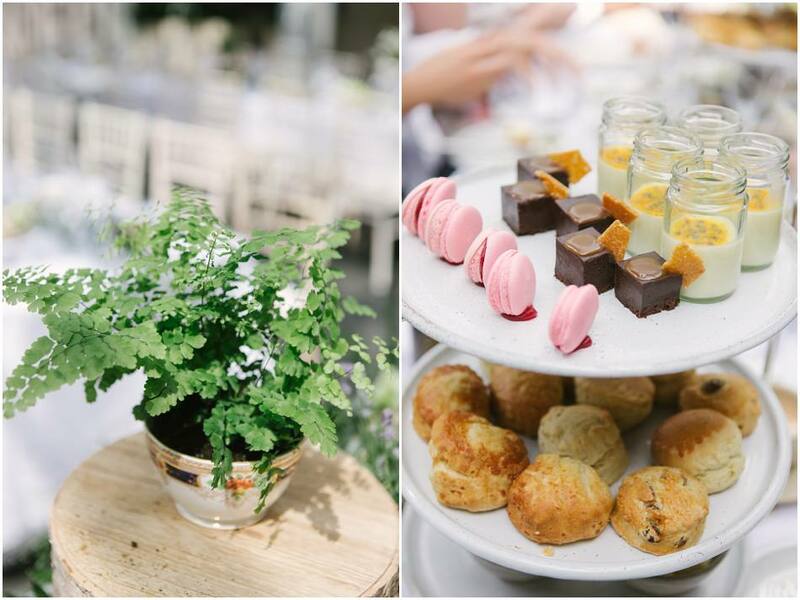 It is all in the detail and this wedding was simple, elegant and with everything styled together. 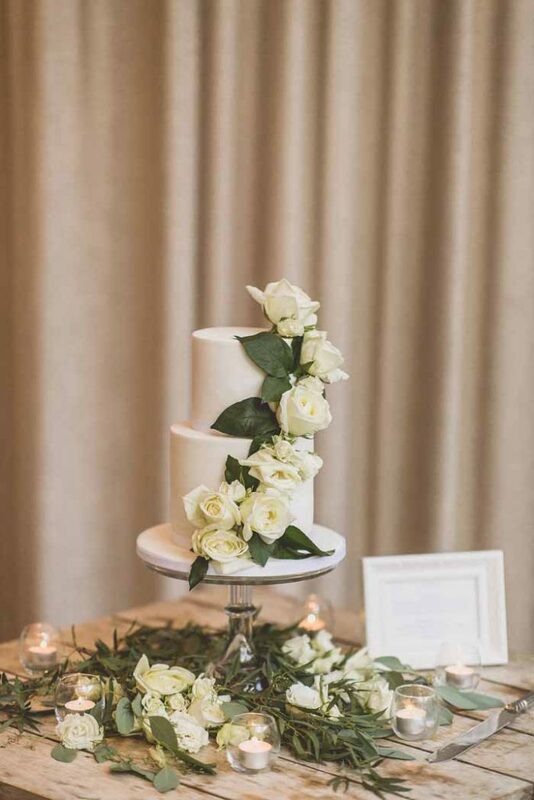 Spray roses and snippets of eucalyptus were added to the cake from Butter Cream and Dreams. 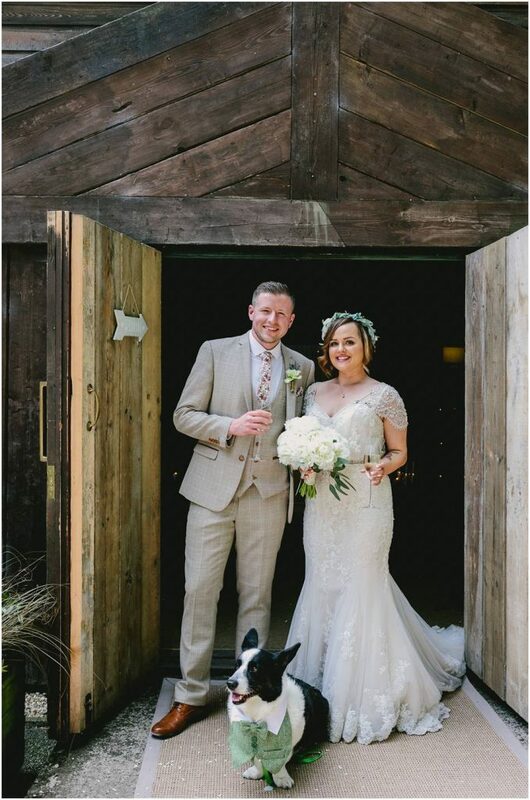 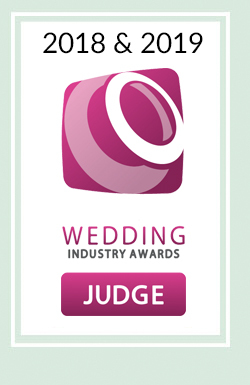 “Just wanted to say a massive thank you for doing the flowers for our wedding. 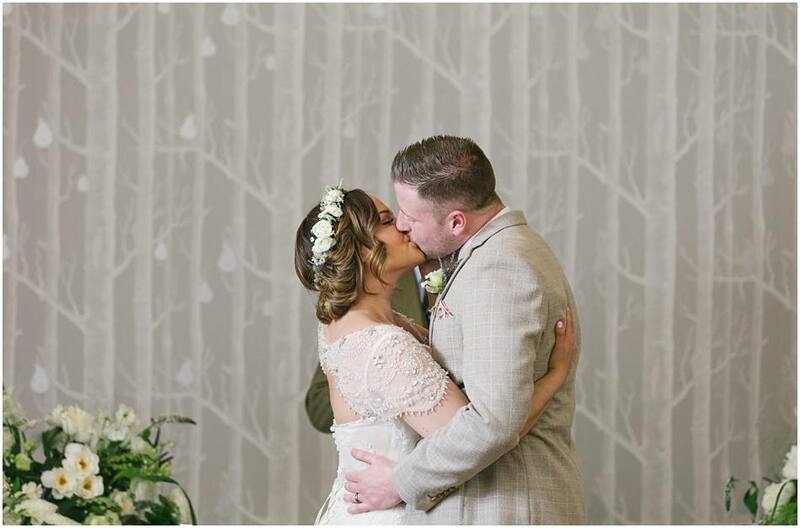 It was PERFECT and you’ve been super helpful from start to finish! 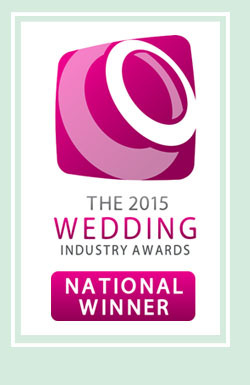 That is why we love what we do to here at Passion for Flowers. 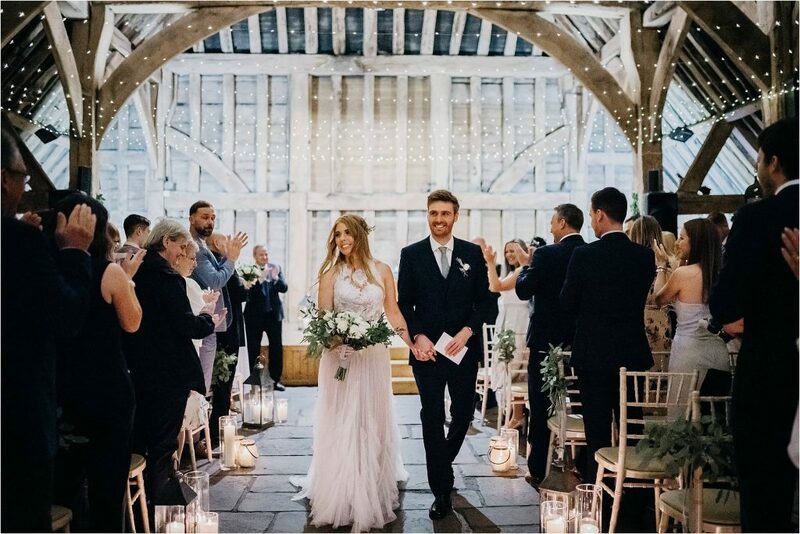 We love travelling around the country to create weddings with stylish couples and jumped at the chance to decorate an epic barn for the wedding of Tiffany and Kris in September. 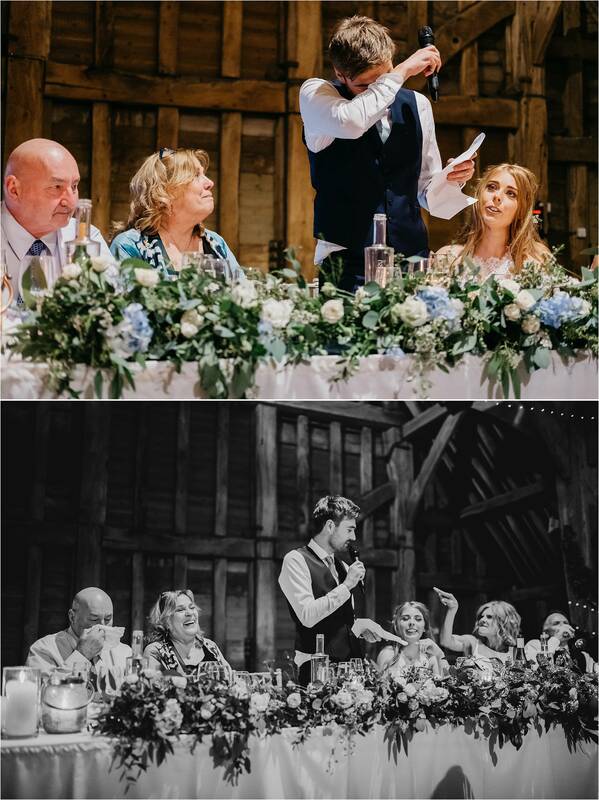 A site visit is essential if we have not worked at a venue before, visiting together with Tiffany and her mum gave us the chance to see how we could bring this barn to life. 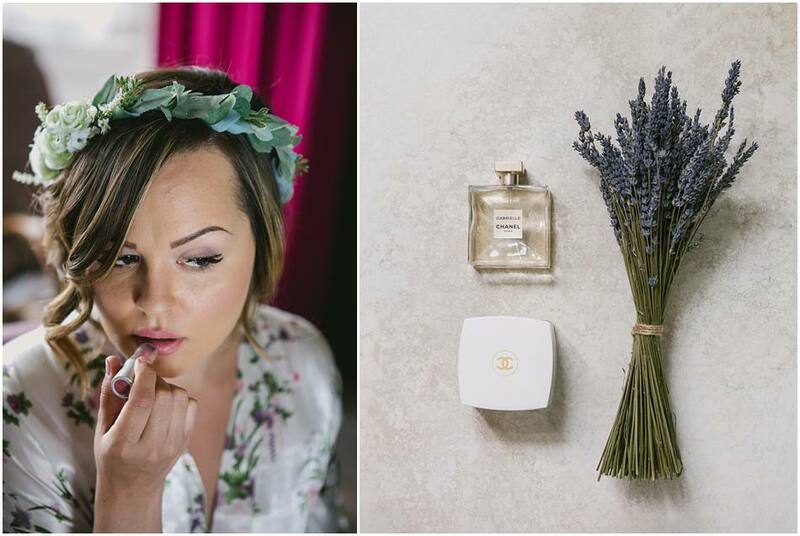 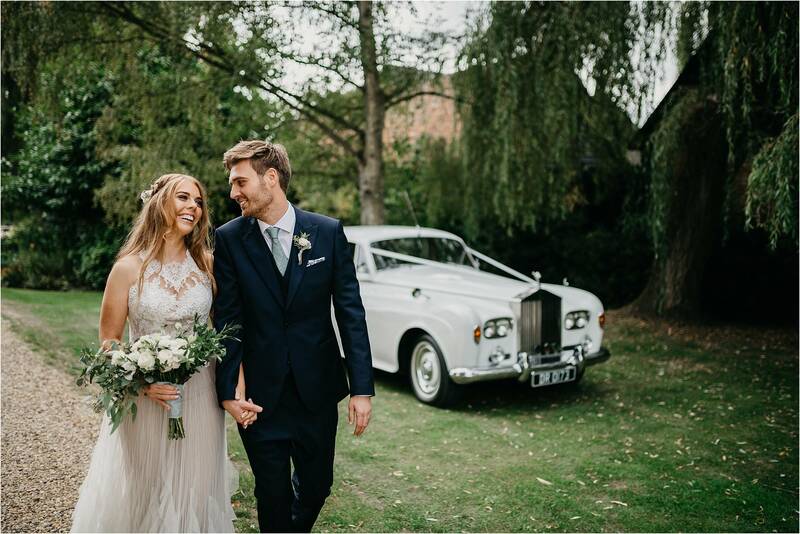 Tiiffany had clear ideas and was looking for a boho style wedding celebration with white, green, gold, blue and grey colours with a Cinderella look. 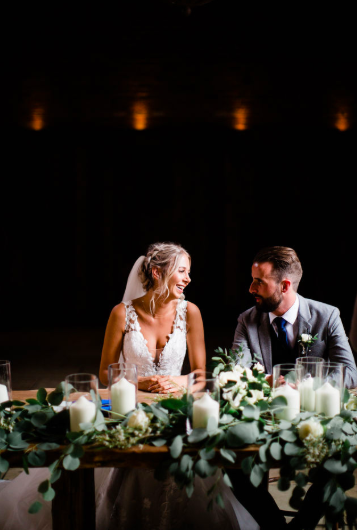 As the barn is quite dark she was thinking of lots of candles, twinkling lights and white flowers to add light wherever possible. 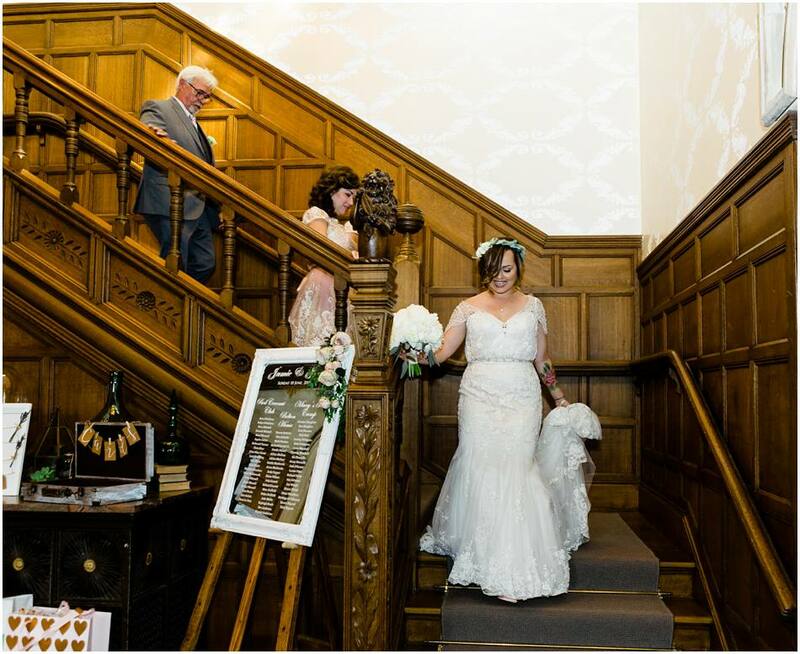 Well take a look a see how this was achieved. 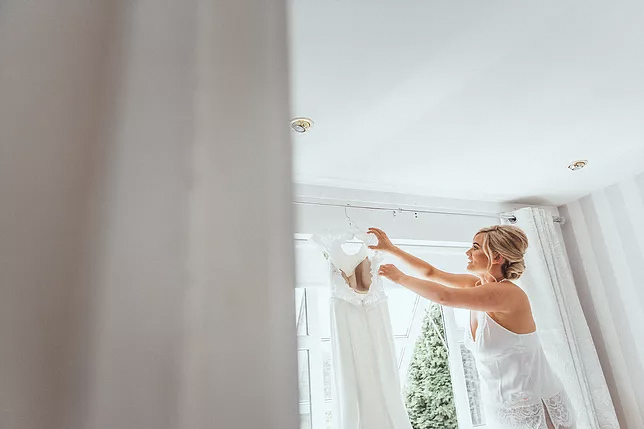 Final morning preparations for button holes and corsages is always a calming task to carry out before the buzz of the wedding day. 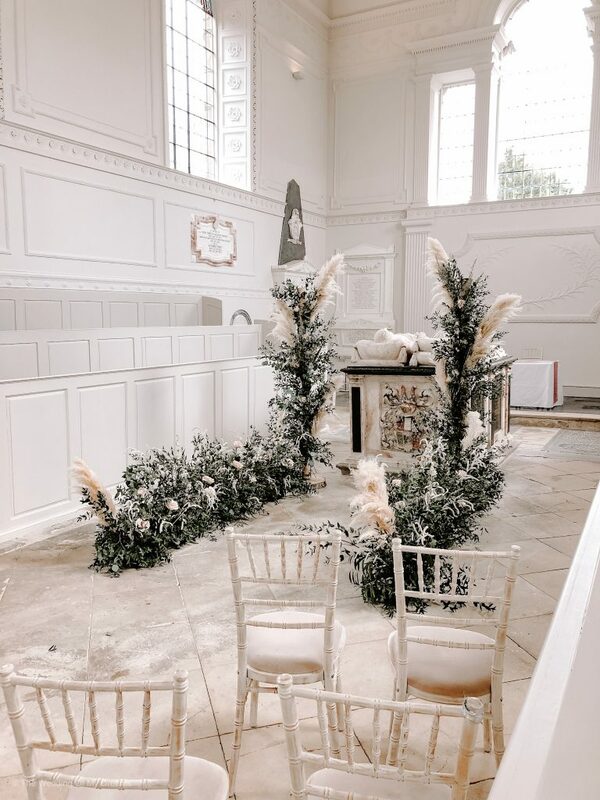 A set up like this needs access the day before for the lighting to go up and the decor to be started. 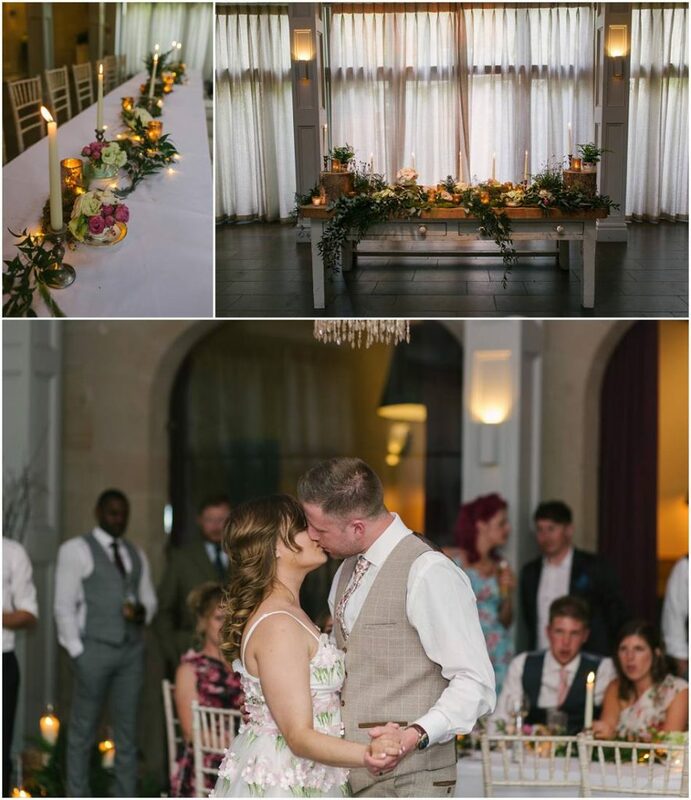 Organic foliage and floral designs decorated the beams and the ceremony tables to form a romantic backdrop to the ceremony. 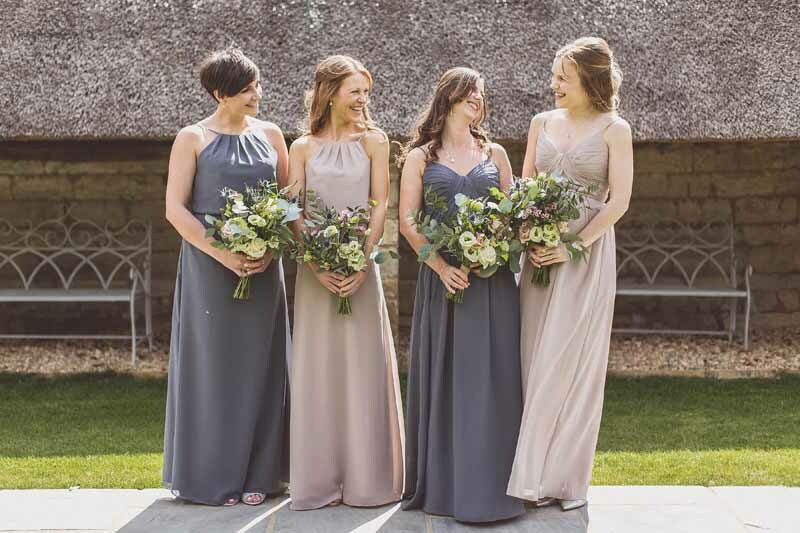 The bridesmaids carried bountiful bouquets of foliage and flowers. 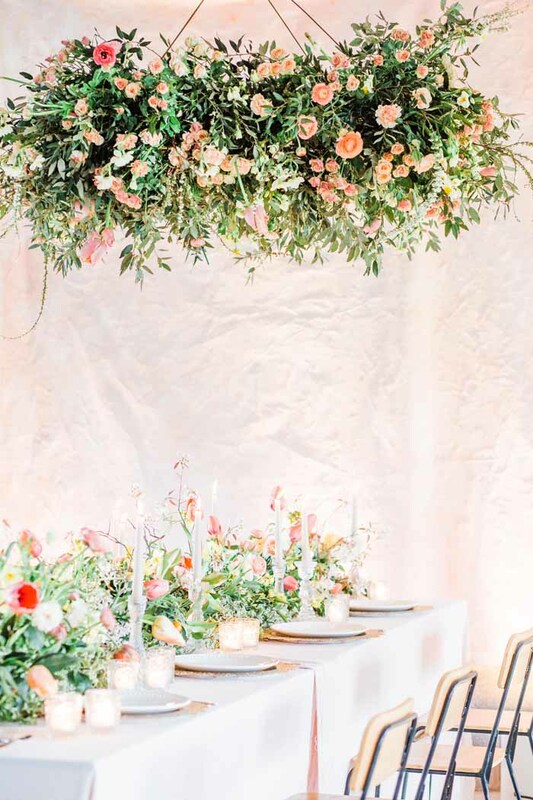 The large stage was dressed with statement decoration including a mix of large lanterns, cylinder vases, rustic wooden tables, and cascading garlands of foliage and flowers. 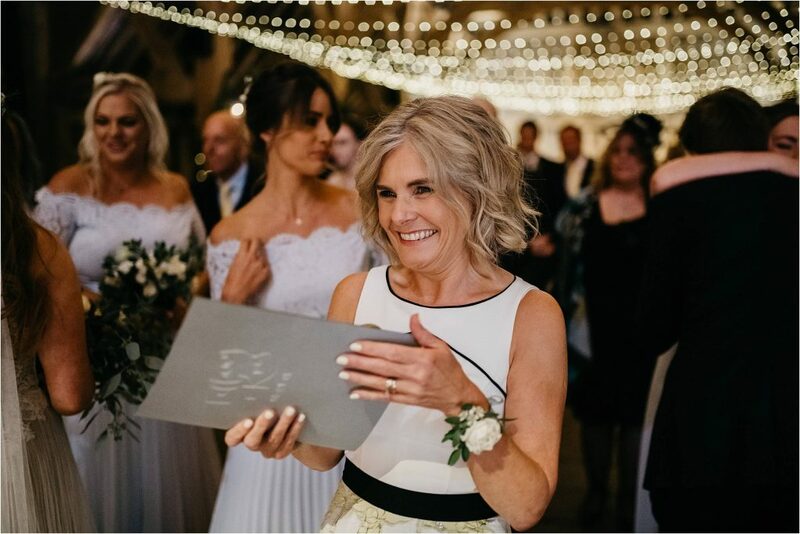 Tiffany’s Mum wore her elegant wrist corsage so well which kept her hands free for her reading. 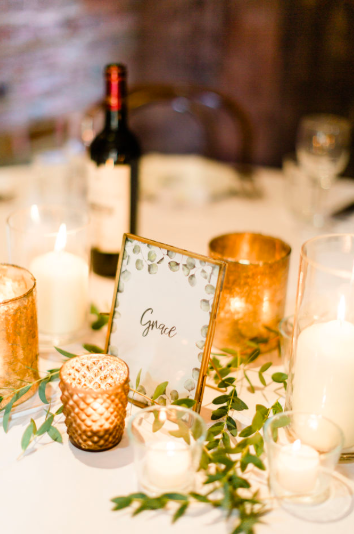 Candlelight was central to this wedding and we designed a mix of centrepeices all with a bronze gold look. 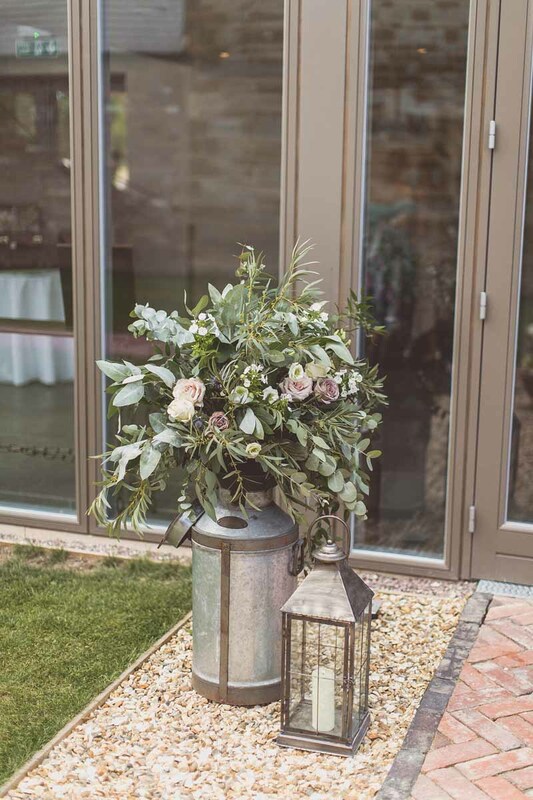 These elegant lanterns were accented with delicate bronze glass bud vases with a mix of flowers and foliage from the day. 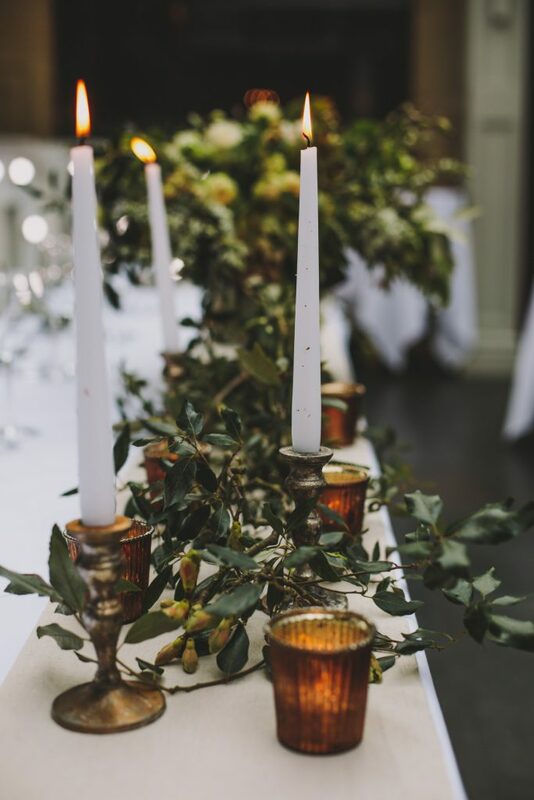 Tall gold candelabra decorated other guest tables with a generous mix of foliage and flowers. 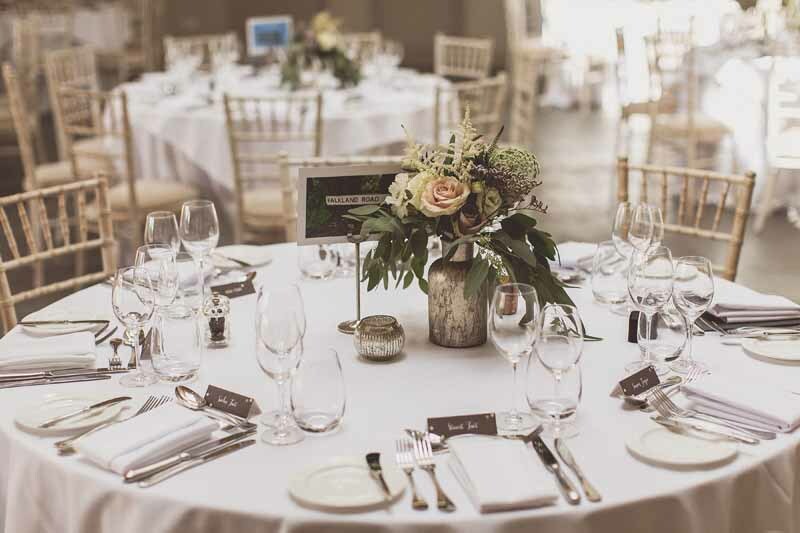 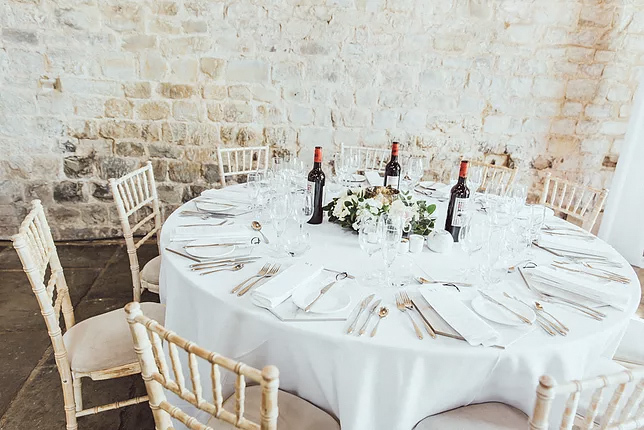 The top table is key to any wedding celebration and is the focus of much of the day. 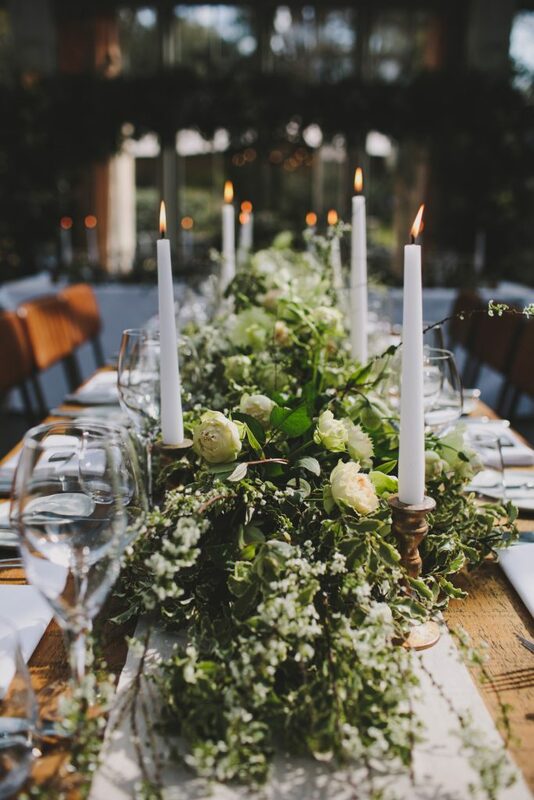 For Tiffany and Kris we created full length top table garlands full of scented eucalyptus foliage, the softest blue hydrangea, spray roses and other blooms and textures from the day. A mix of glass cylinders and bronze gold lanterns were added to light the table and foliage chair backs to complete the look. 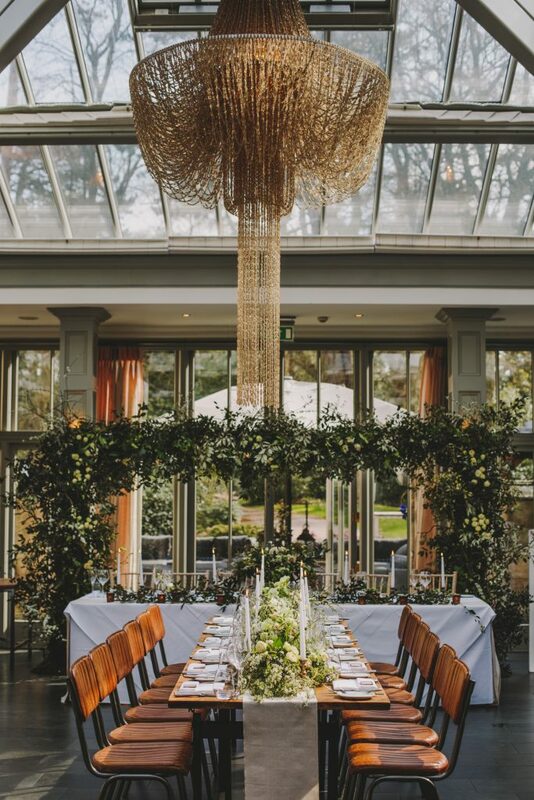 So every wedding cake deserves to be centrestage and so we created a hanging ring to be suspended over the wedding cake surrounded by a masse of candles. 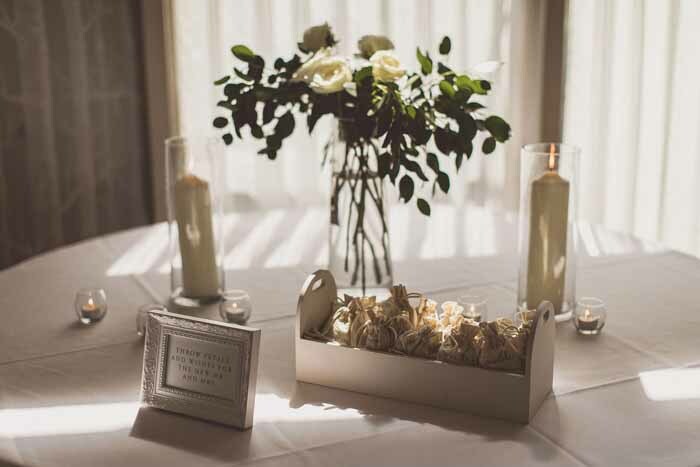 This was the most romantic setting for Tiffany and Kris to cut their cake in front of family and friends. 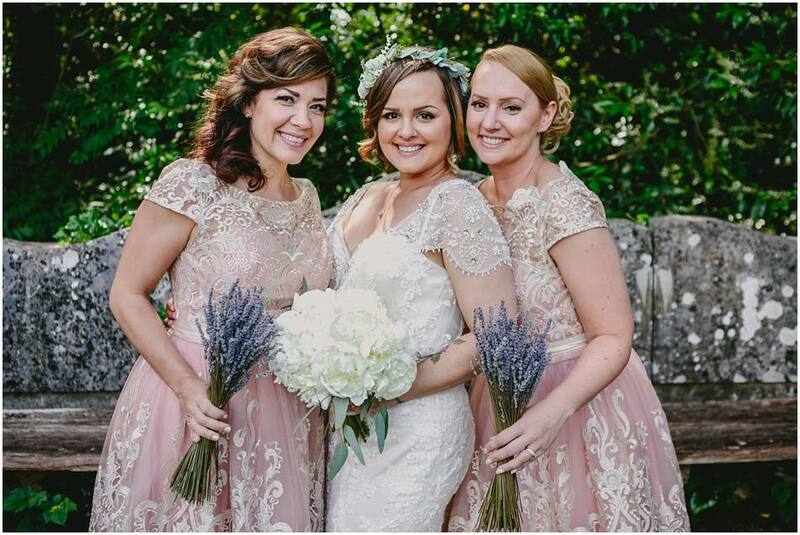 Thank you so much Tiffany and Kris for allowing us to be part of your amazing wedding day. 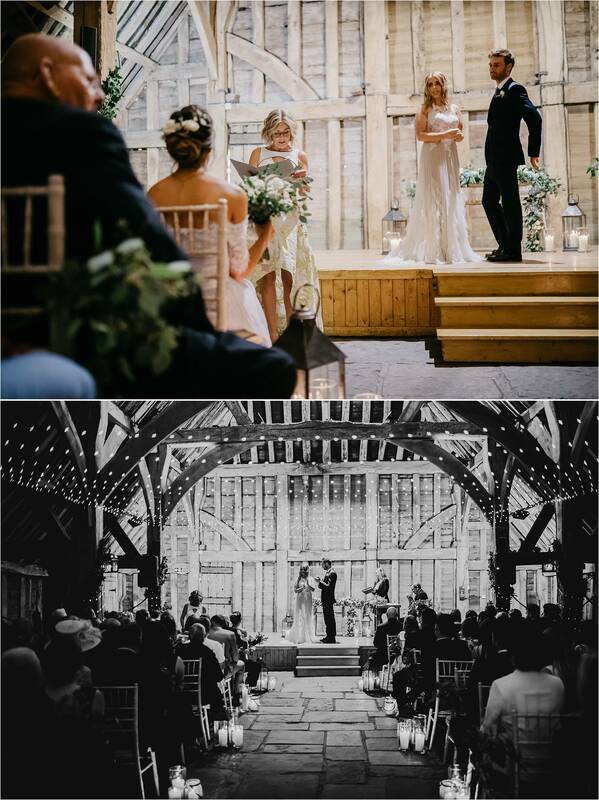 The photos captured by Ed Godden are simply stunning. 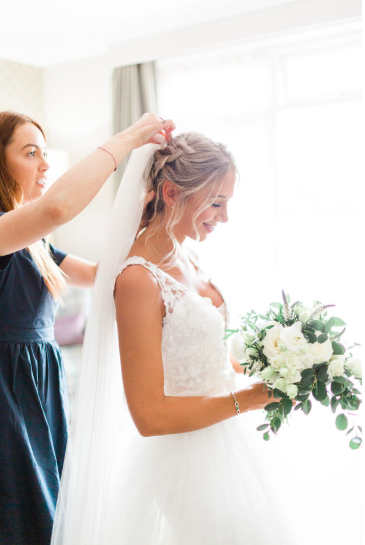 Jessi carried a romantic white peony bouquet and for her maids a bunch of scented lavender keep the look natural and so so English. 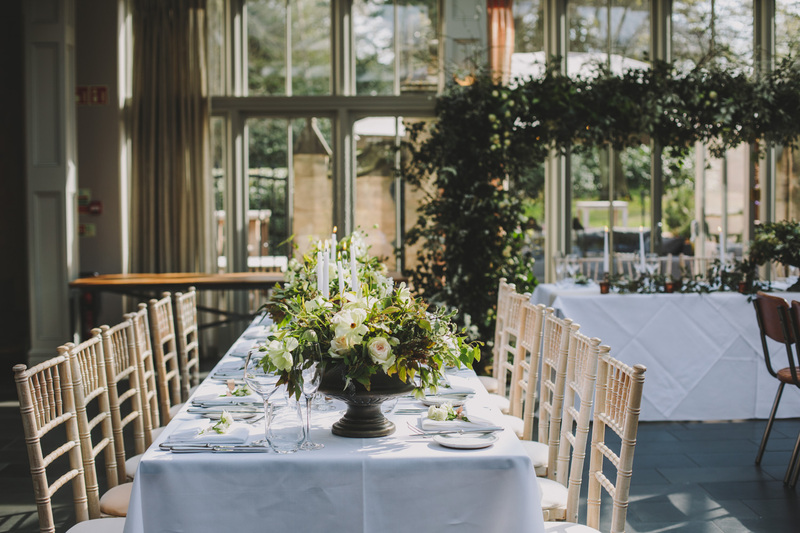 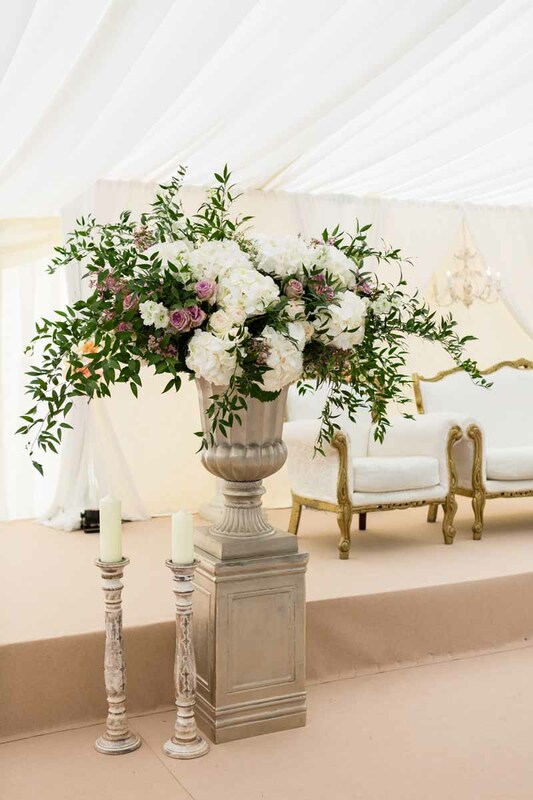 Well we loved creating this look for this romantic look with cylinder vases down the aisle, bronze stands with natural arrangements including English Margaret Merrill roses, ferns, trailing foliage and clematis with simple bunches of English lavender to the chairs. 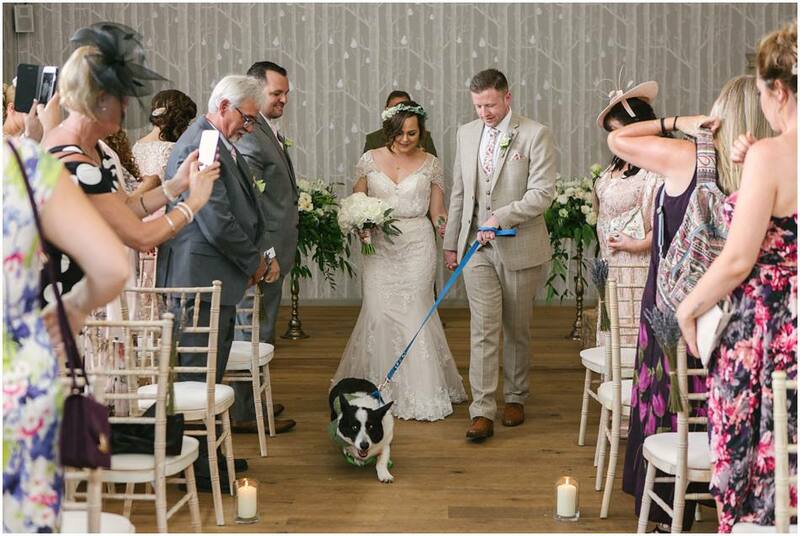 Most of all we loved their beloved dog Oreo who stole the show in his bespoke waistcoat. 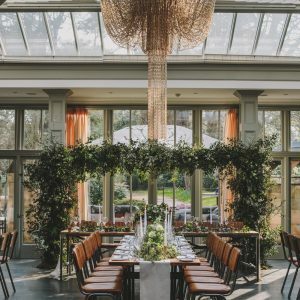 So when your couple love books and especially the Secret Garden that gives plenty of scope for the most beautiful set up in Hampton Manor. 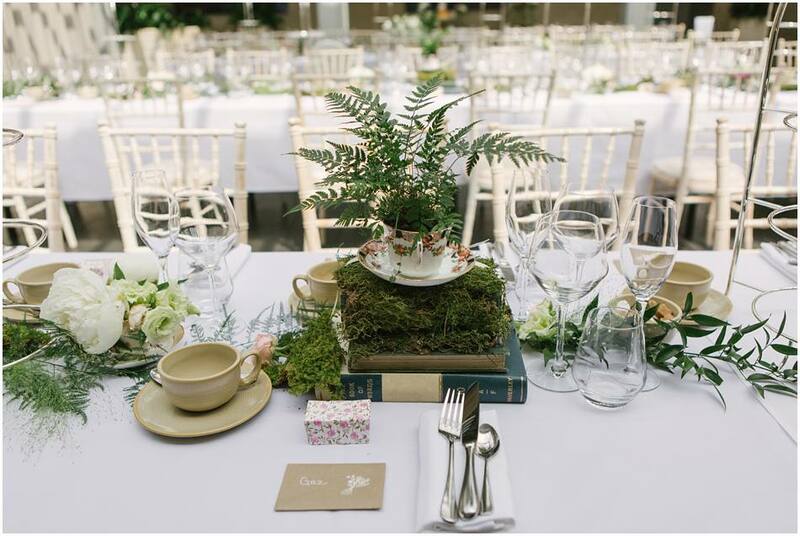 Moss runners and books, delicate ferns in china tea cups and the most beautiful blooms created a gorgeous look and feel to the room. 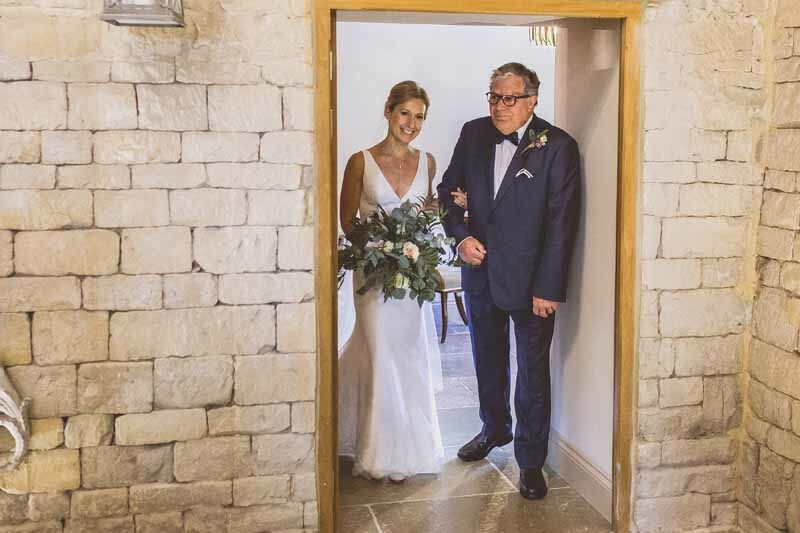 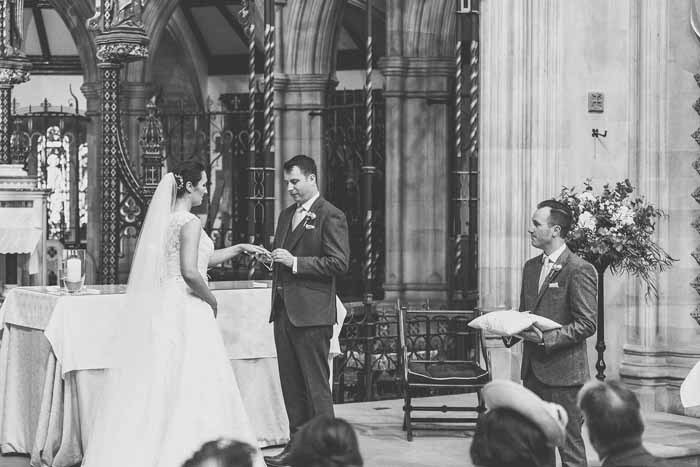 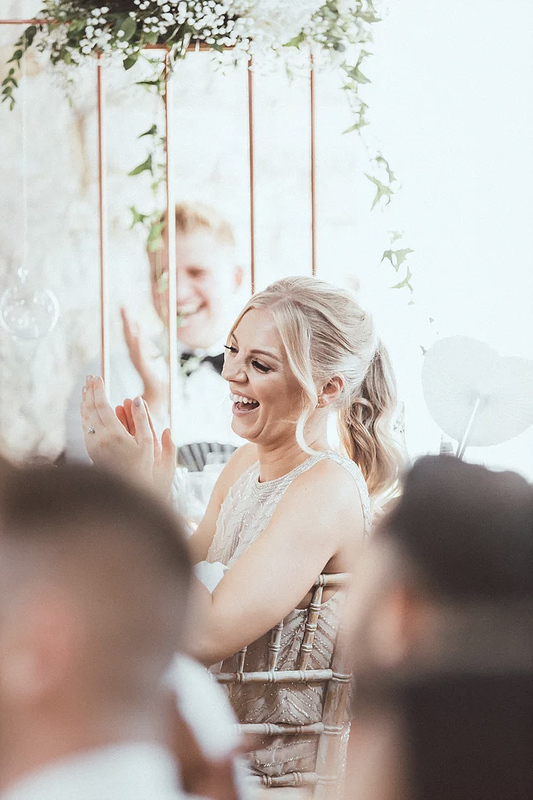 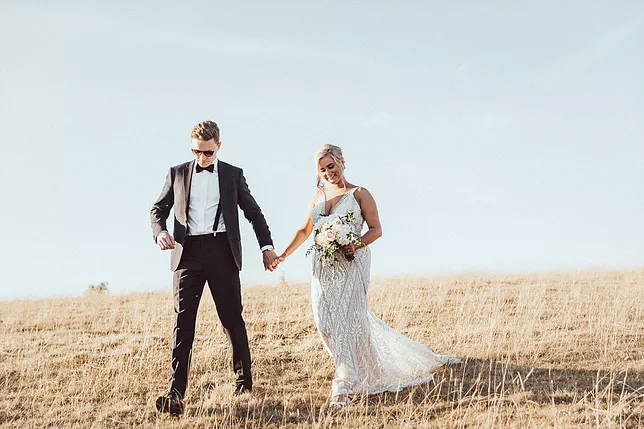 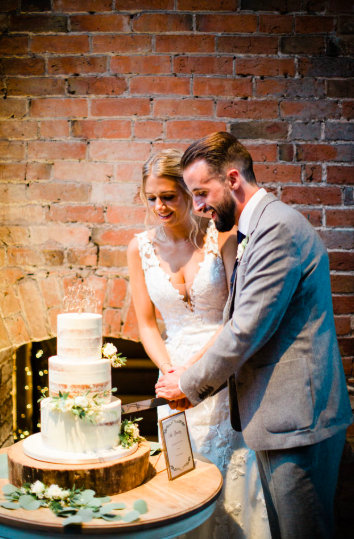 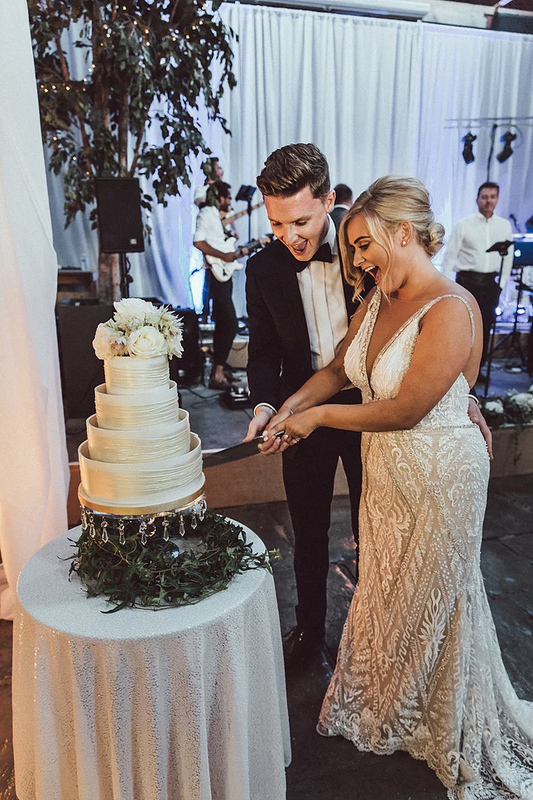 Jamie is one romantic groom and there was not a dry eye in the room when he surprised his bride with an interruption to the speeches when an amateur dramatic group began renditions from Les Miserables, her favourite musical. 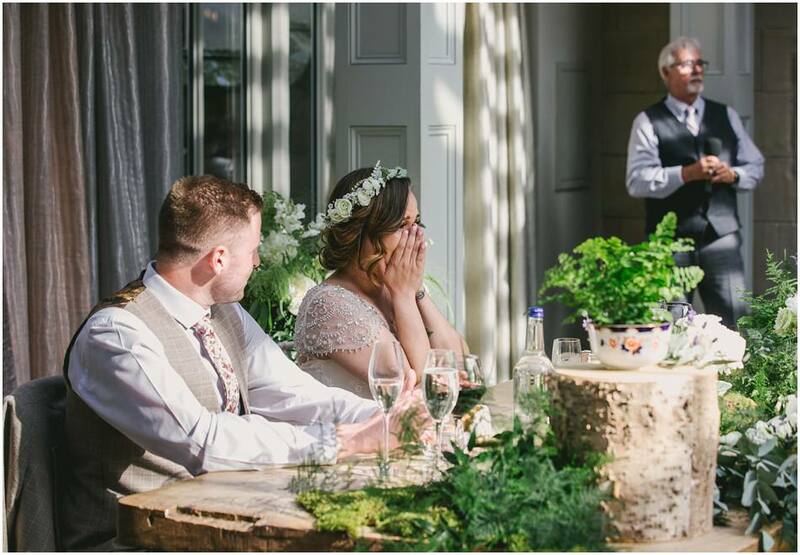 This was performed in front of her eyes and was one incredible surprise. 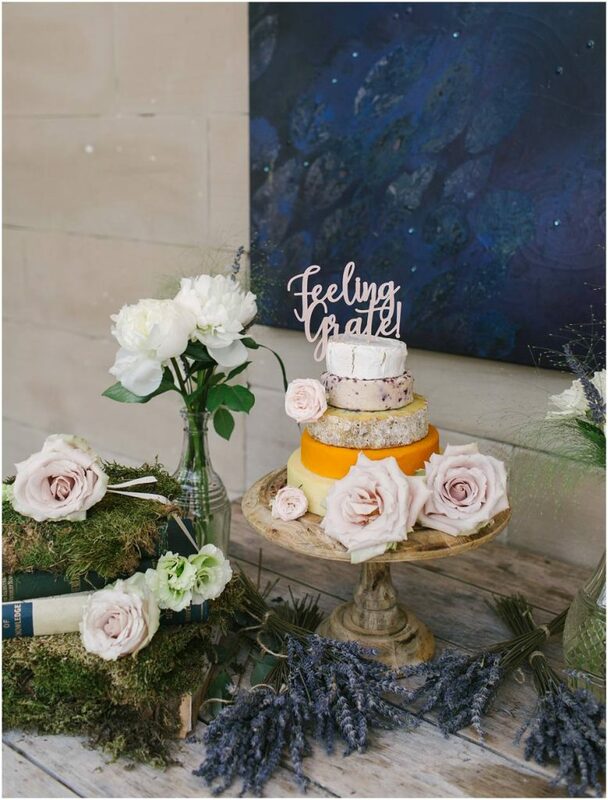 The cake table was decorated with English lavender bunches, a mix of moss covered books and blooms from the day. 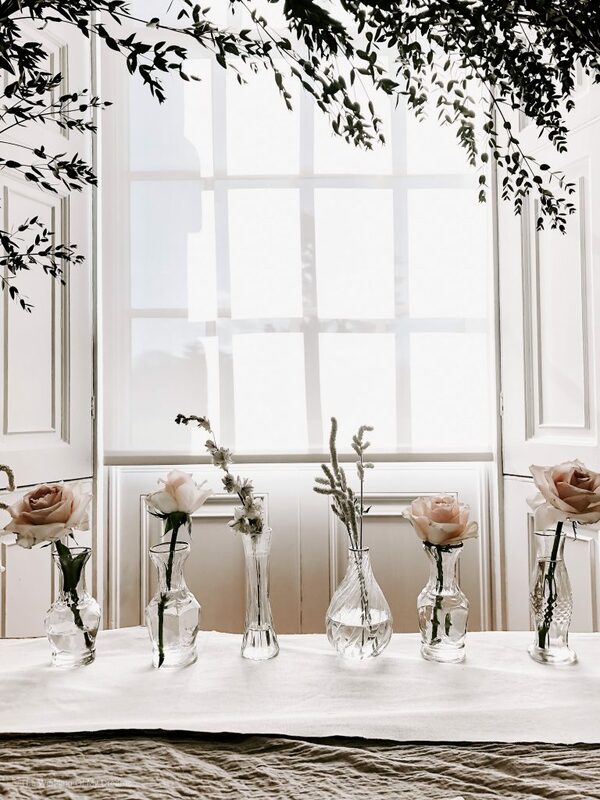 Crystal decanters with scented peonies and grasses kept the look soft and romantic. 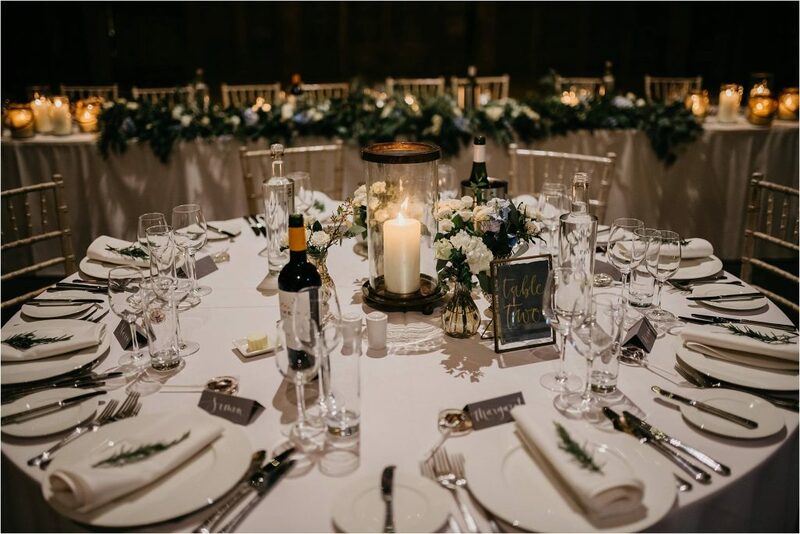 As the guests headed back to the room for the evening celebrations they were greeted by a change of scene with candlelit tables. 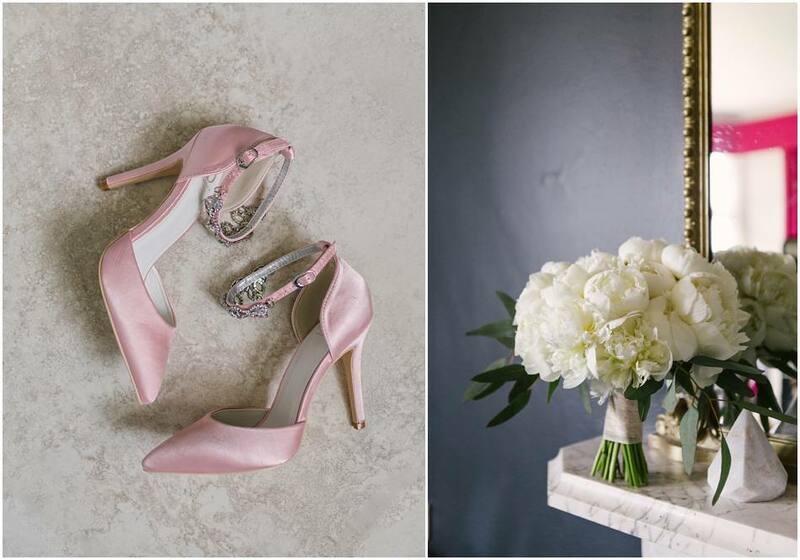 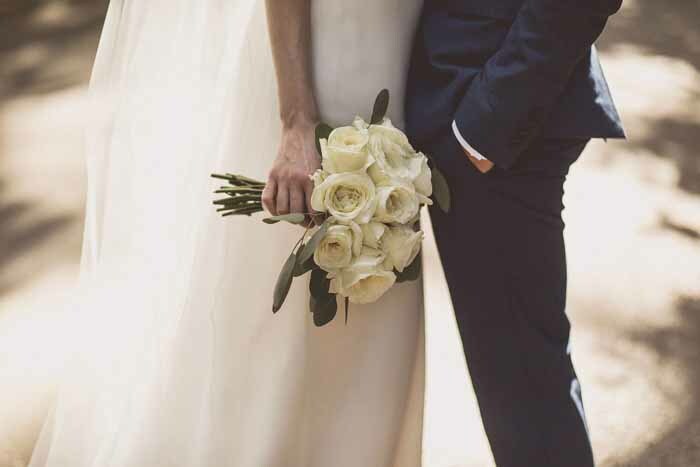 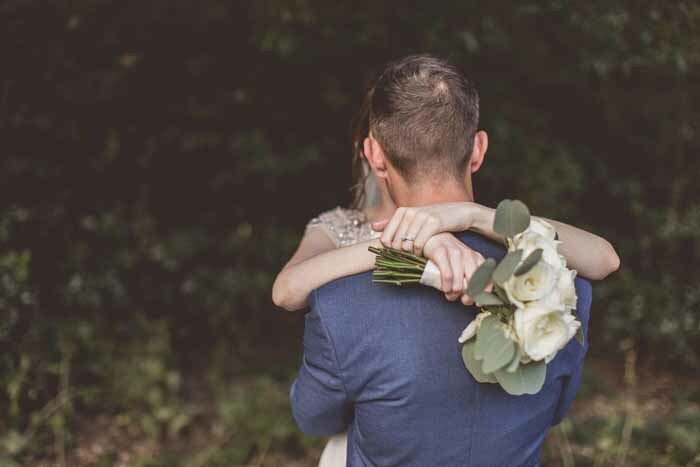 We are eternally thankful for the lovely couples who chose us for their wedding flowers and styling and to the venues we dress and of course the photographers who capture their days so beautifully. 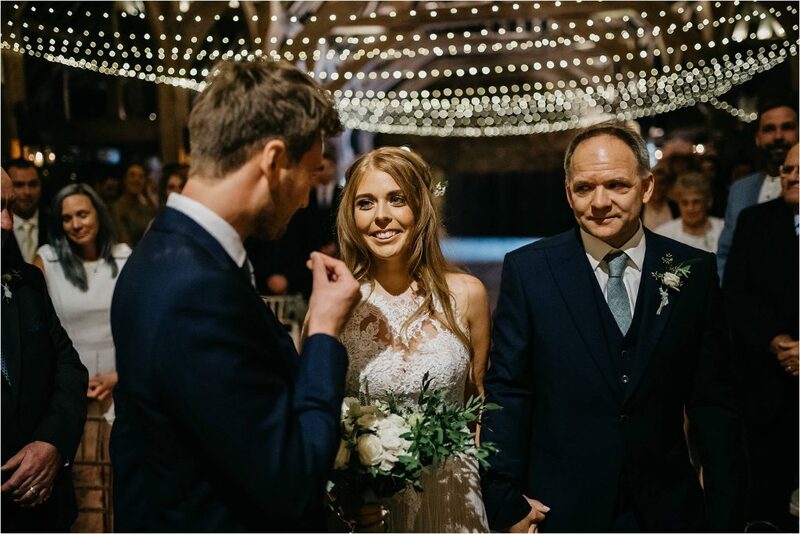 Thank you Jamie and Jessi and all our good wishes for the next stage of this romantic story. 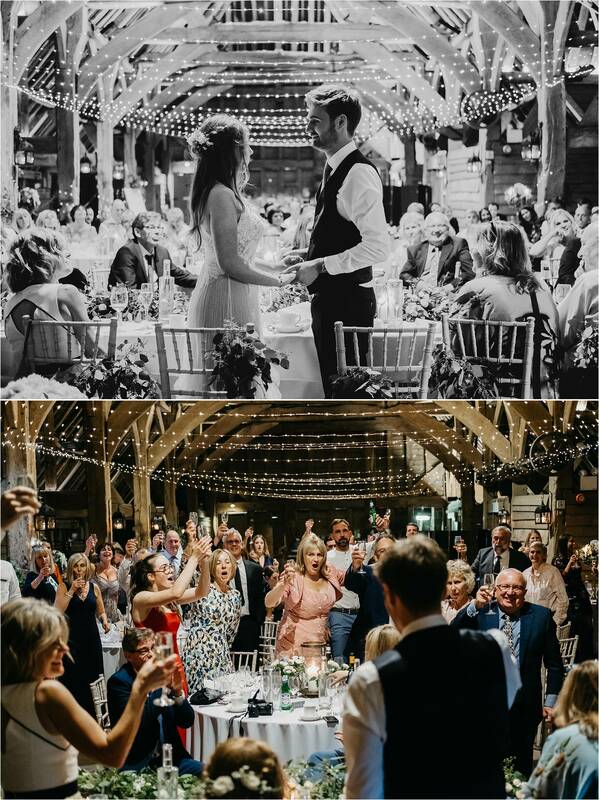 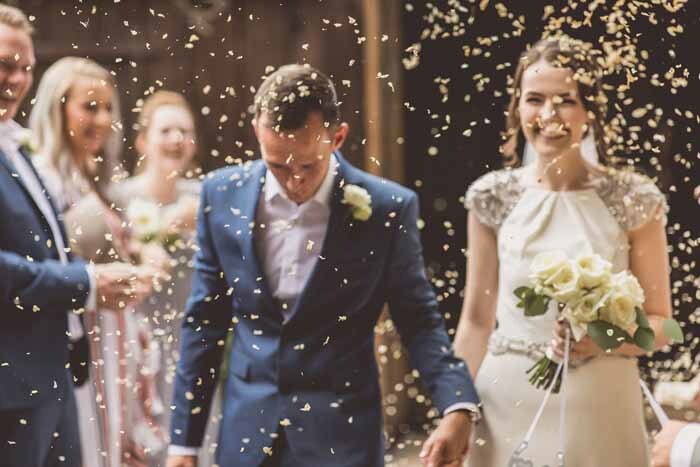 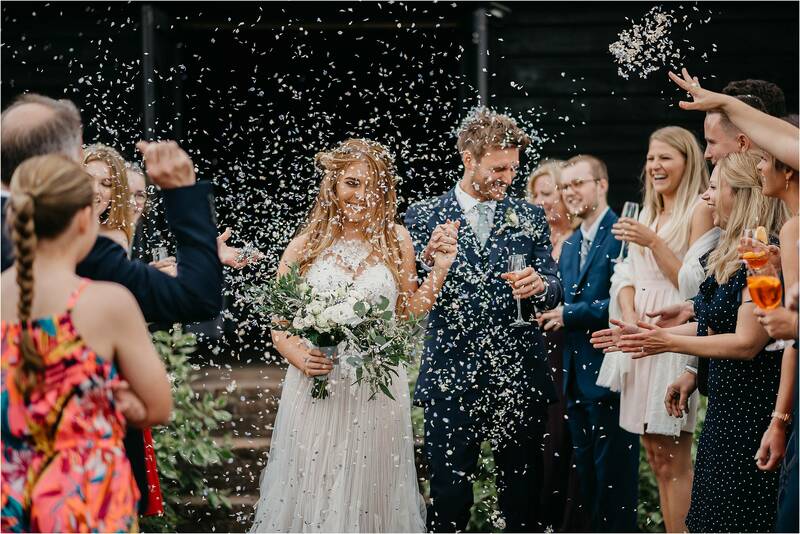 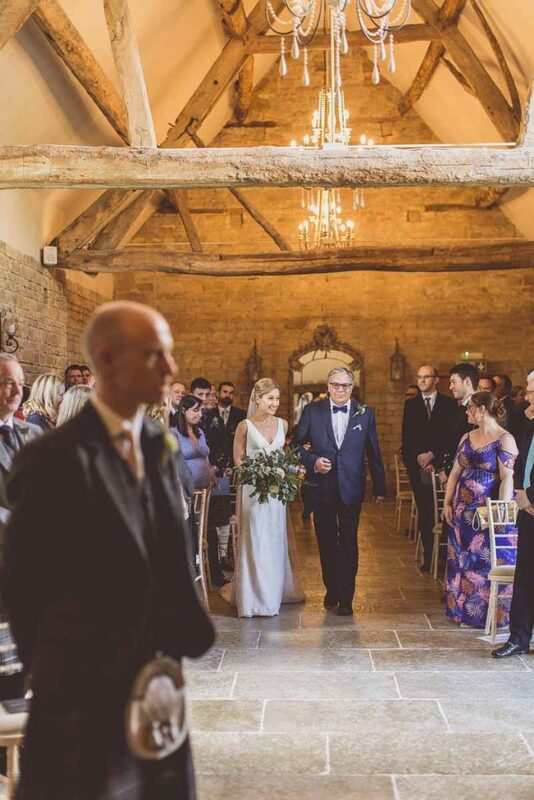 So we always love an epic wedding and thought you would love to see more of this amazing wedding at Longbourn Barn Kineton, one of our favourite’s of the year. 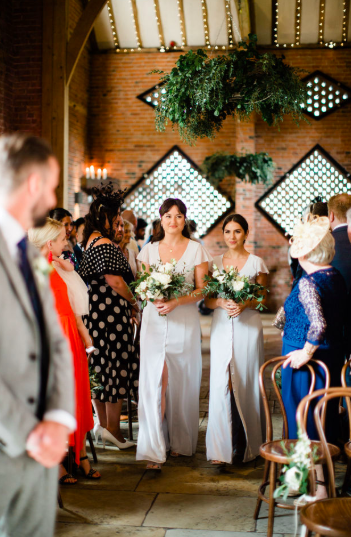 We were thankful when Meg and her Mum came to meet us to ask us to create the florals for this gorgeous flower filled wedding. 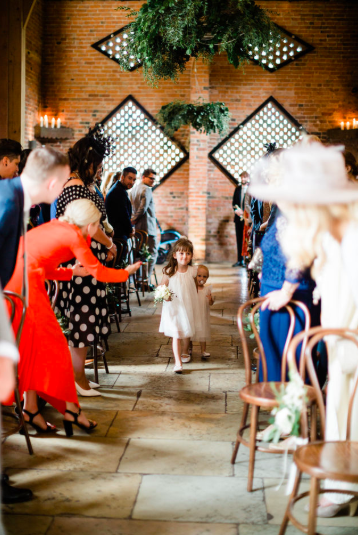 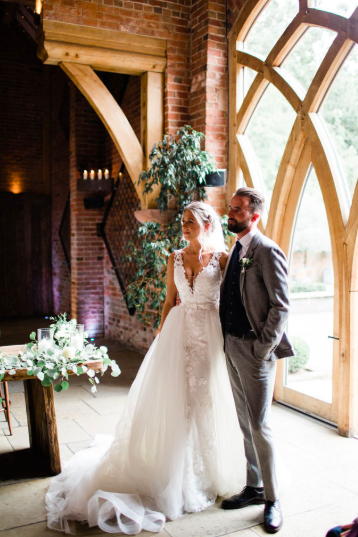 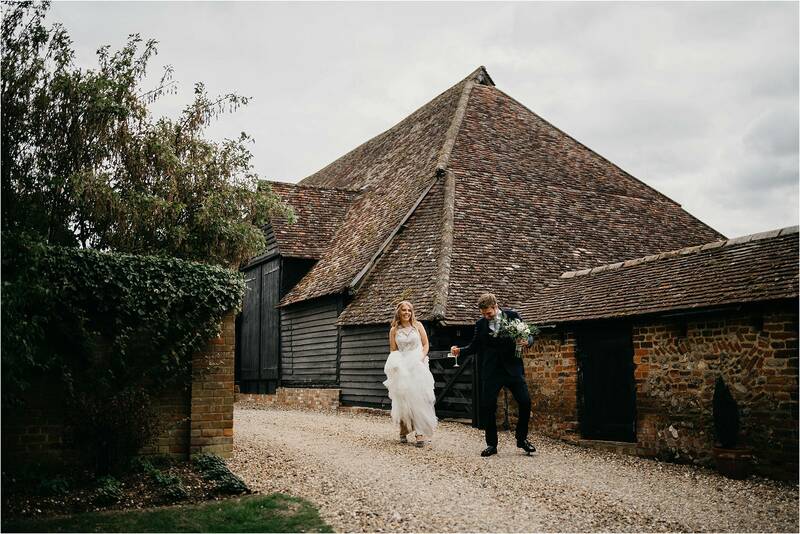 We visited Longbourn Barn together and fell in love with the setting. 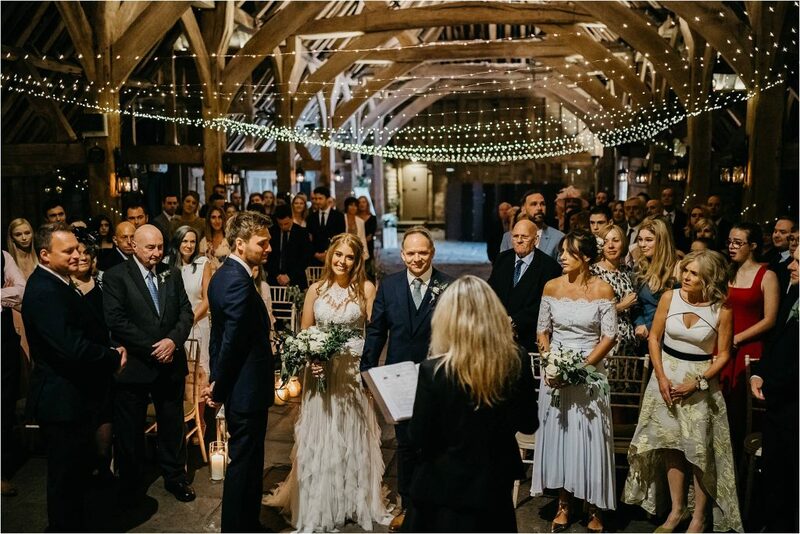 It offers a space where couples can stamp their mark on it for their wedding day set in the most amazing Warwickshire countryside. 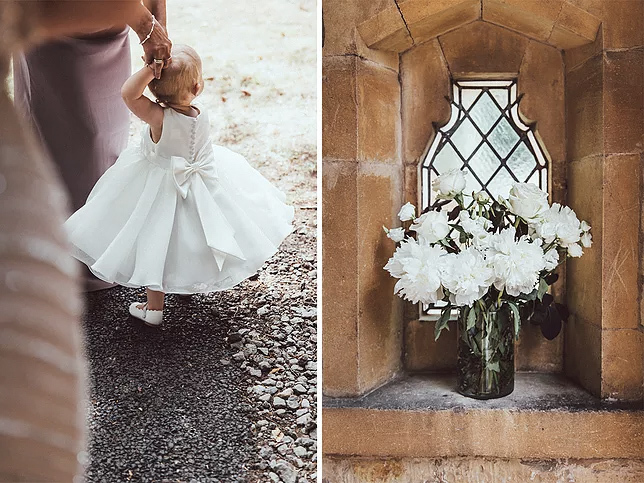 Meg and Tom started their wedding day with a church ceremony with their beautiful daughter taking centre stage. 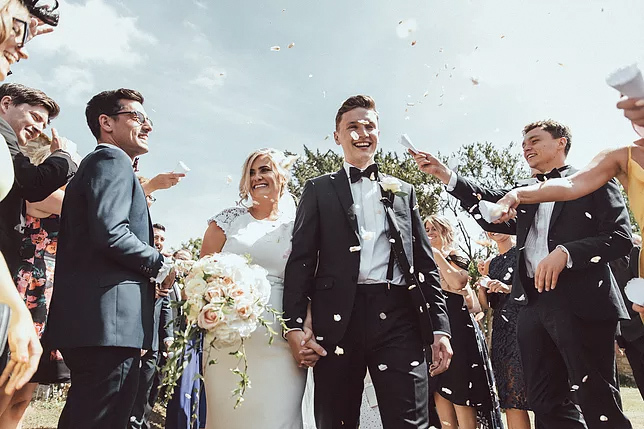 The couple remained radiant and happy throughout their day and all the joy in their lives came together for all to see. 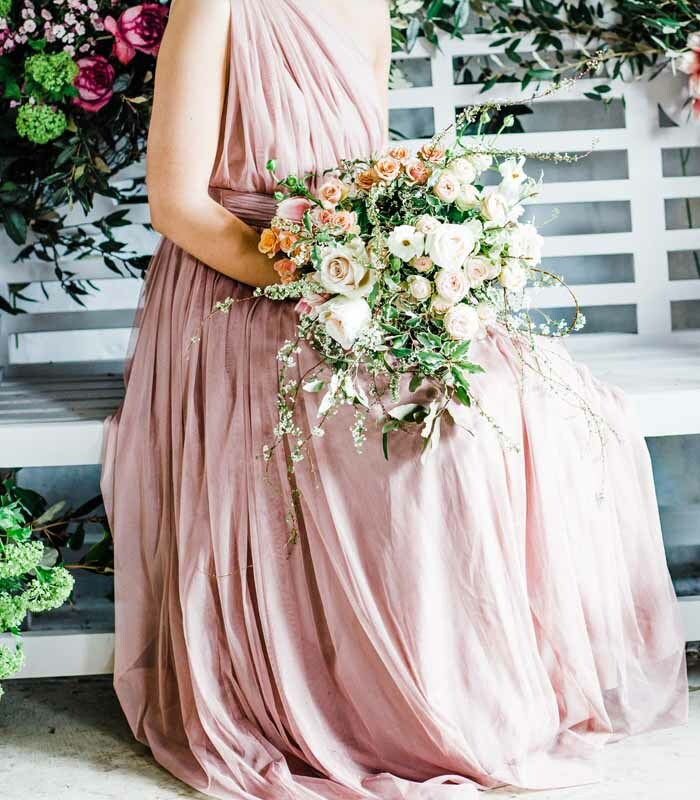 We created a bountiful and full bouquet for Meg to carry. 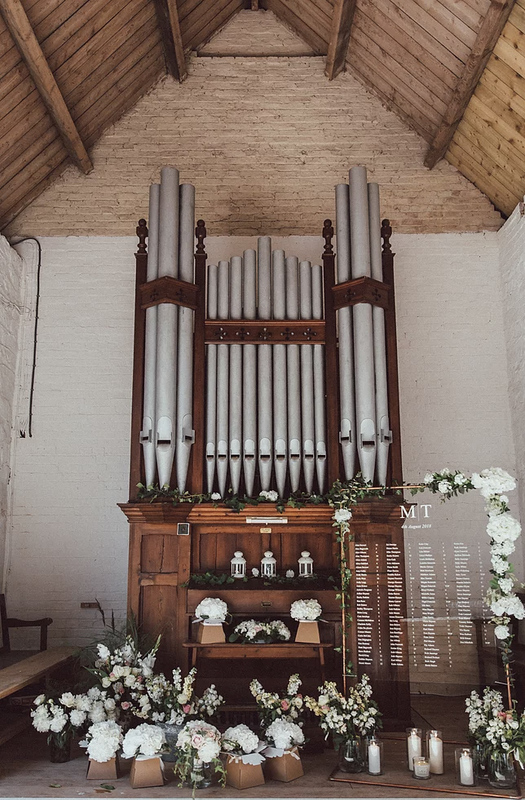 Longbourn Barn has plenty of unexpected features, here the Organ Room is perfect for displaying the bouquets, in addition to her bridal bouquet we created bouquets for Meg’s 6 stylish bridesmaids. 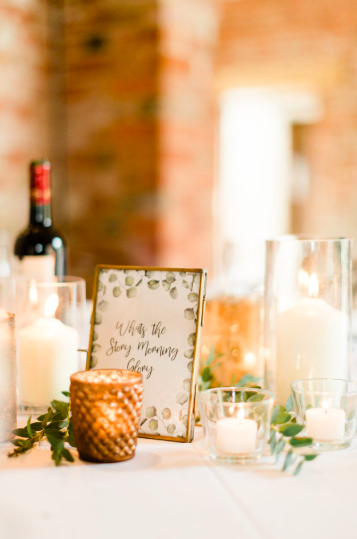 Pillar candles added to the romance perfect for this setting. 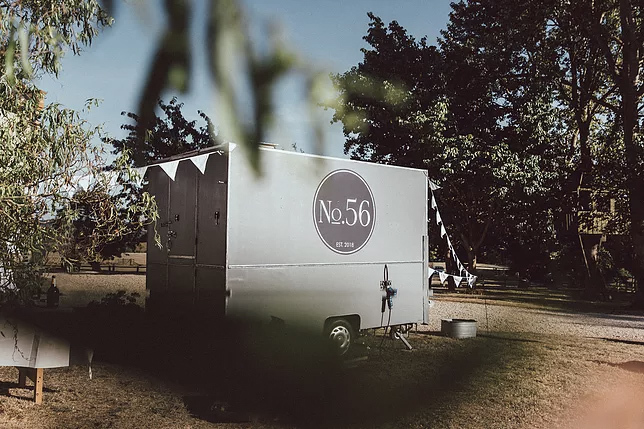 At our first site meeting we heard that Meg and her Mum were looking to create their own bar and had found an old pink van which they were going to transform into an amazing gin bar. 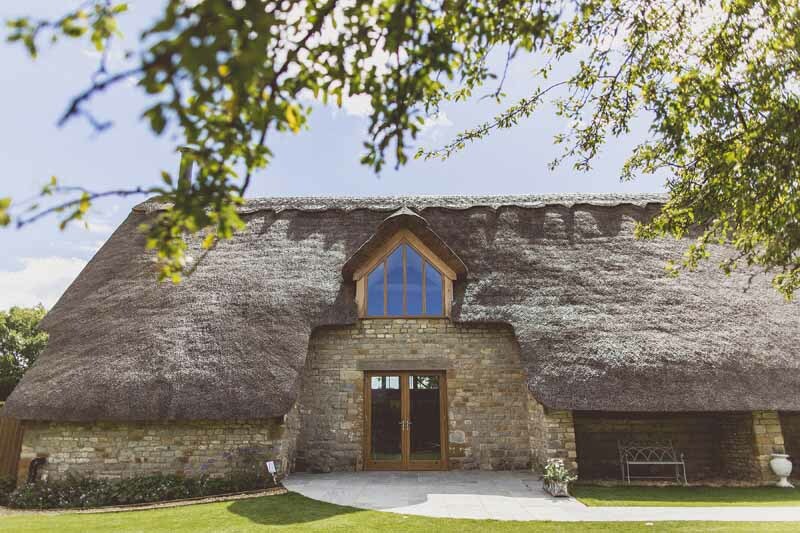 Little did we know at the time how epic this transformation was and that it would be featured on George Clarke’s Amazing Spaces. 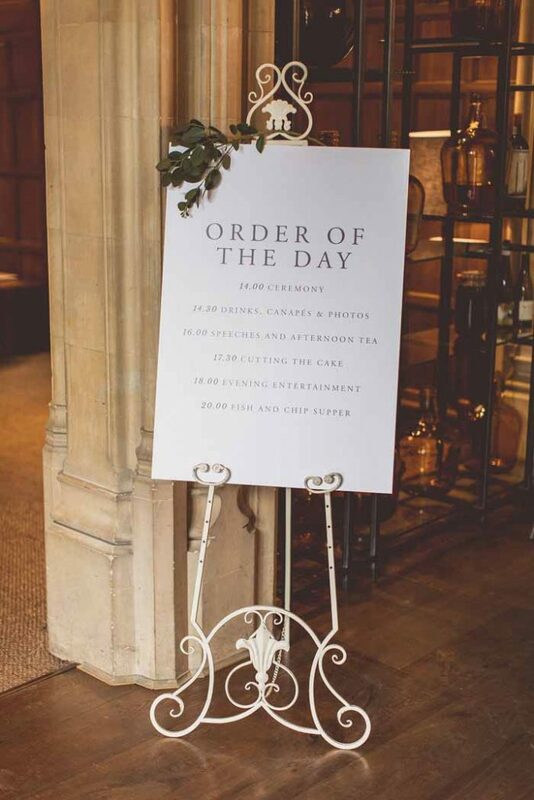 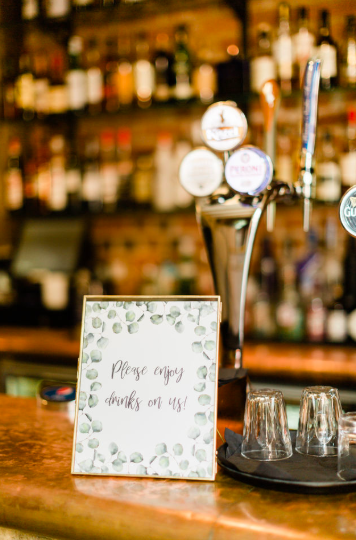 We were delighted to add some finishing touches to the look with the personalised sign from our sister site The Wedding of my Dreams. 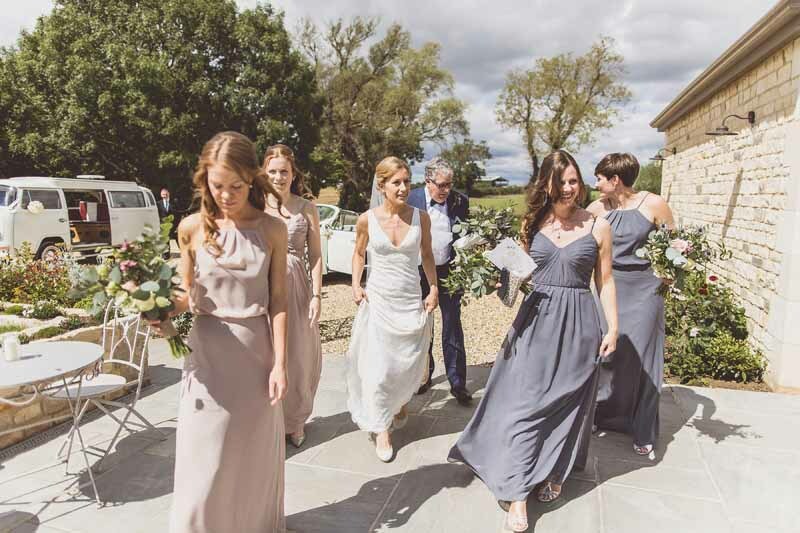 In the run up to the wedding Meg, Tom and the assembled team of helpers worked tirelessly to ensure nothing was left undone. 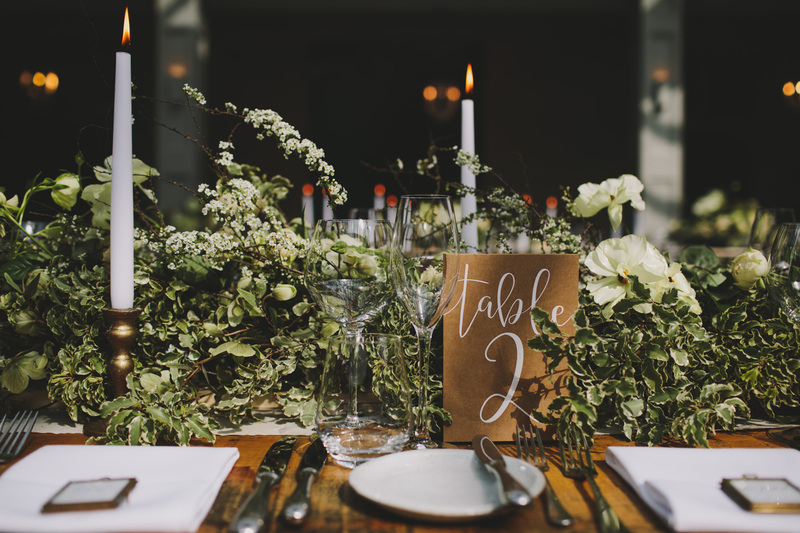 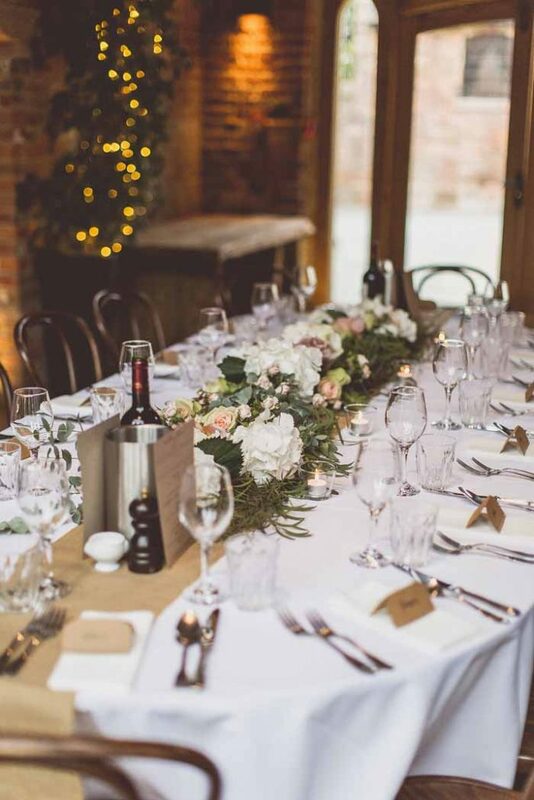 We just loved creating the florals for inside the barn including the table designs. The large barn could carry off large statement florals set on high rose gold risers. Elegant candle light was added to the tables and the round tables were set with lush florals around an elegant rose gold hurricane vase. 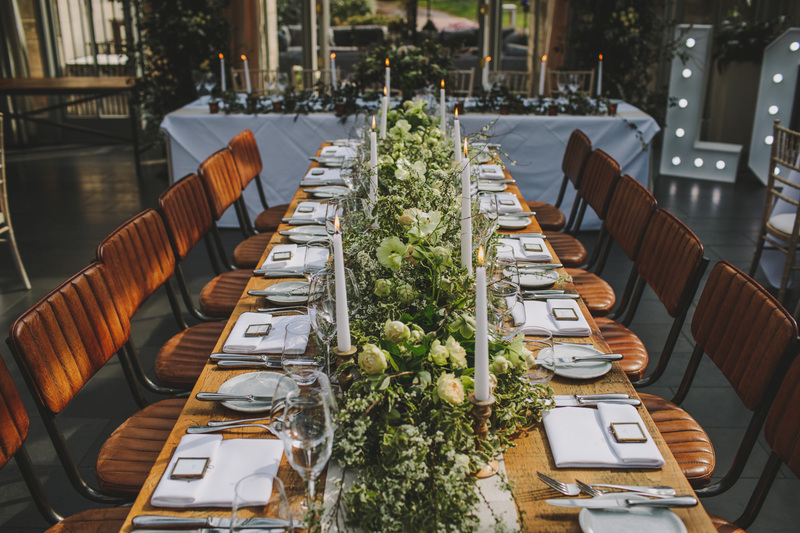 Meg had collected so many gorgeous pieces and the geometric marble chargers were a great look for the tables. 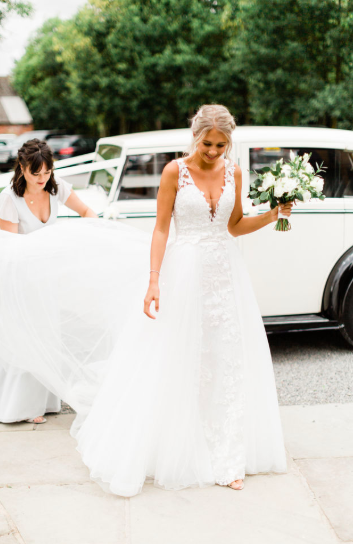 This epic wedding was full of surprises and we knew of one little secret that the bride and her mum had kept from everyone. 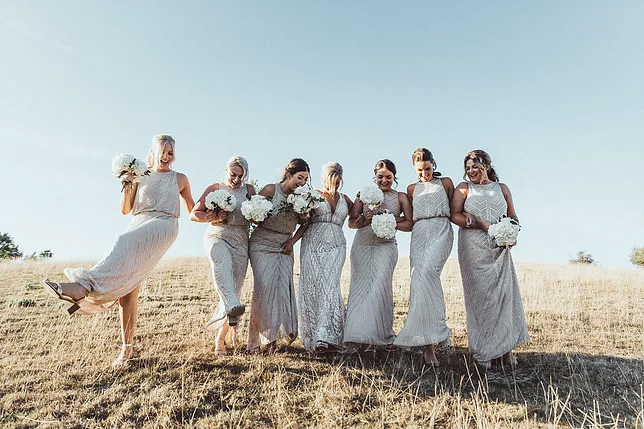 Meg had not one but two stunning wedding gowns and totally rocked the world when she surprised everyone when she walked down from the hay loft in her second amazing dress. 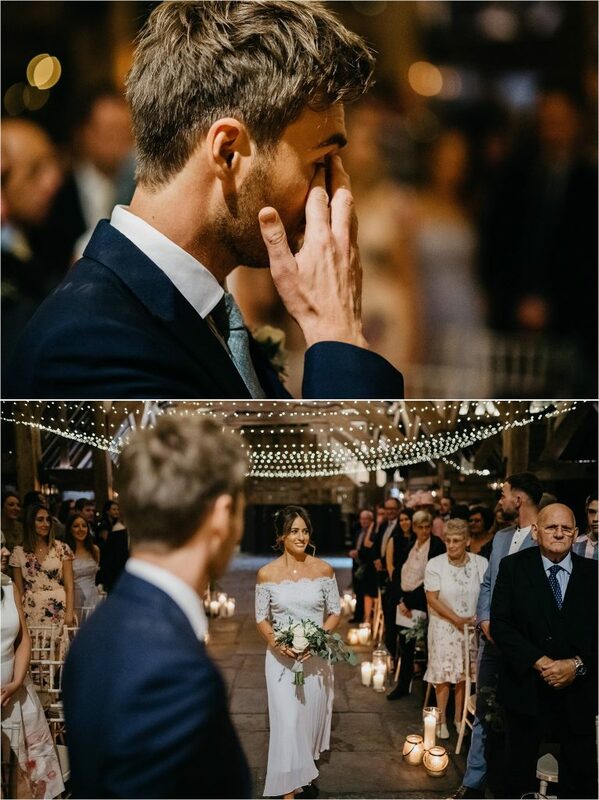 This brought tears of joy to everyone’s eye and the party started in earnest. 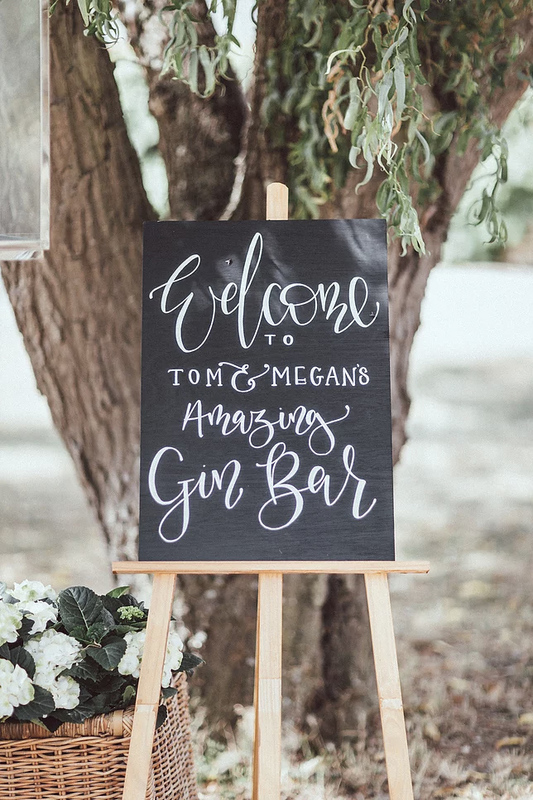 The acrylic wedding seating plan was set as a welcome for guests once inside the barn and enabled everyone to find their seat with ease and style. 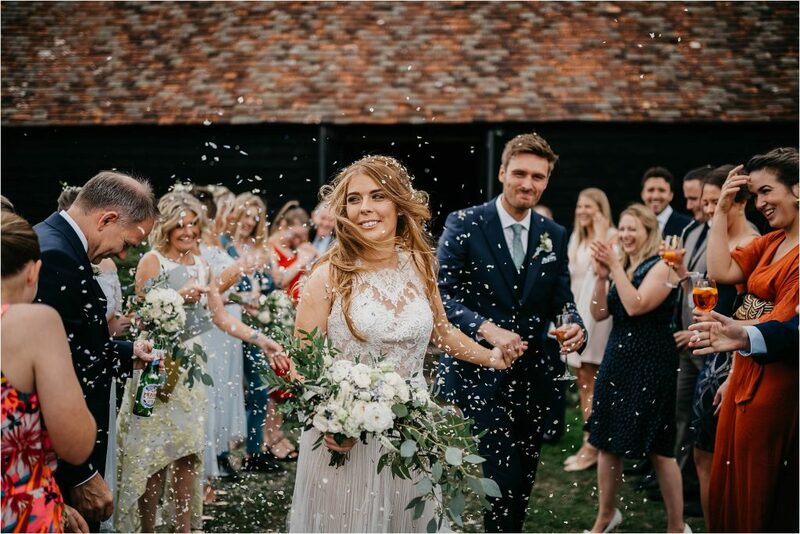 It was a pleasure to create the flowers for your wedding at Longbourn Barn, you rocked your day and are the most beautiful couple. 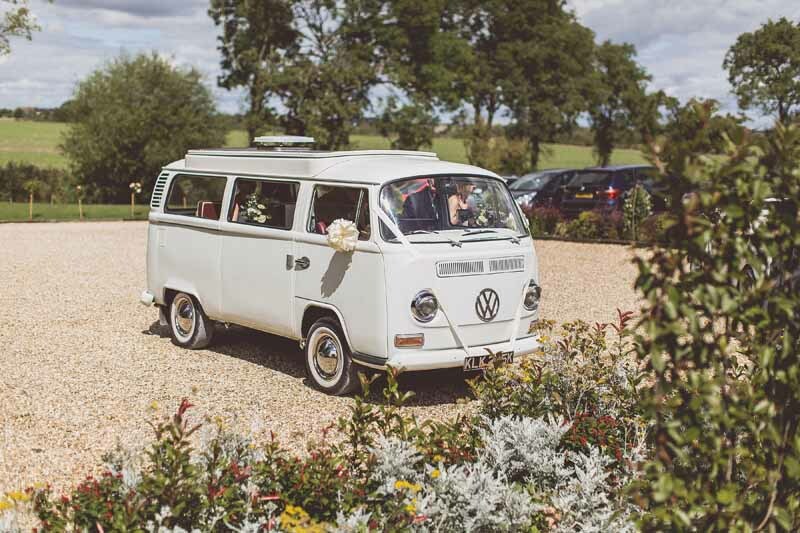 Sacha and Stu planned a relaxing day for family and friends at Blackwell Grange. 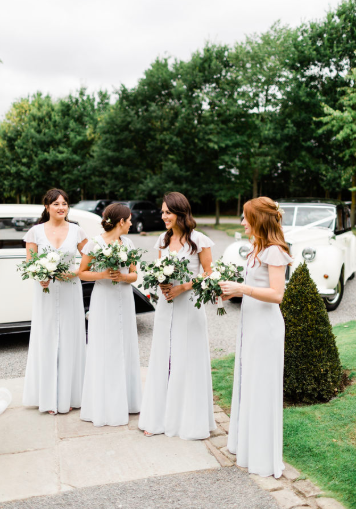 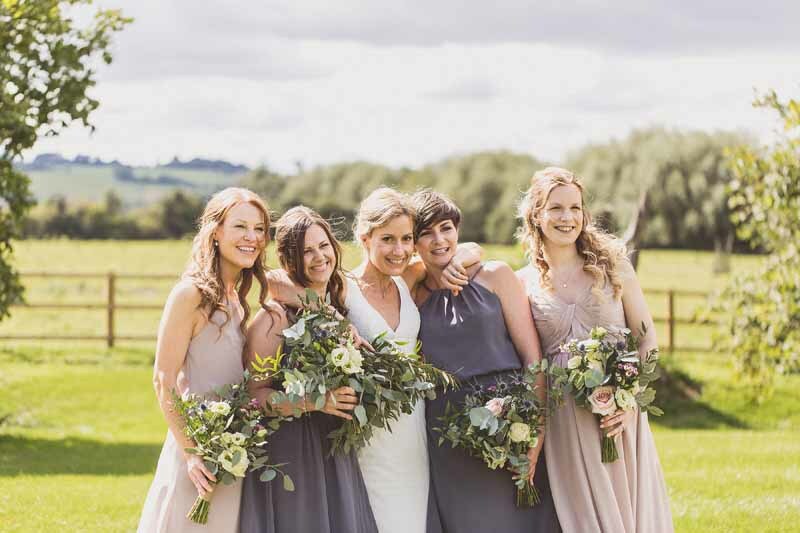 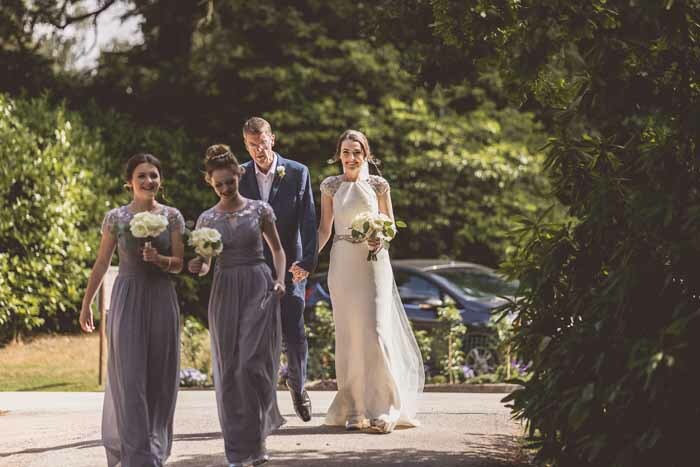 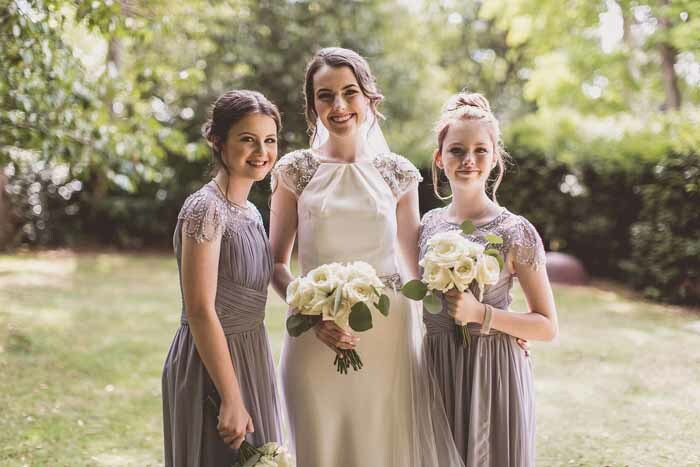 The bride wore an elegant gown with her maids in charcoal grey and vintage rose dresses. 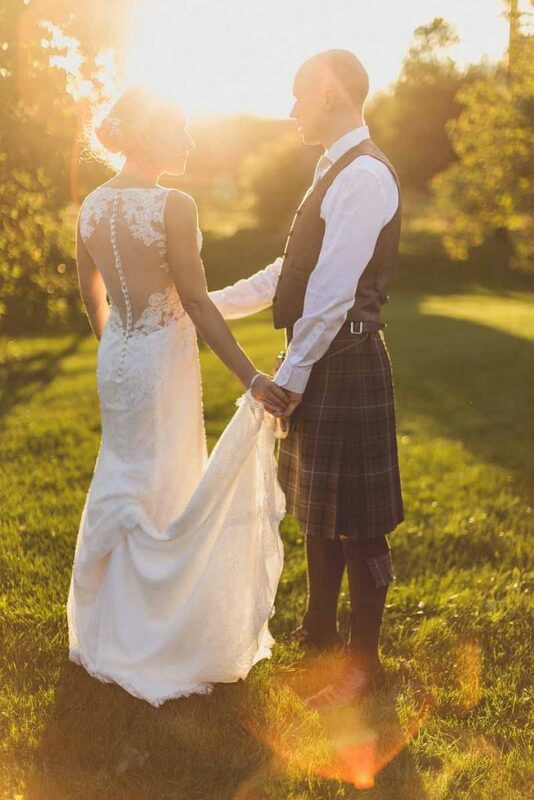 Stu looked splendid in this kilt and we introduced thistles into the bouquets and button holes as a nod to the tartan. The bouquets were loose foliage inspired bouquets with thistle, lisianthus,roses, veronica and wax flower for different textures and tones. 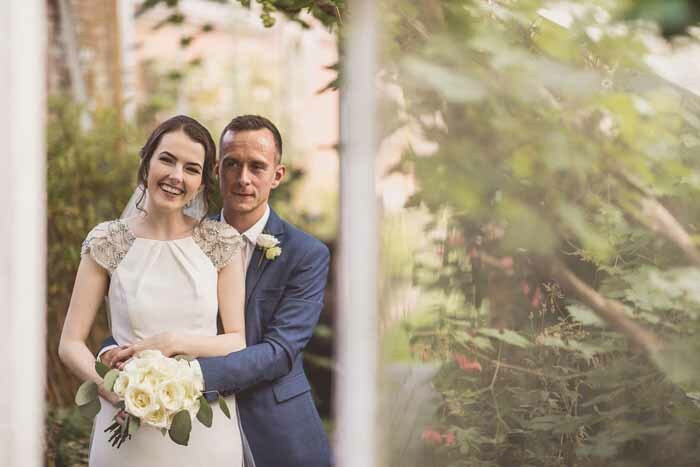 The button holes were a relaxed mix of blooms from the day with twine to finish. 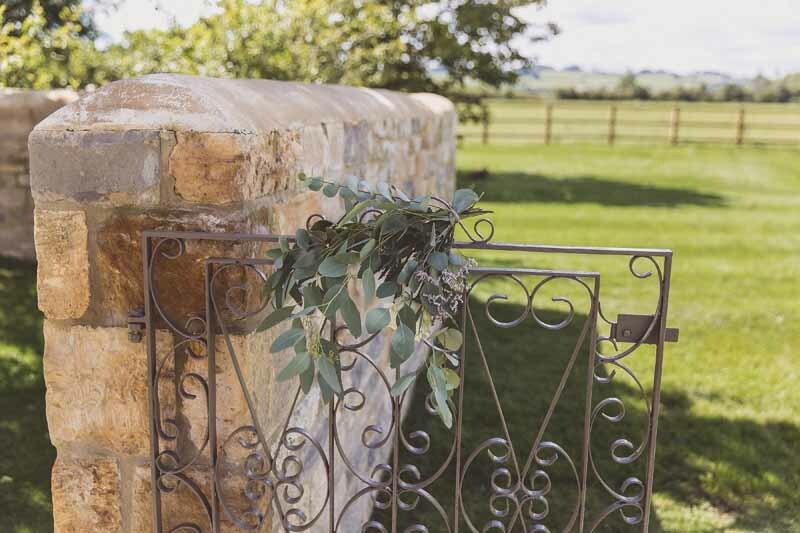 Touches of eucalyptus were tied to the entrance gates to continue the relaxed, laid back look. 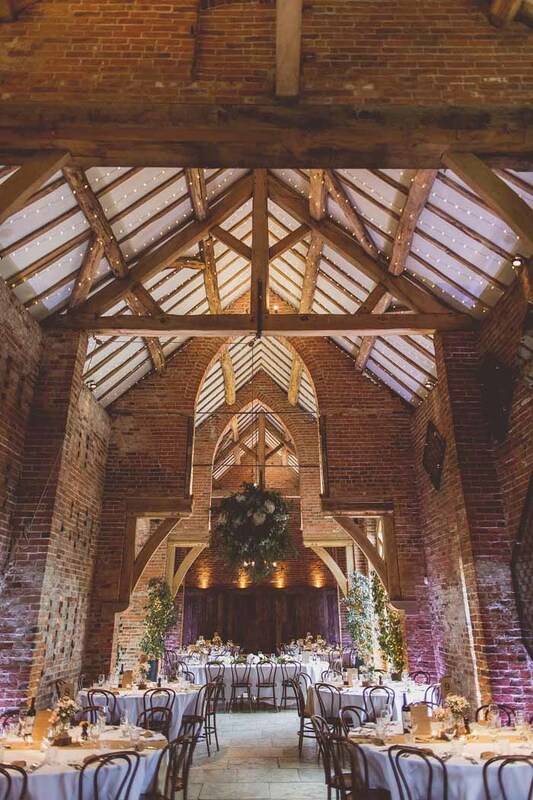 The Thatch Barn at Blackwell Grange is a great place to tie the knot with its stone walls and wooden beams. 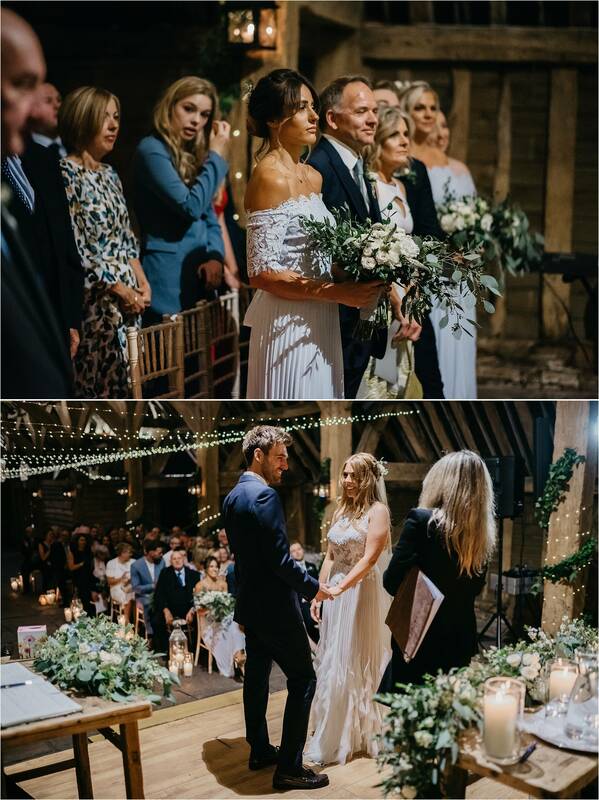 The Barn suits very natural flowers and foliage and we designed relaxed arrangements in tall bronze vases to frame the ceremony and foliage garlands to drape the table. Keeping to a very natural relaxed look large arrangements greeted guests at the entrance set in rustic milk churns. The tables were dressed with a mix of centrepieces with natural foliage and flowers in bronze gold containers. 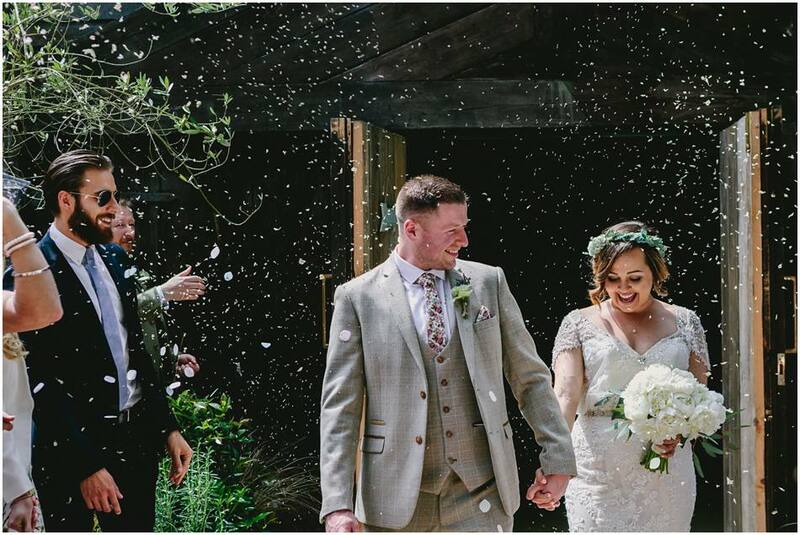 We loved creating the flowers for Sacha and Stu and being part of their wedding day. 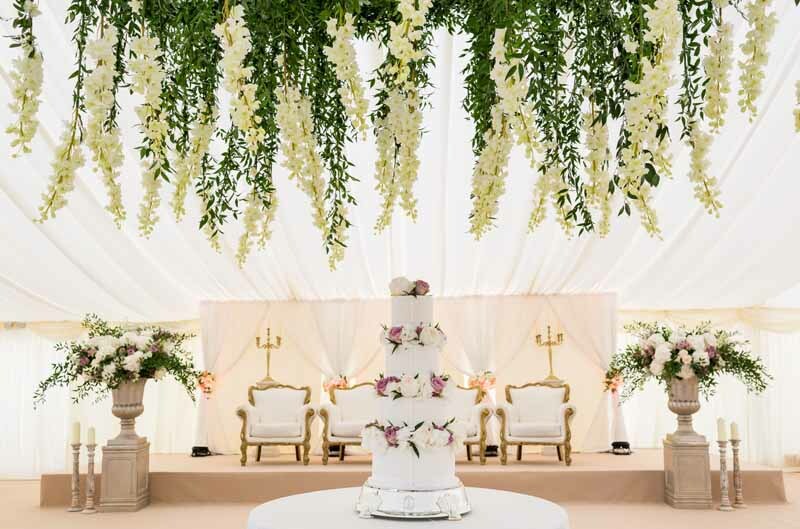 Stoneleigh Abbey in Warwickshire is a stunning wedding venue and combined with a marquee offers a flexible space for large weddings. 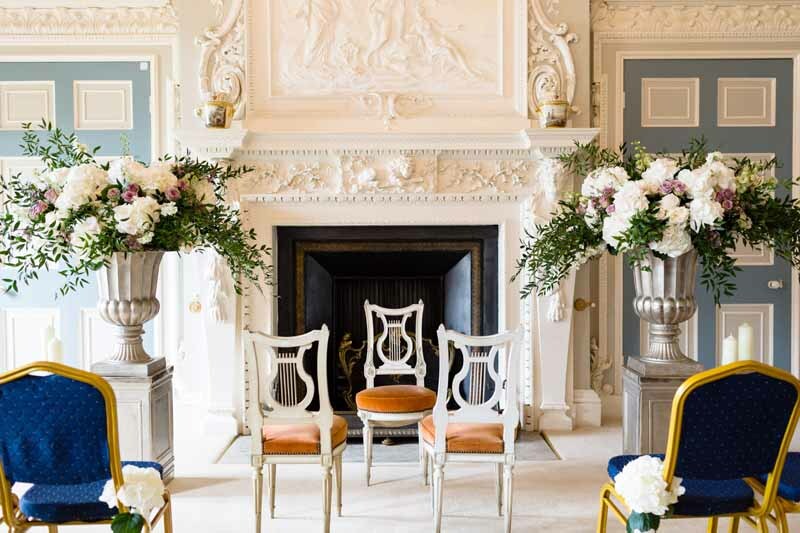 The Salon looks beautiful with large urns and elegant candlesticks framing the fireplace. 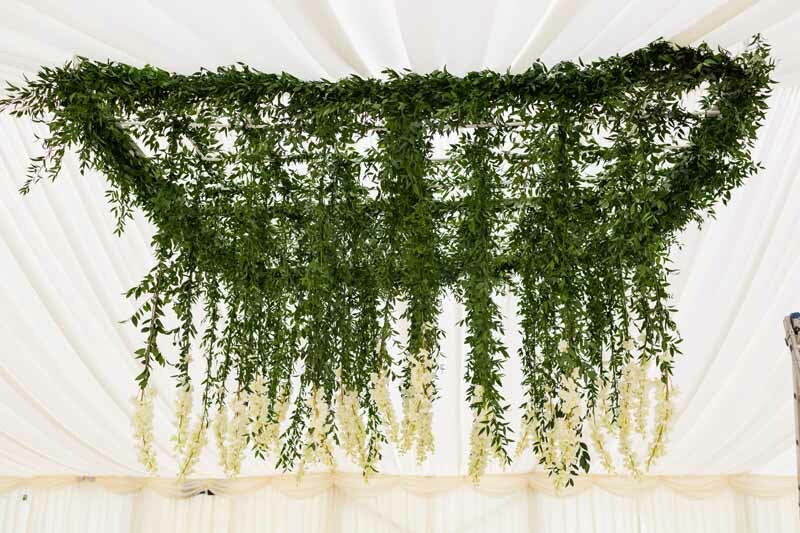 For large marquee wedding, Stoneleigh Abbey Wedding a hanging installation is a great WOW FACTOR piece. 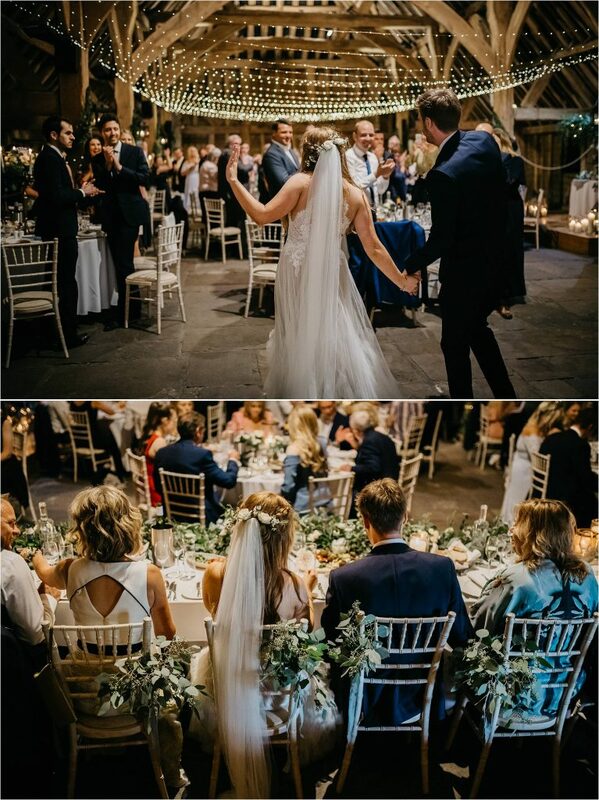 Set over the dance floor it can be enjoyed throughout the evening. 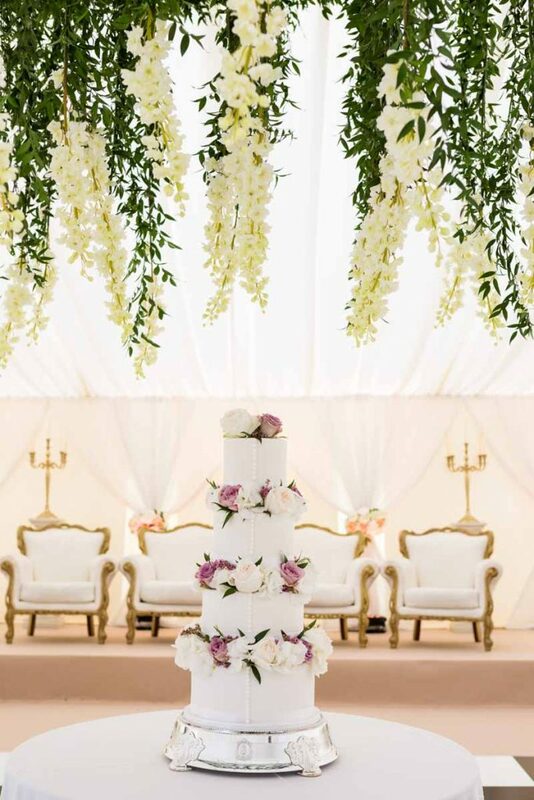 Here a stunning cake was set centre stage with hanging delphiniums for a romantic touch.